In 2006, Greg Forbes Siegman helped a stranger he met in an elevator. 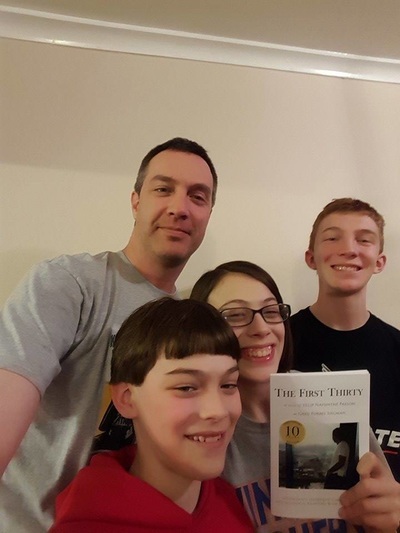 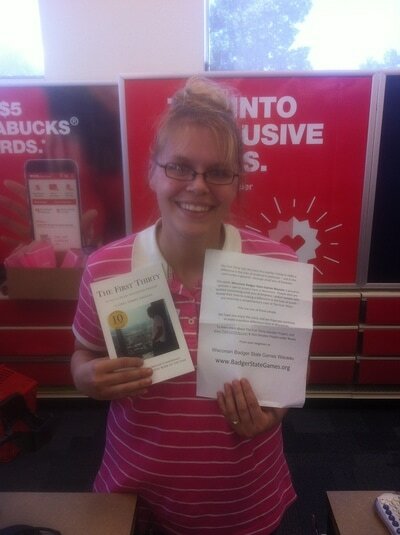 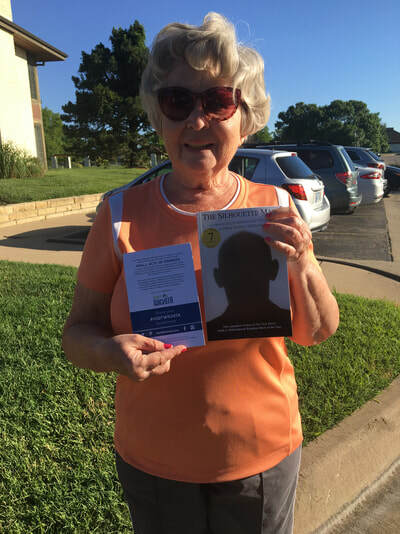 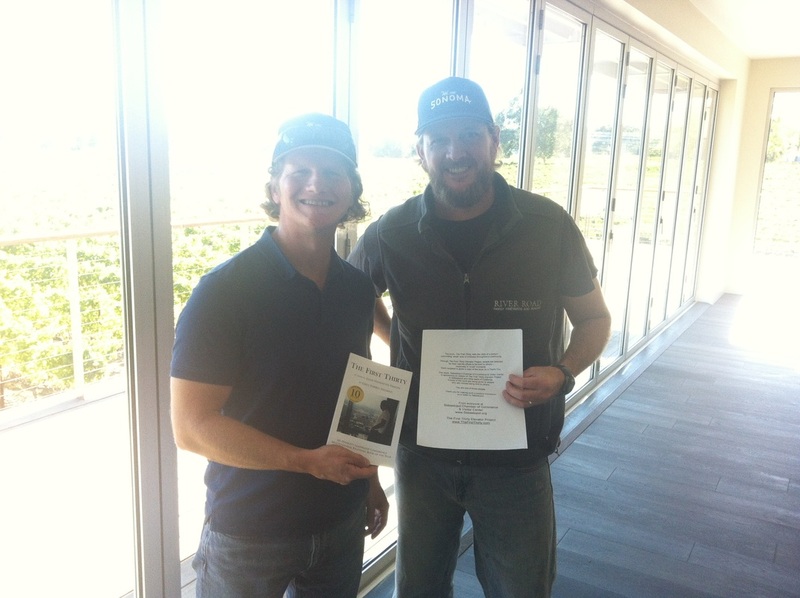 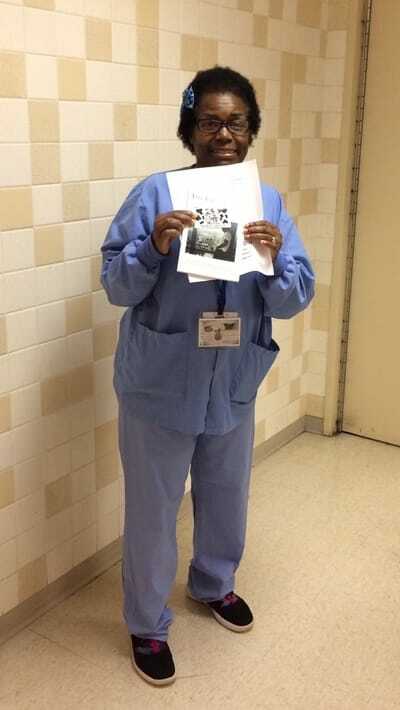 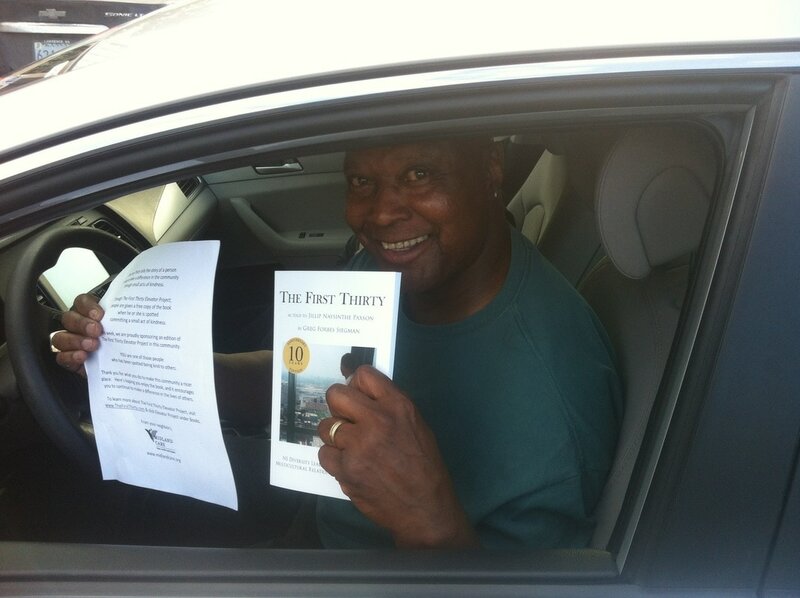 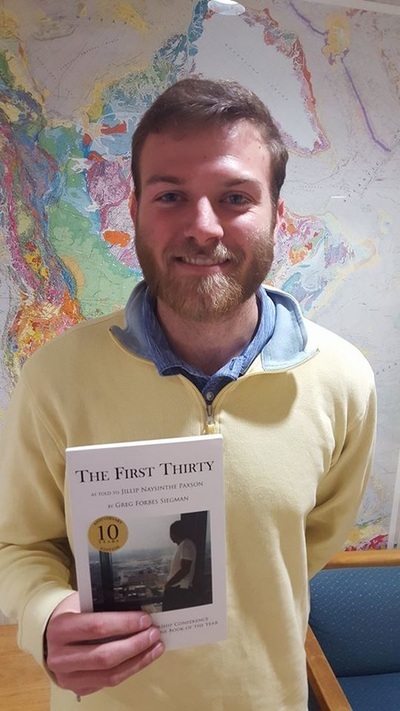 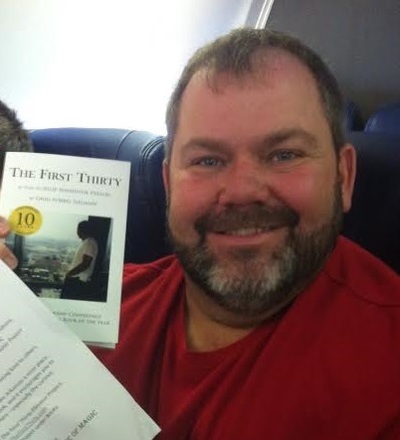 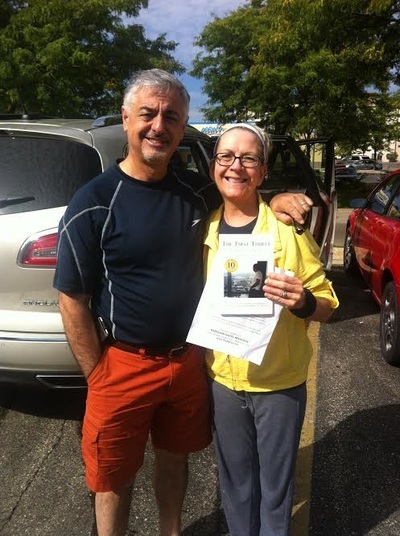 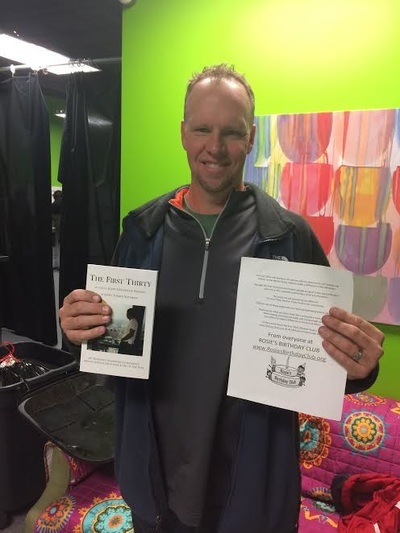 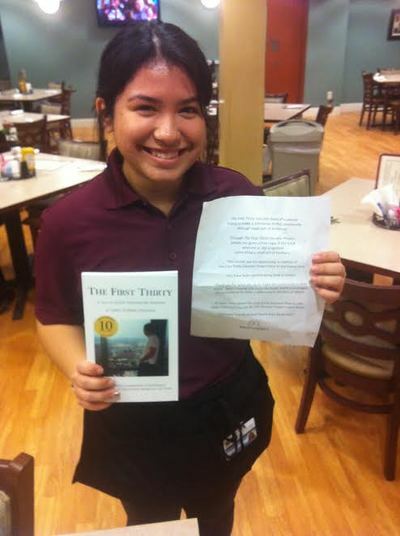 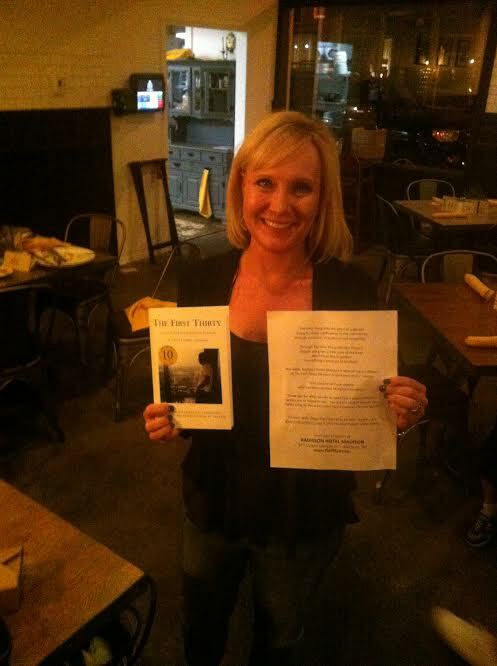 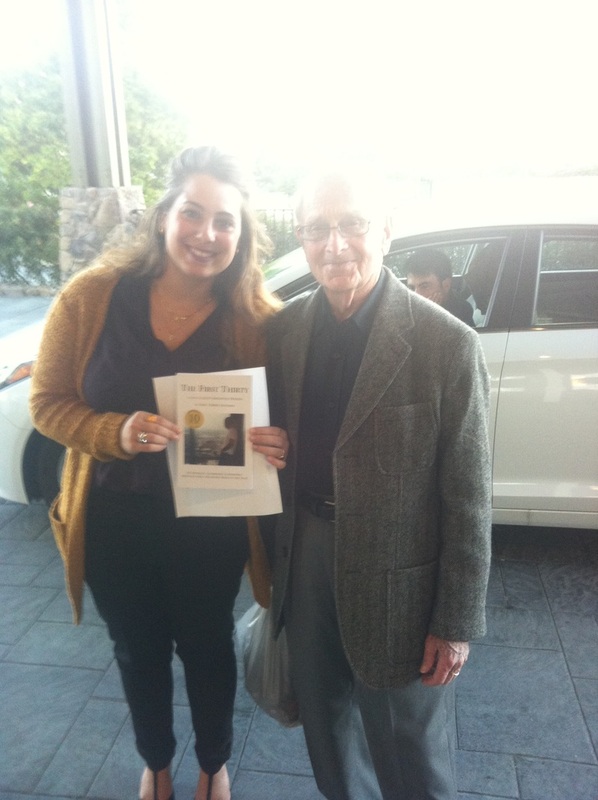 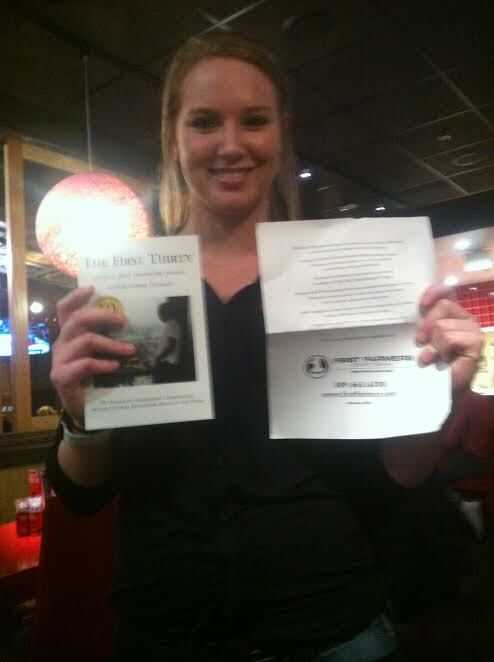 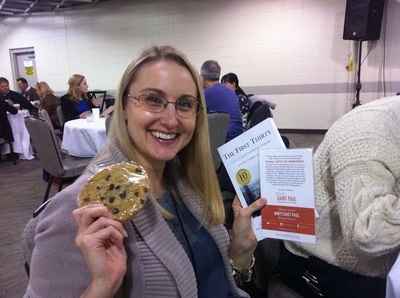 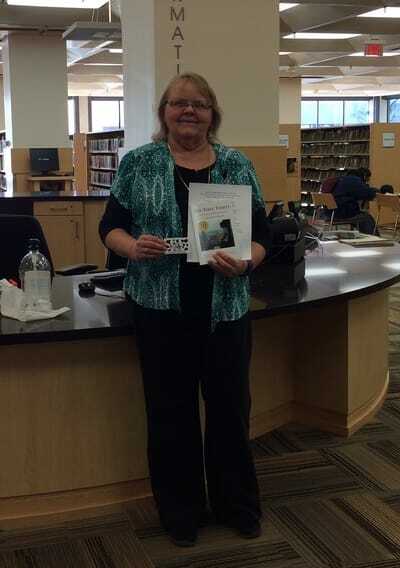 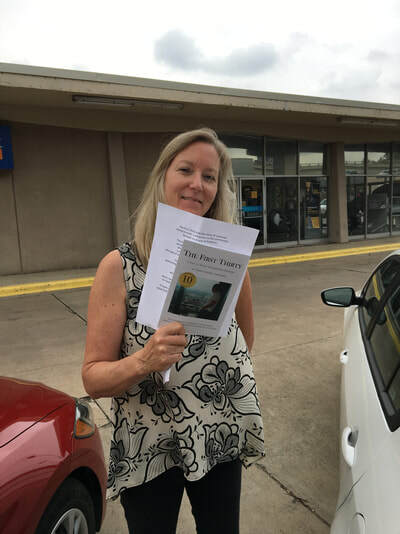 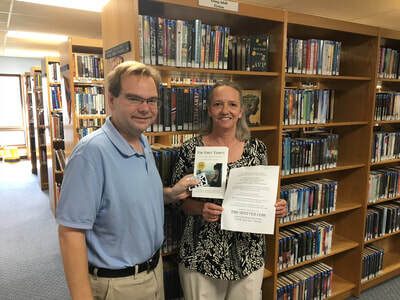 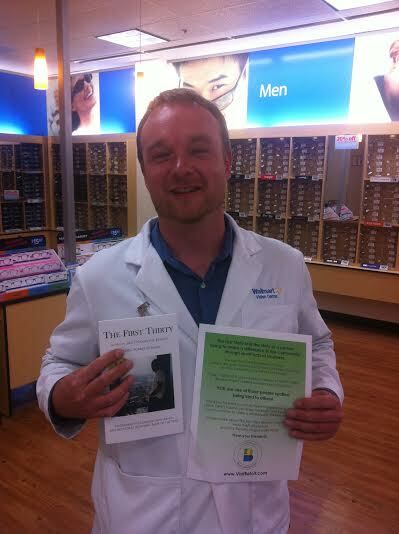 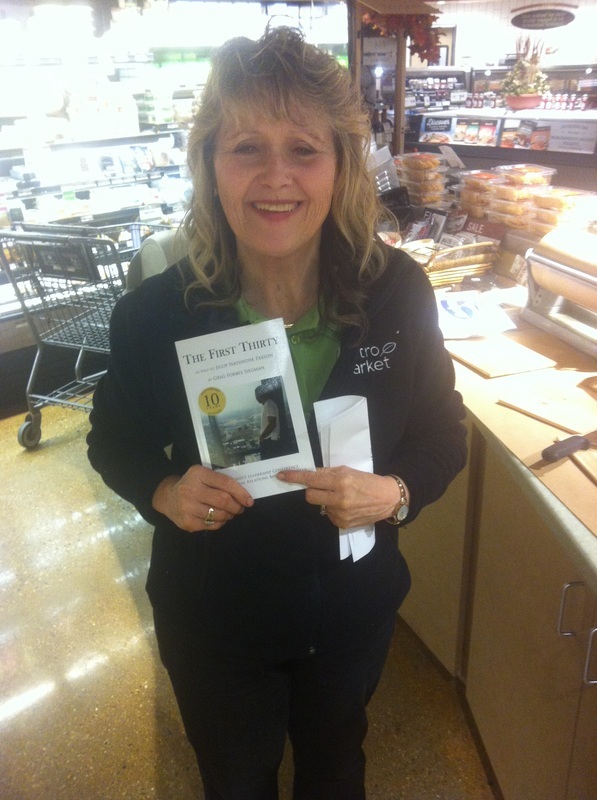 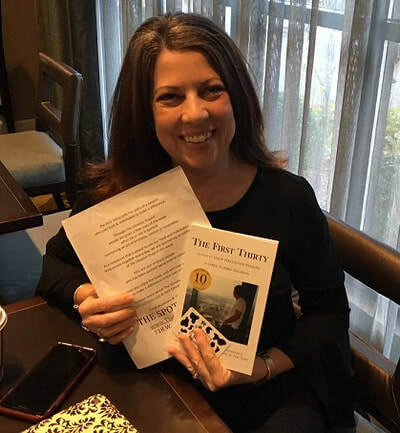 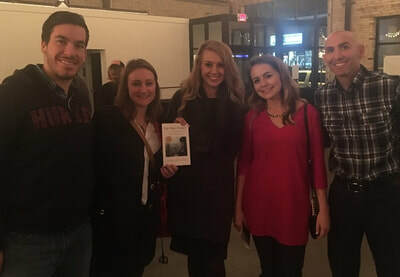 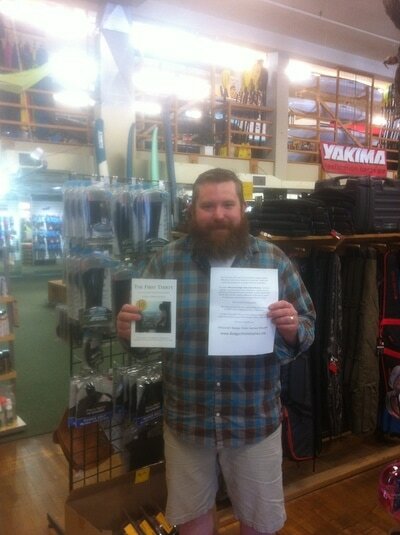 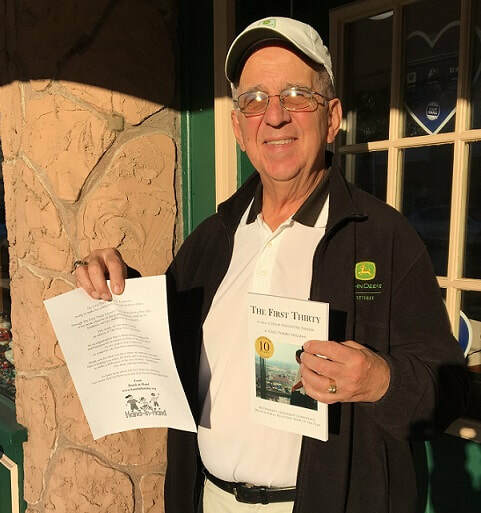 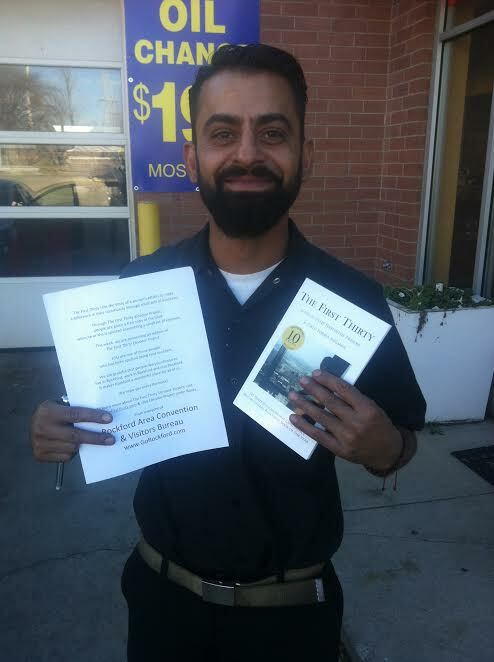 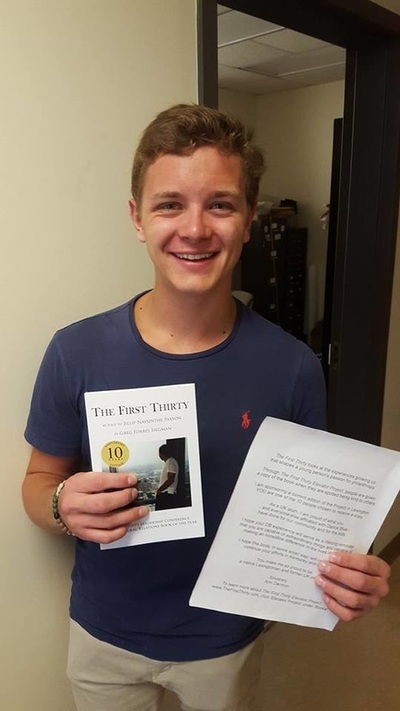 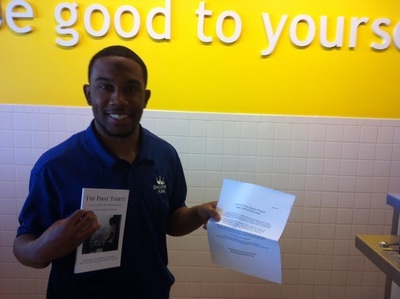 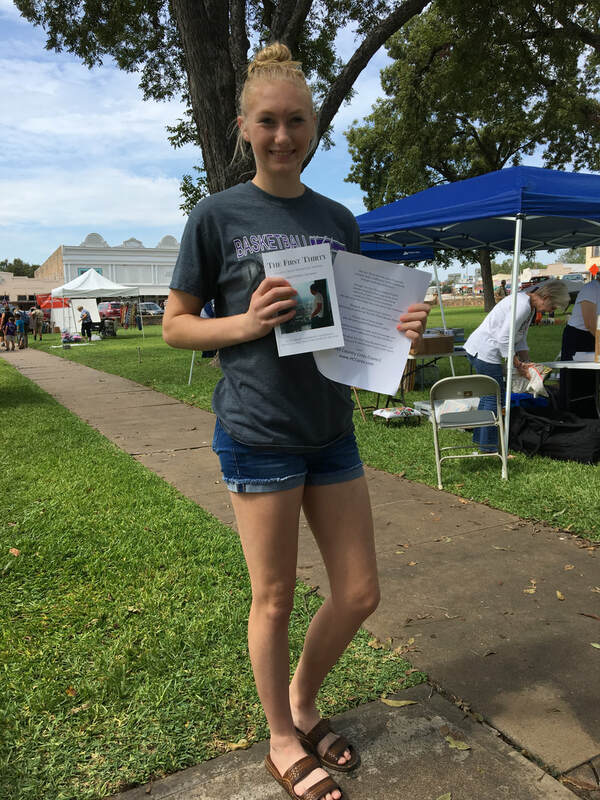 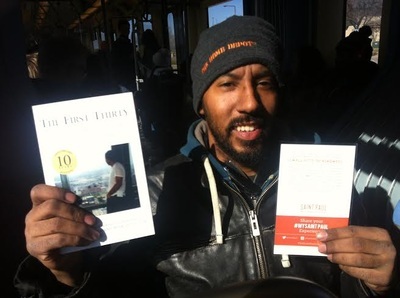 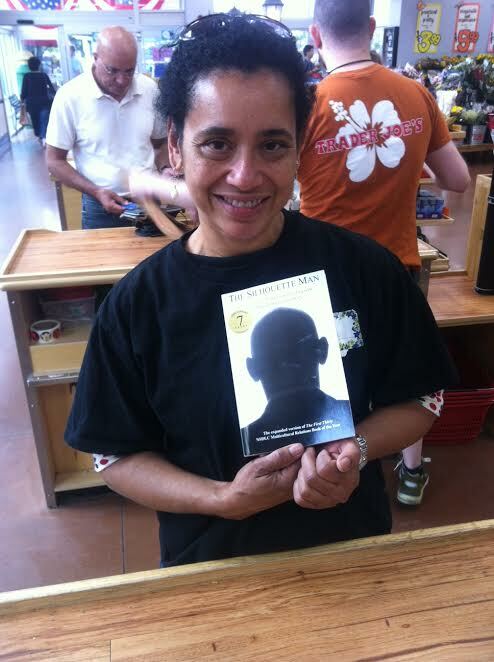 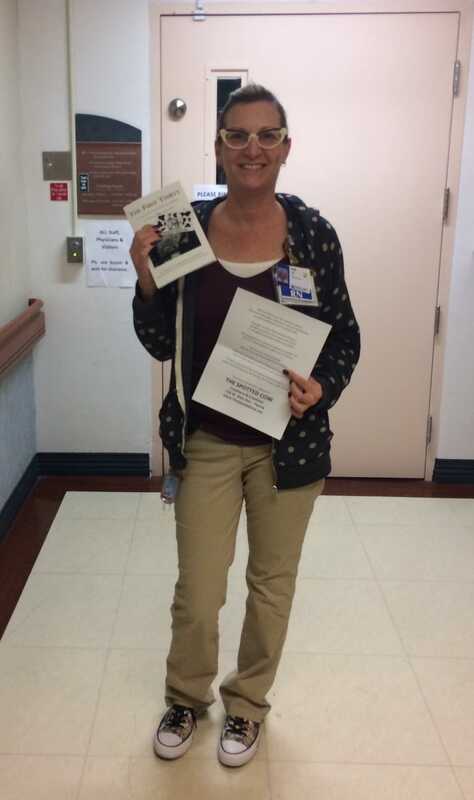 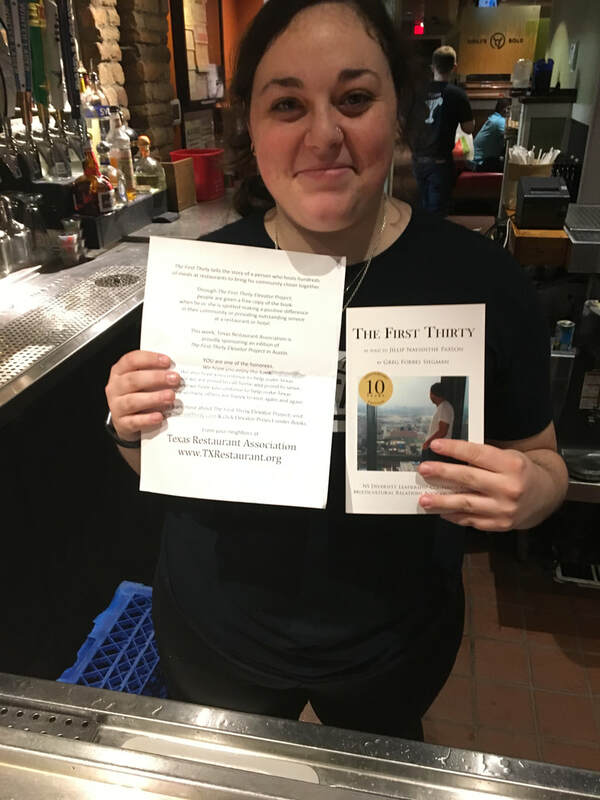 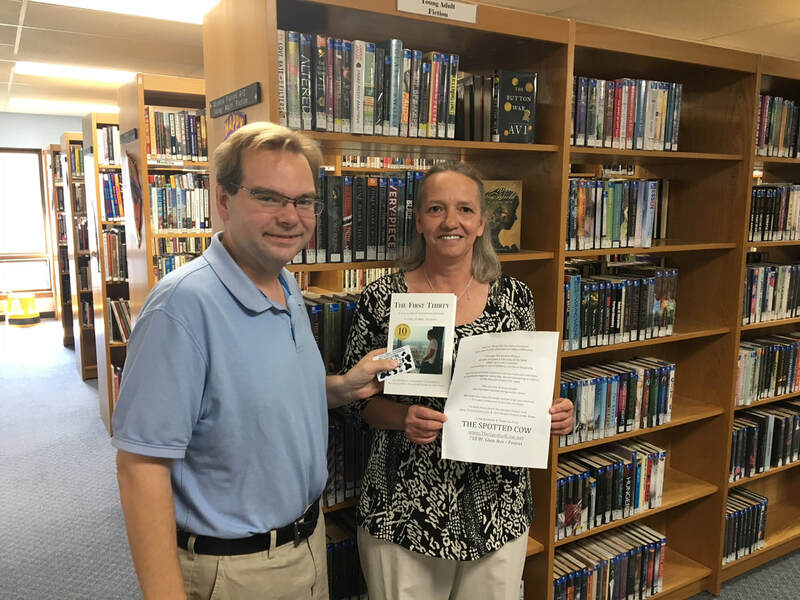 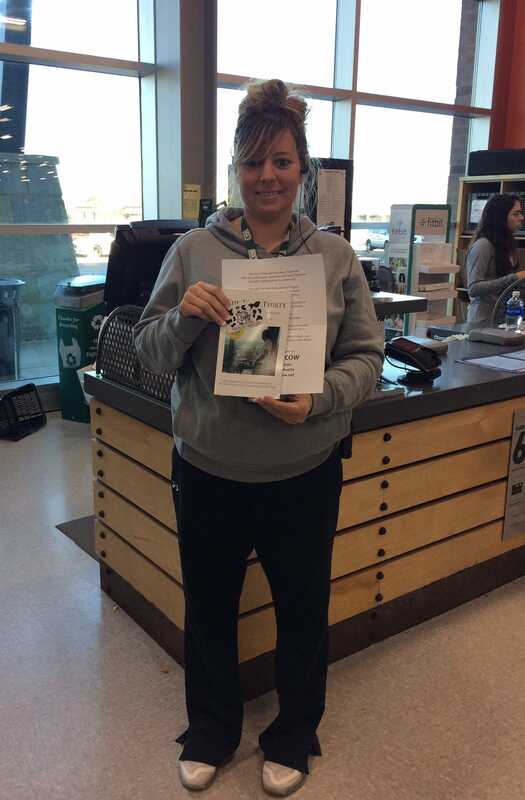 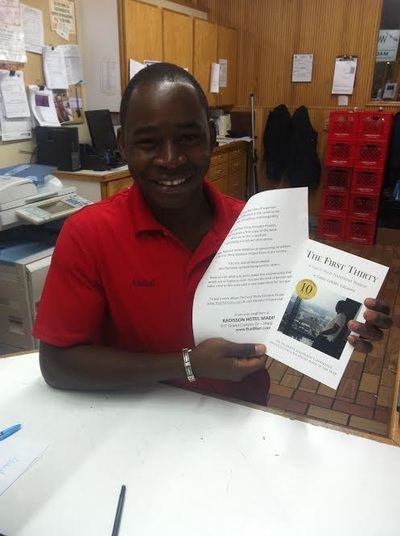 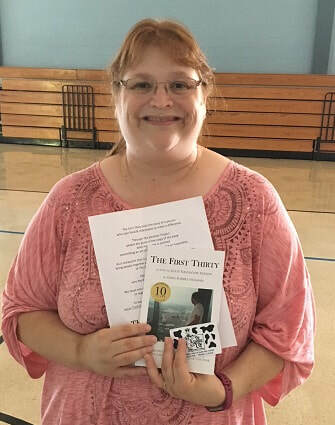 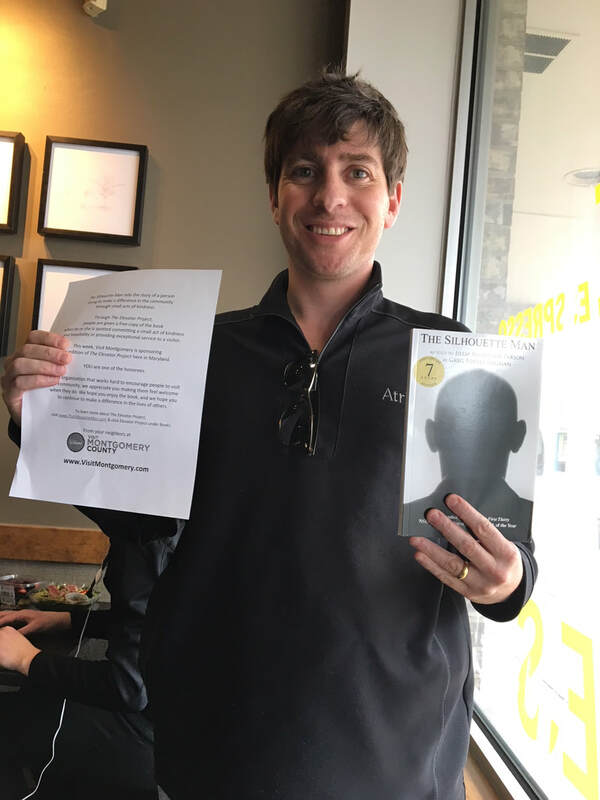 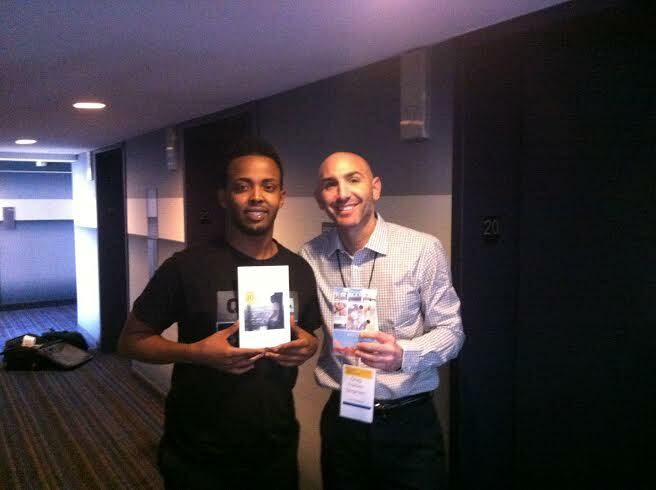 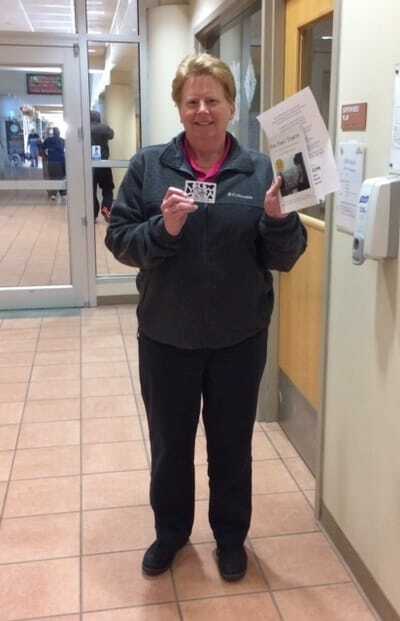 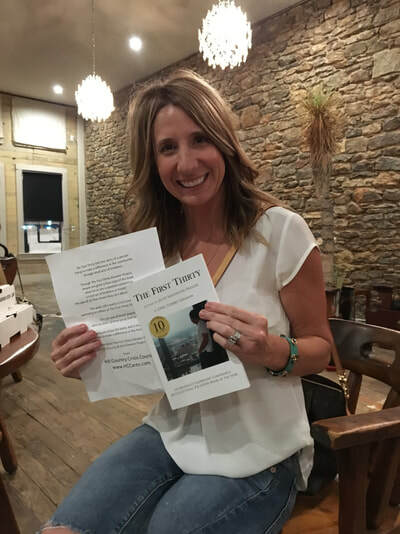 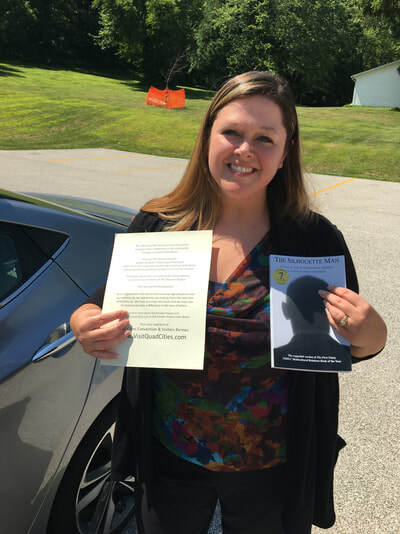 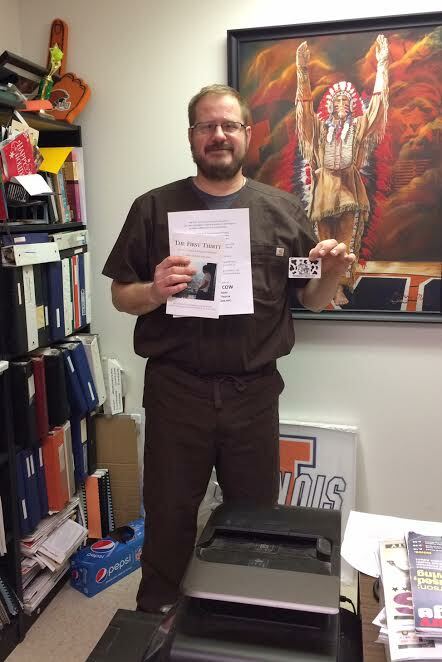 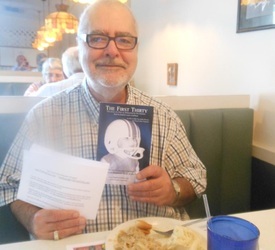 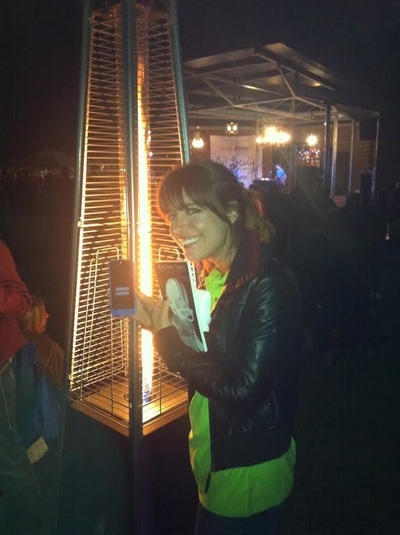 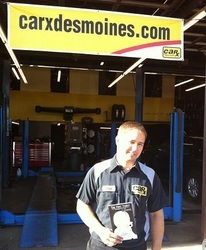 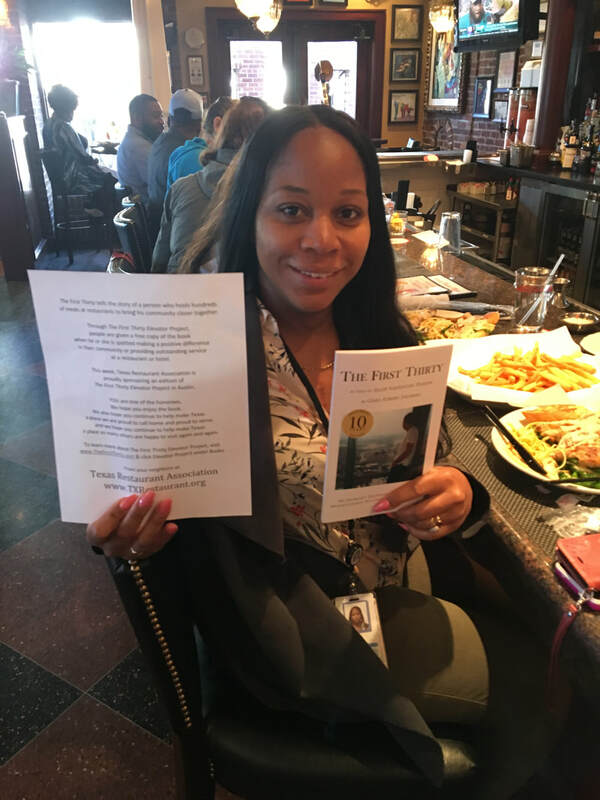 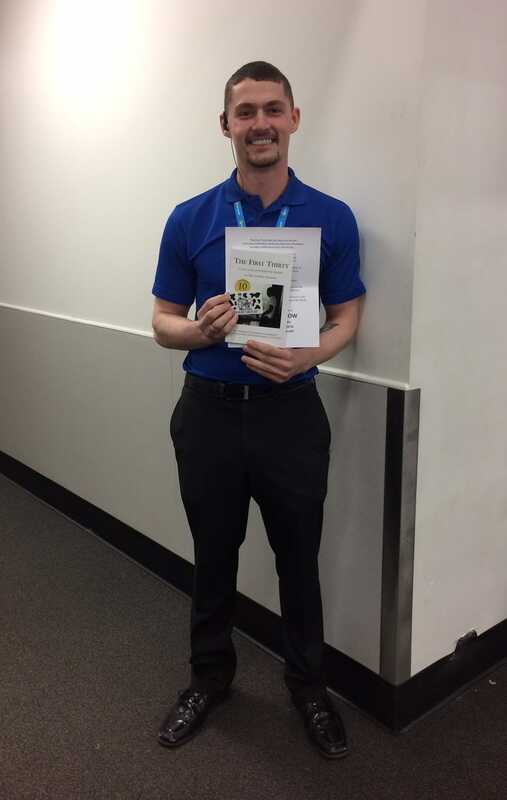 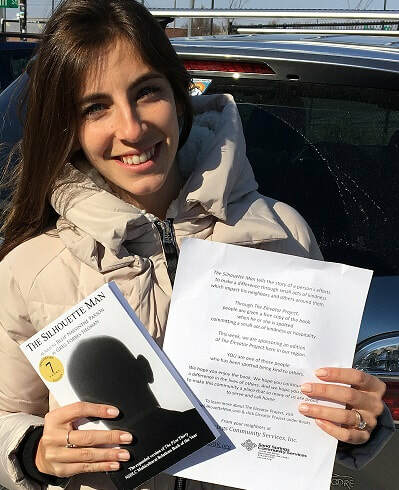 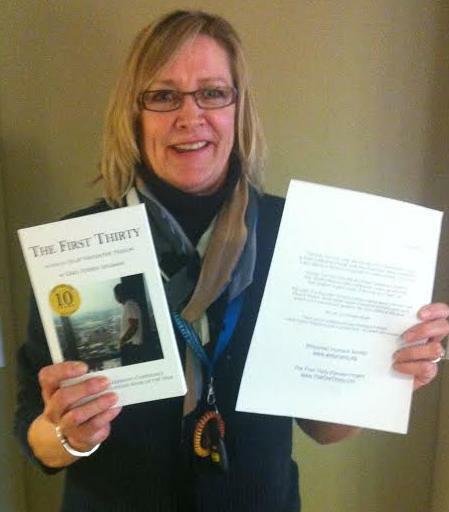 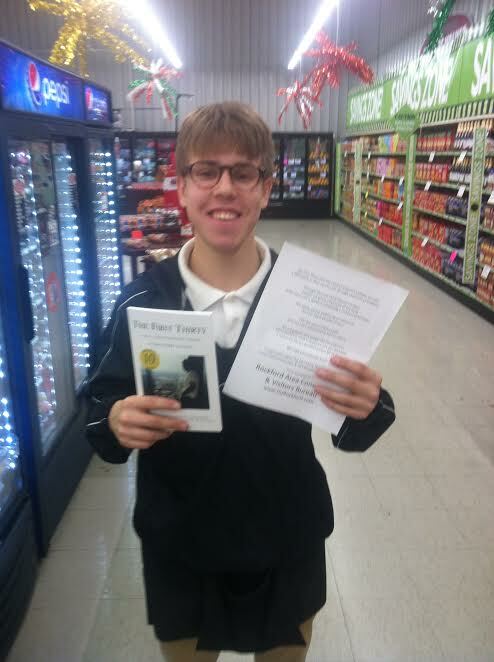 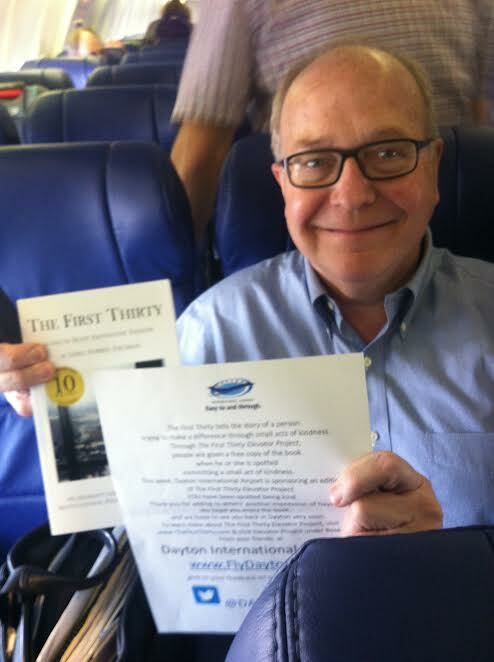 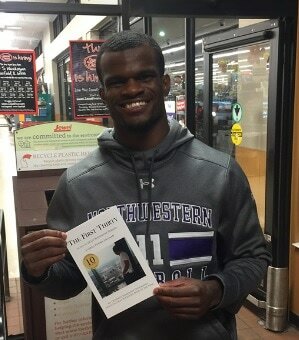 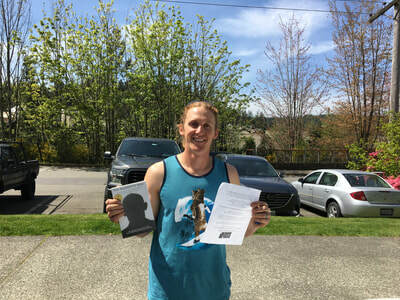 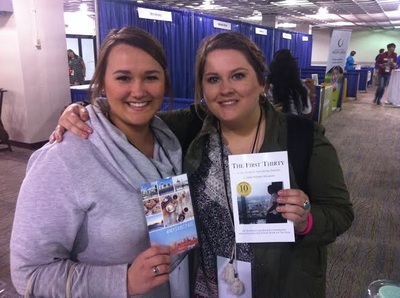 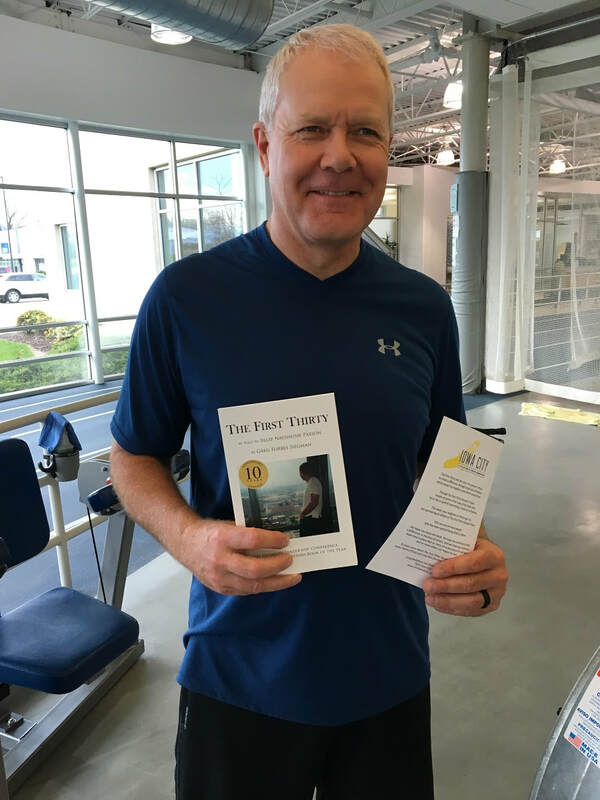 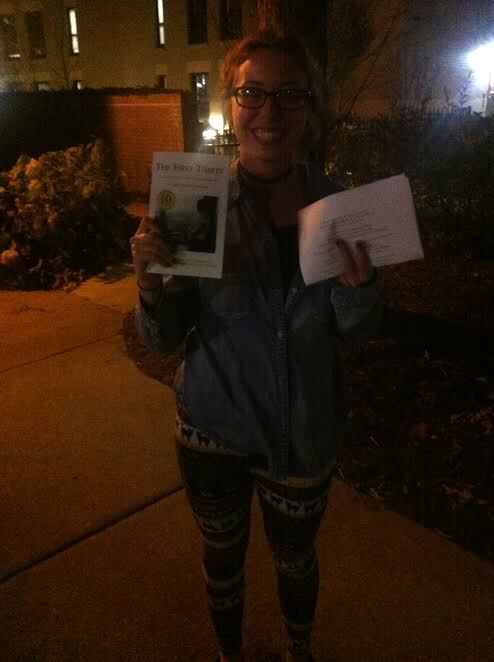 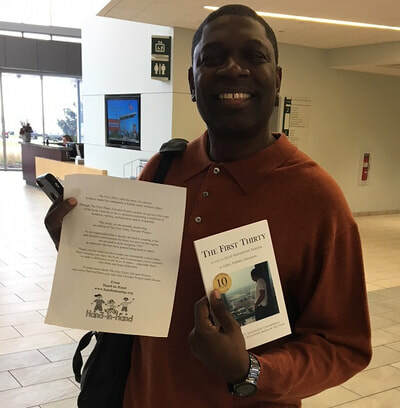 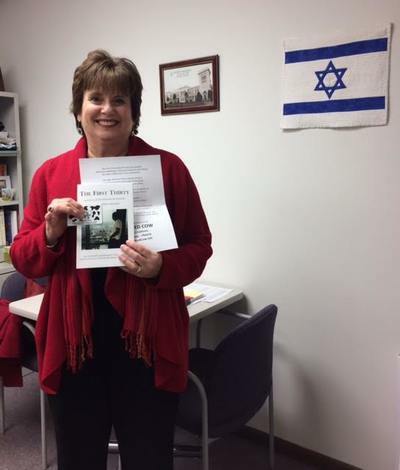 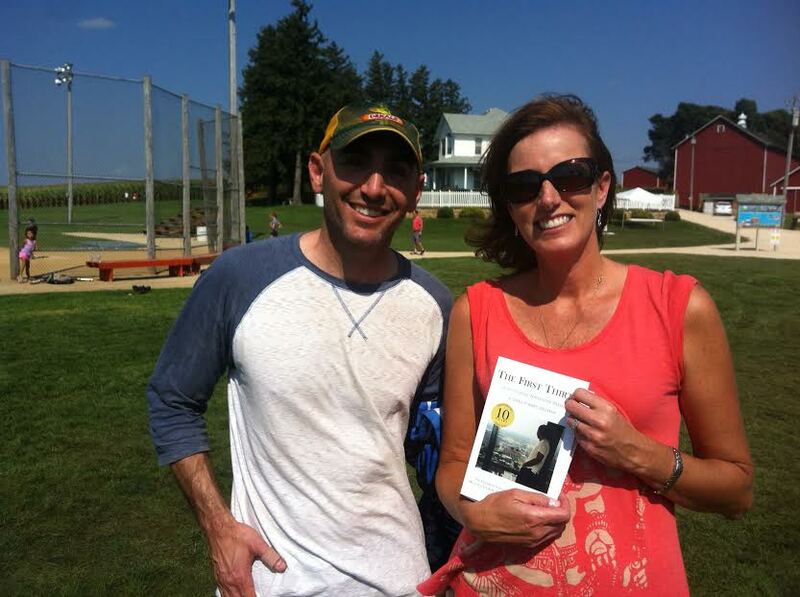 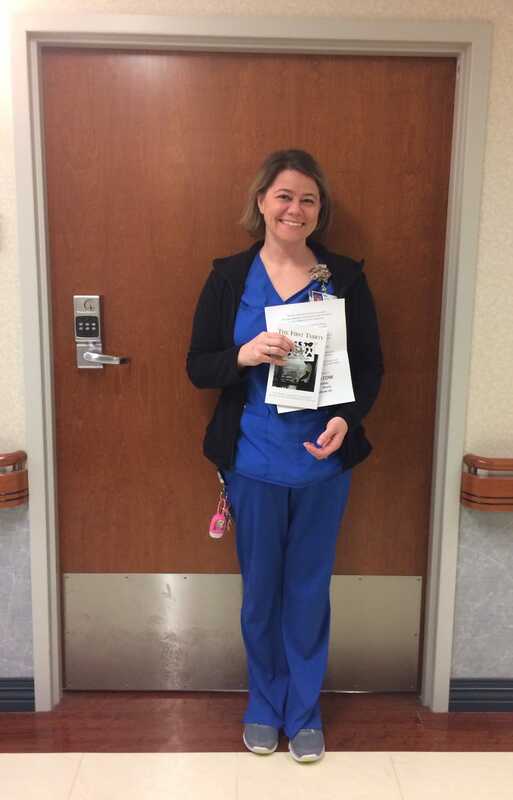 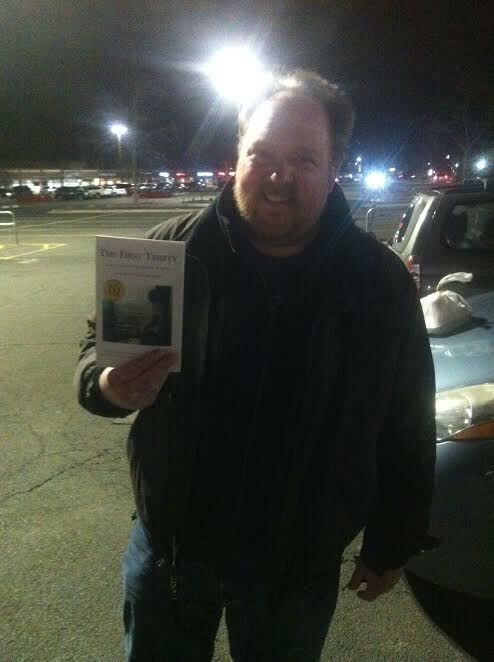 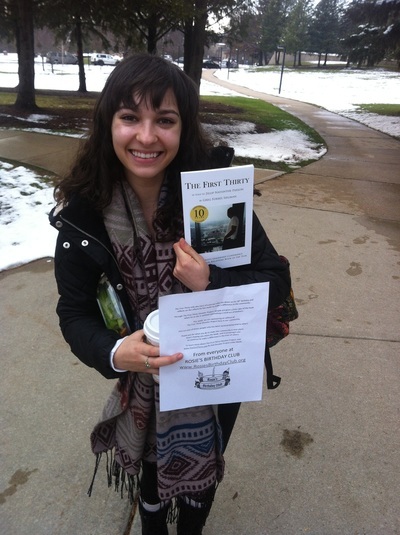 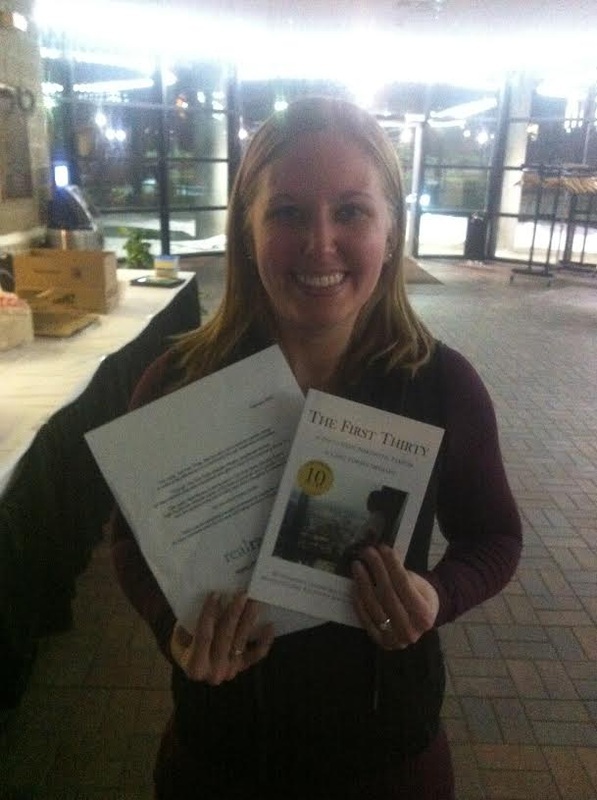 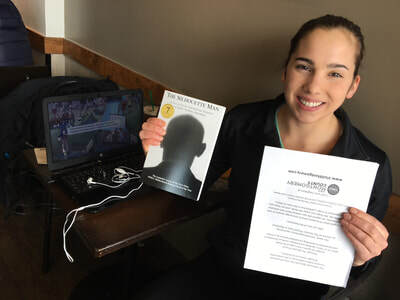 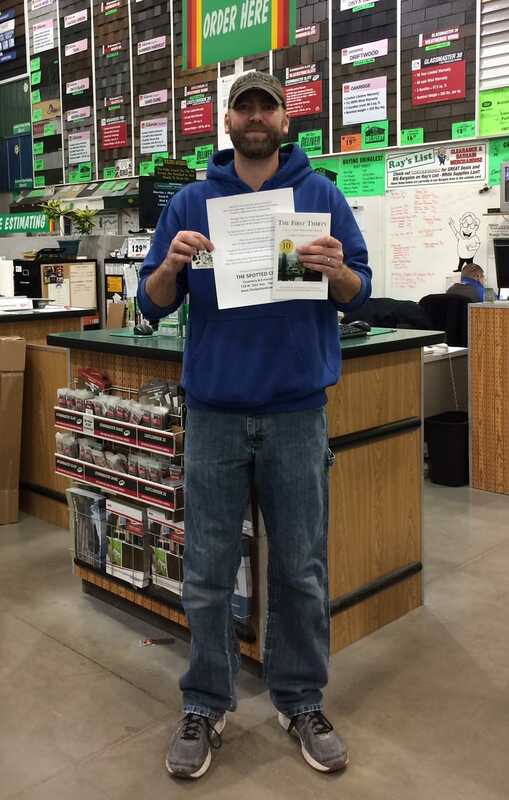 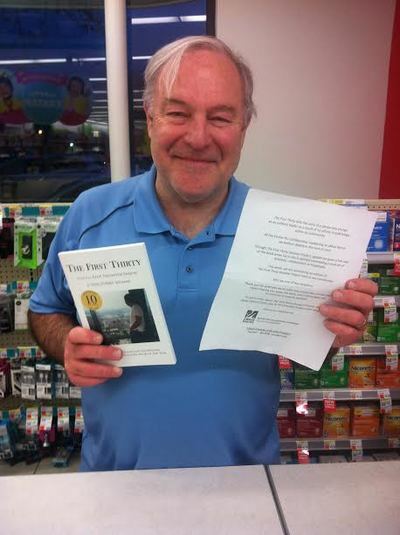 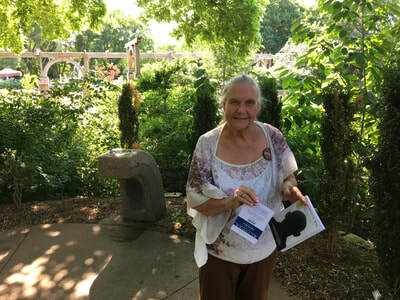 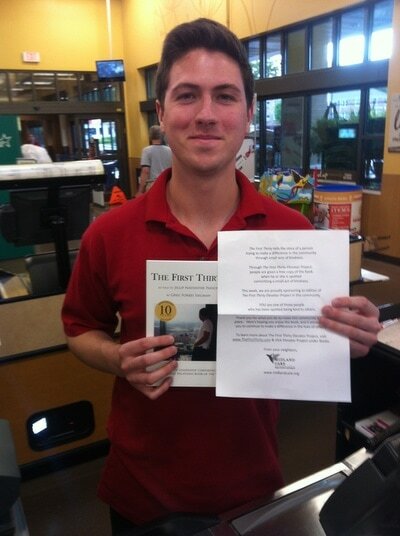 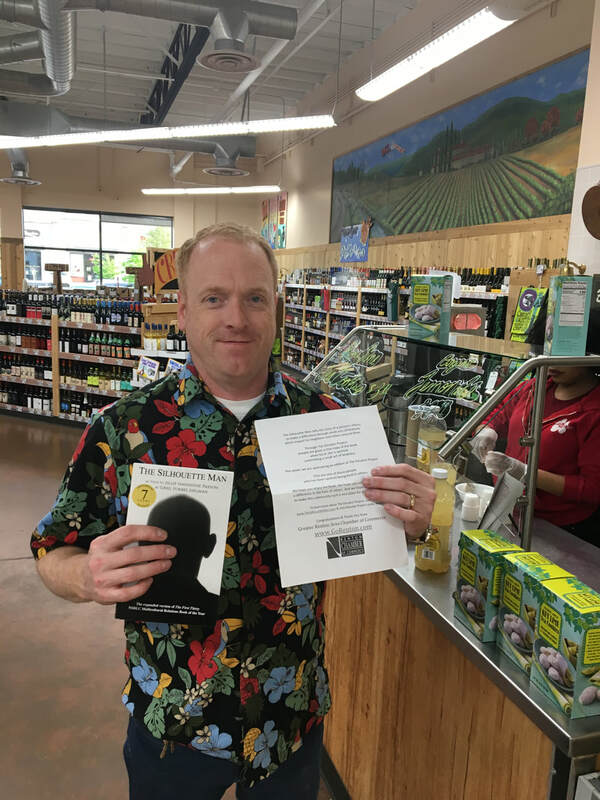 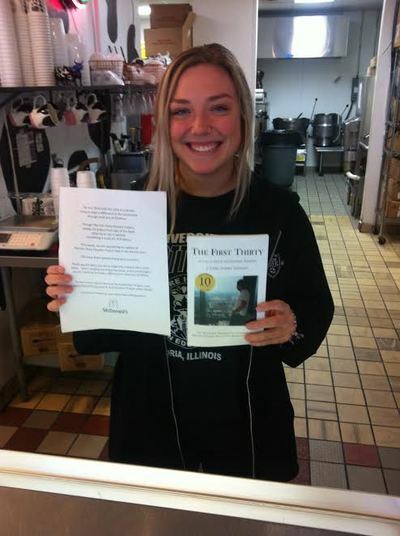 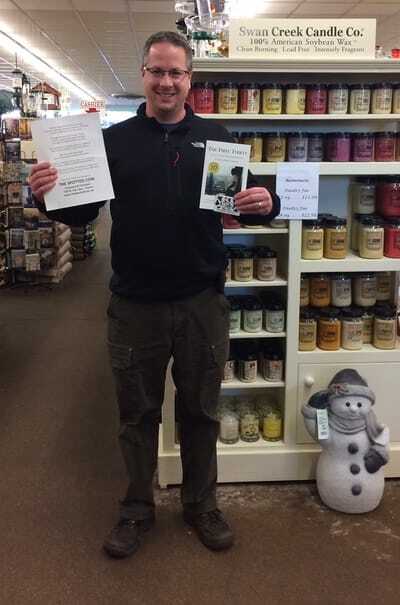 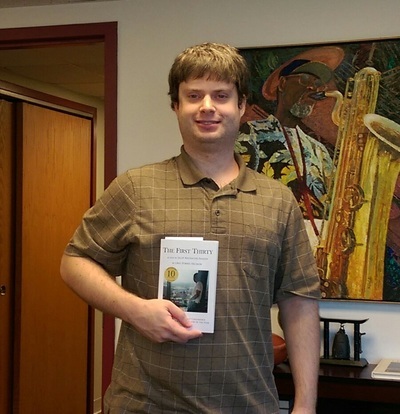 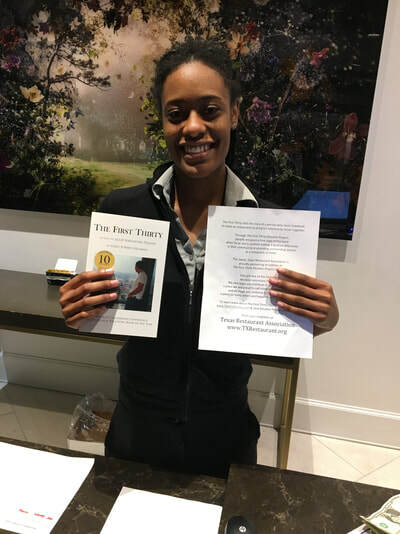 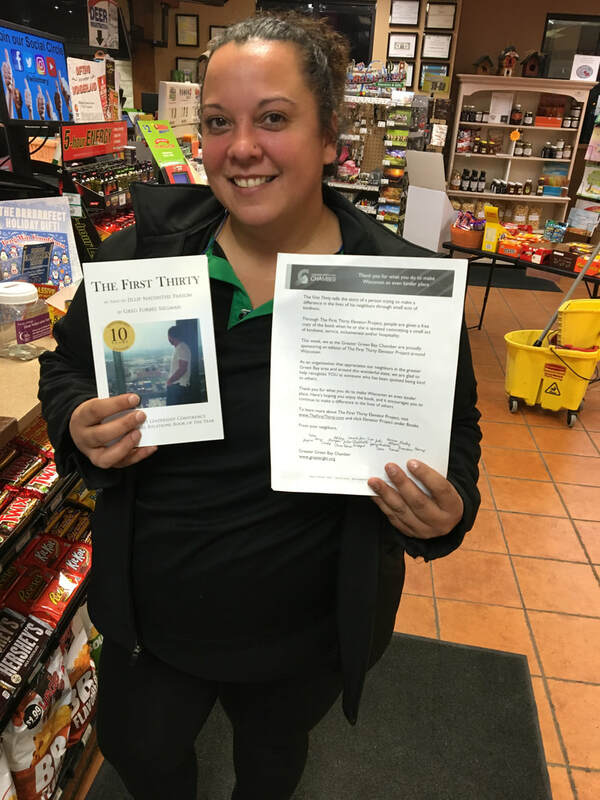 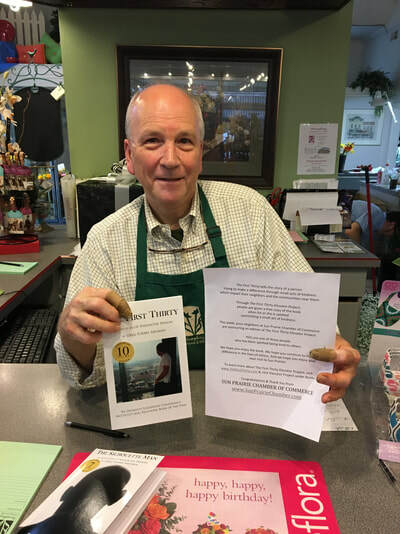 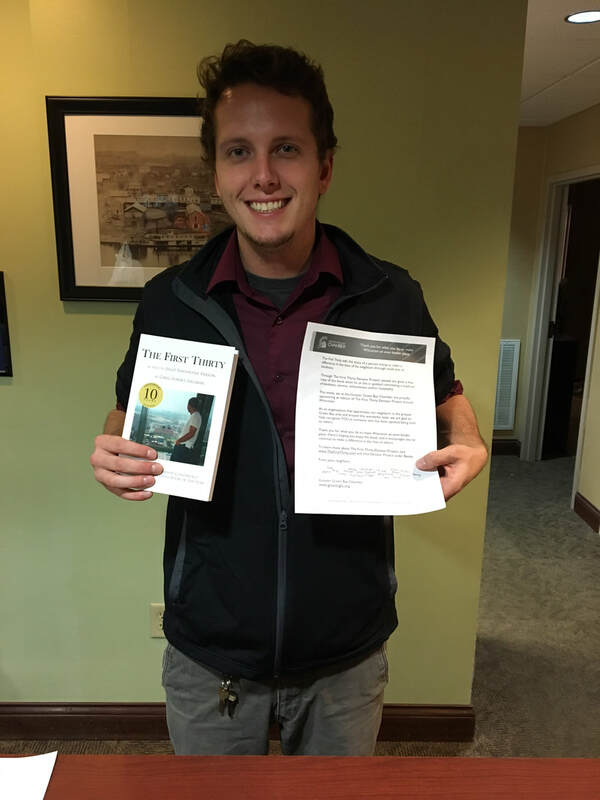 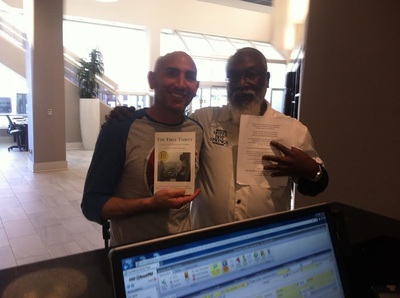 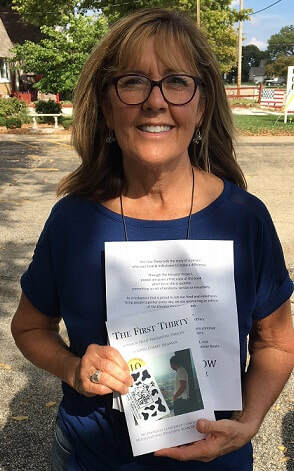 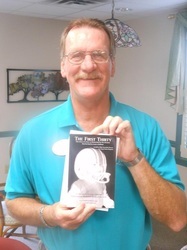 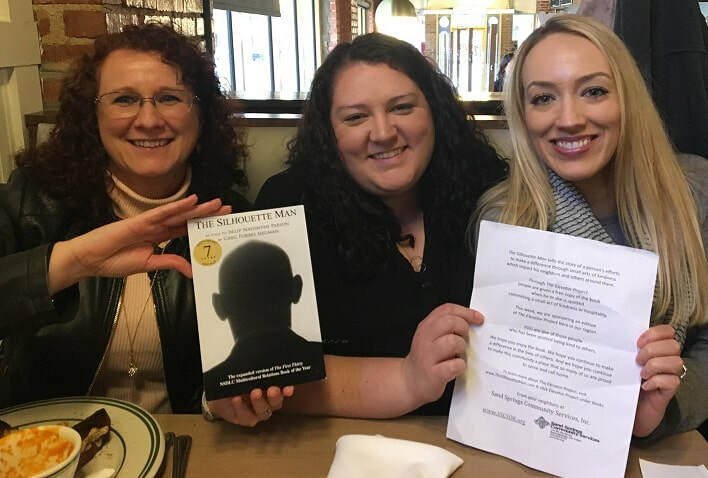 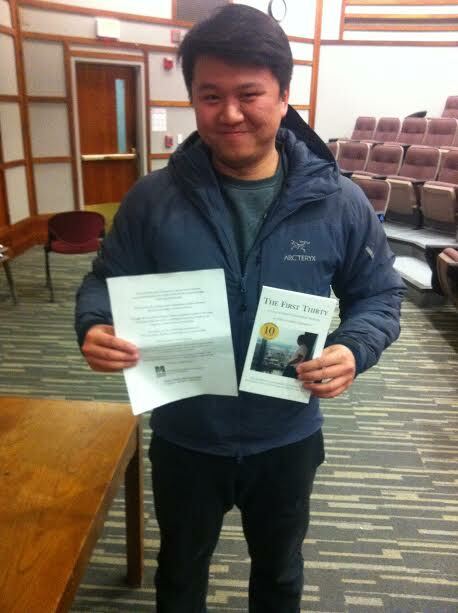 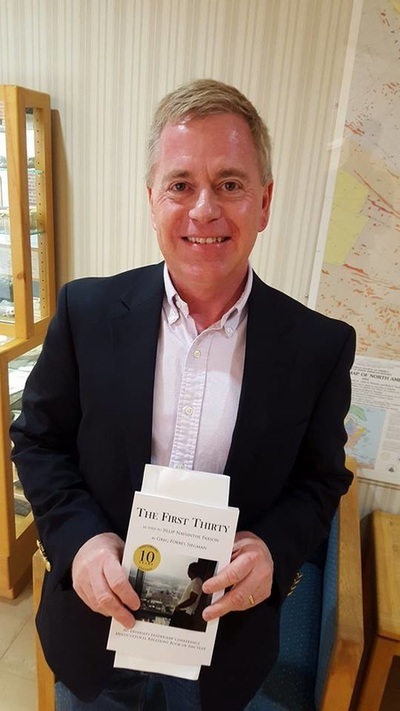 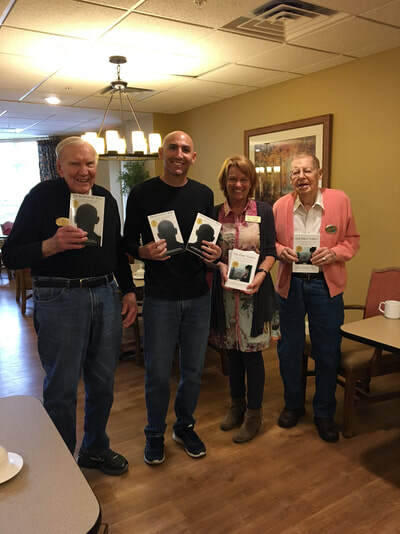 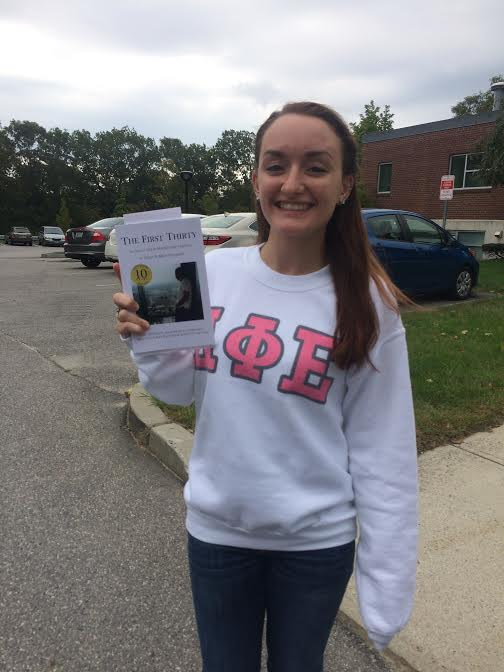 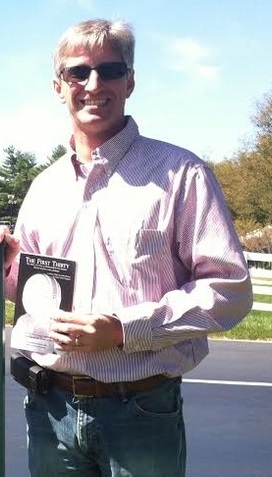 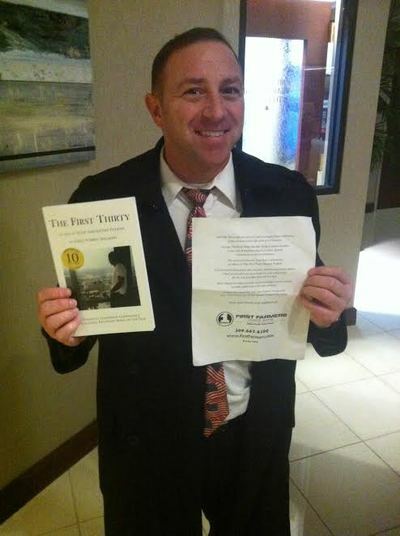 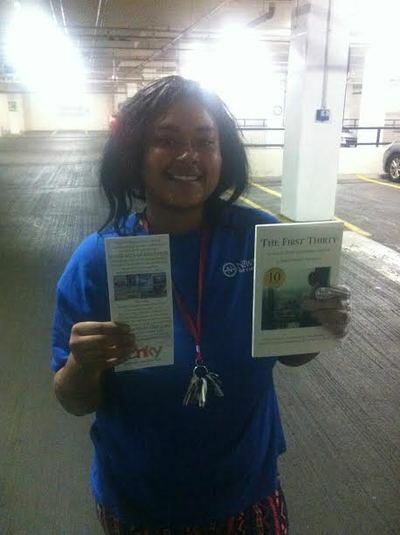 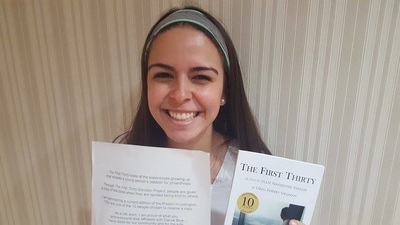 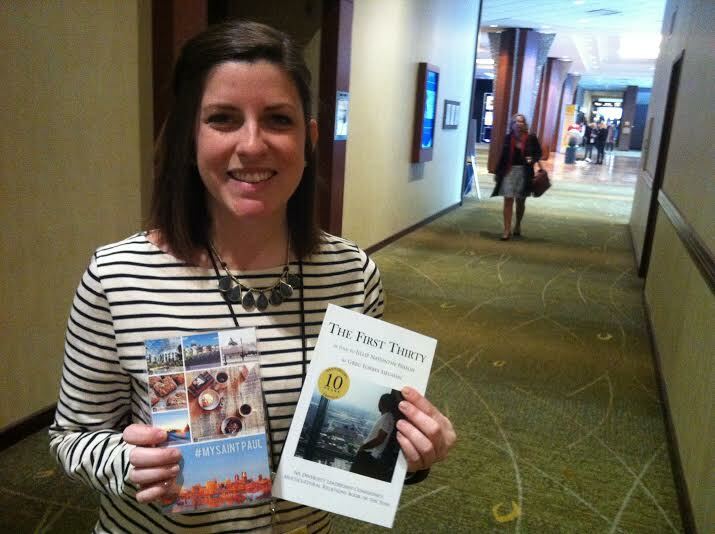 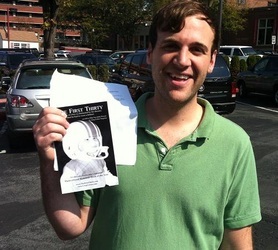 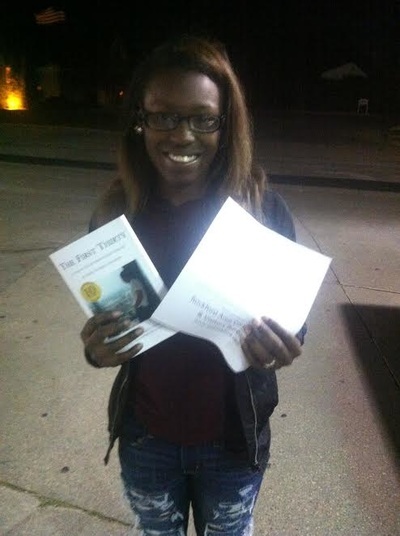 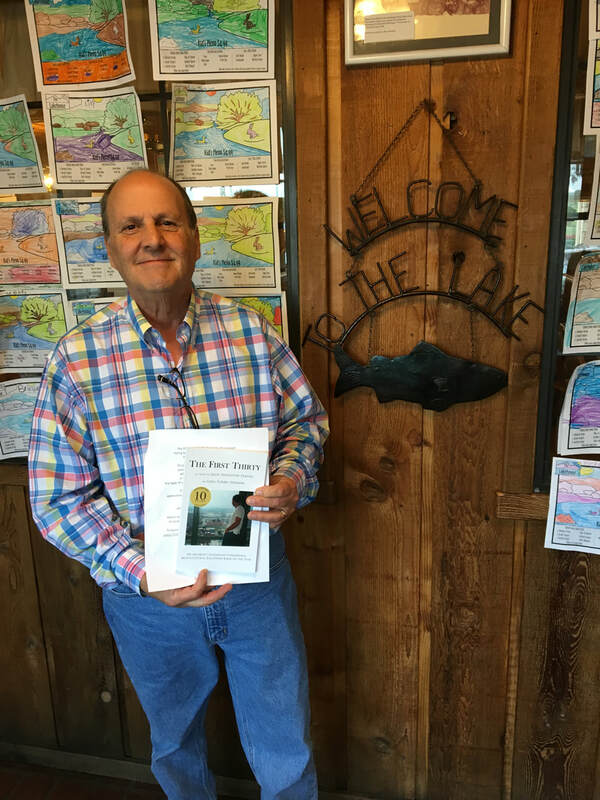 A doctor, who witnessed it, bought five copies of The First Thirty by Jillip Paxson (the book based on Greg's story) & made a unique request: He asked Greg to give them out to the next five strangers he witnessed commit acts of kindness and/or trying to connect others within their community.. 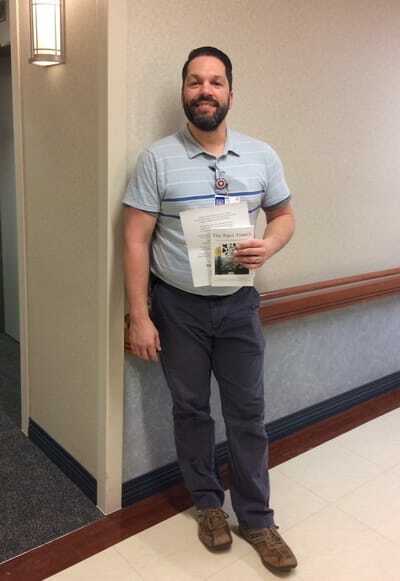 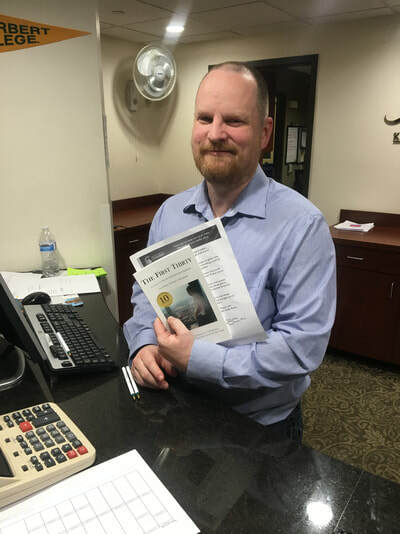 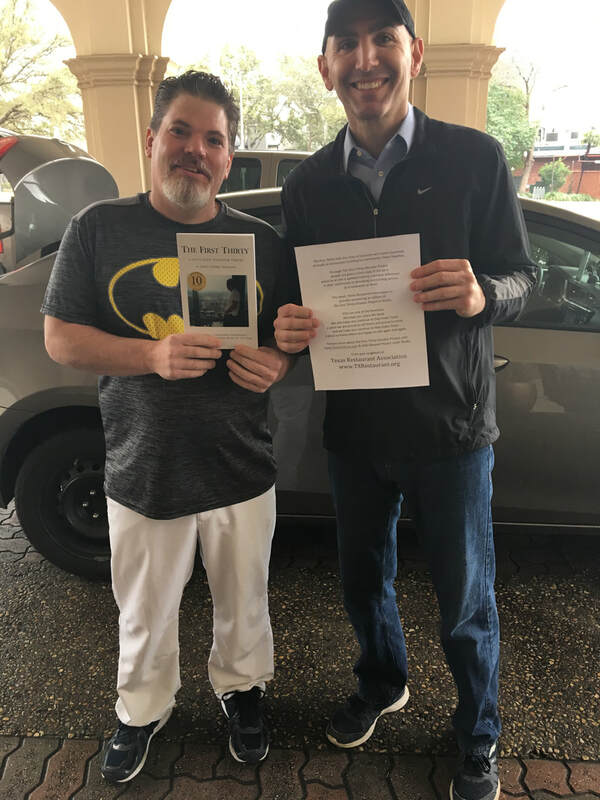 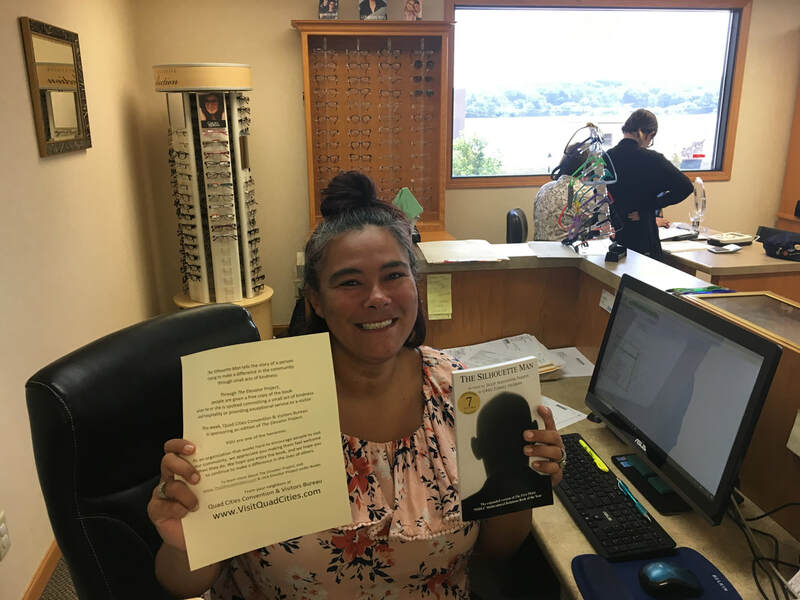 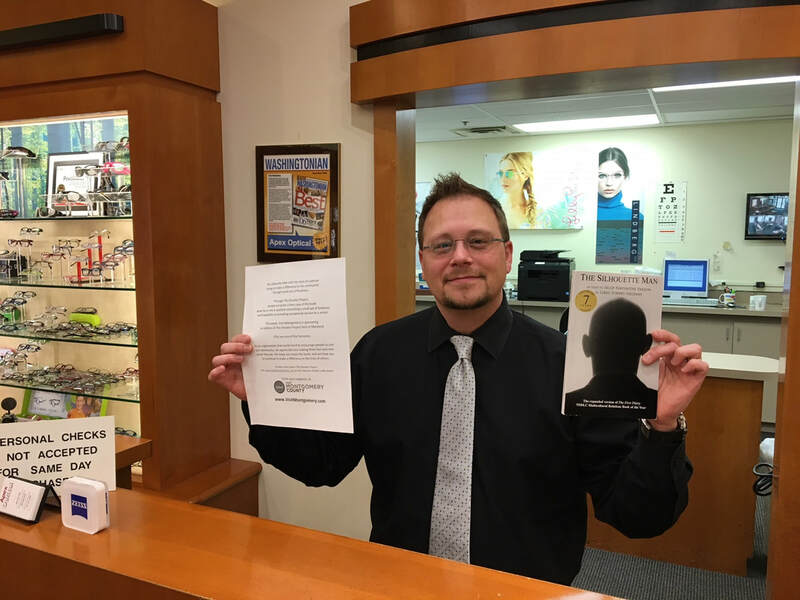 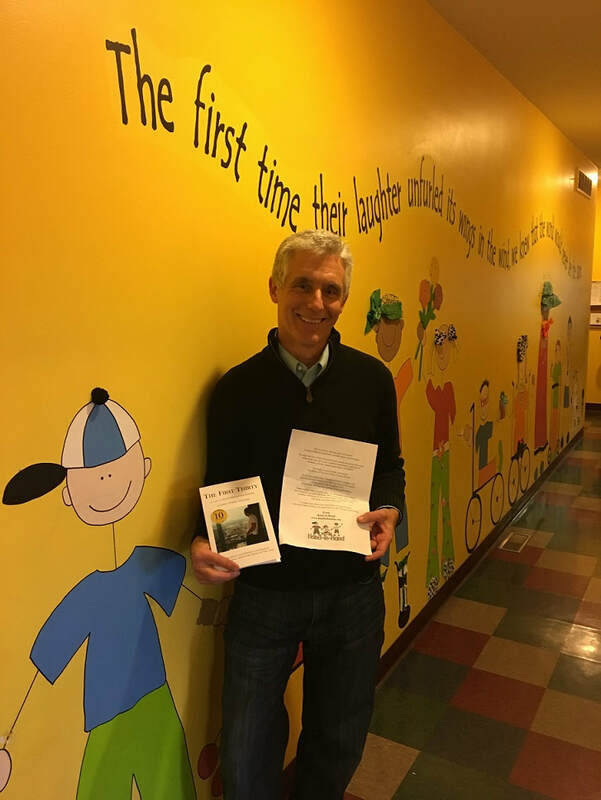 Within days, other people matched the doctor's act -- ordering copies of the book through the book website & asking Greg to give them out on their behalf. The Elevator Project was born. 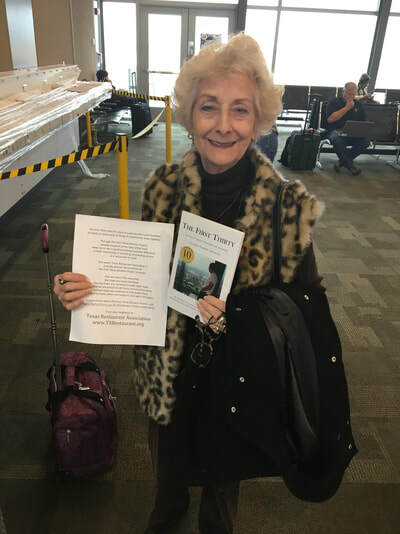 As time has gone on, other people & companies & organizations have ordered more copies through the website -- two, ten, twenty, fifty at a time -- to add to the Project. 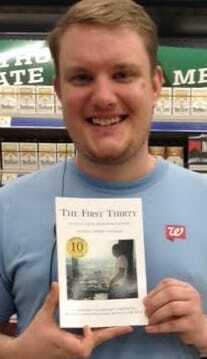 At the same time, things also expanded in new directions. 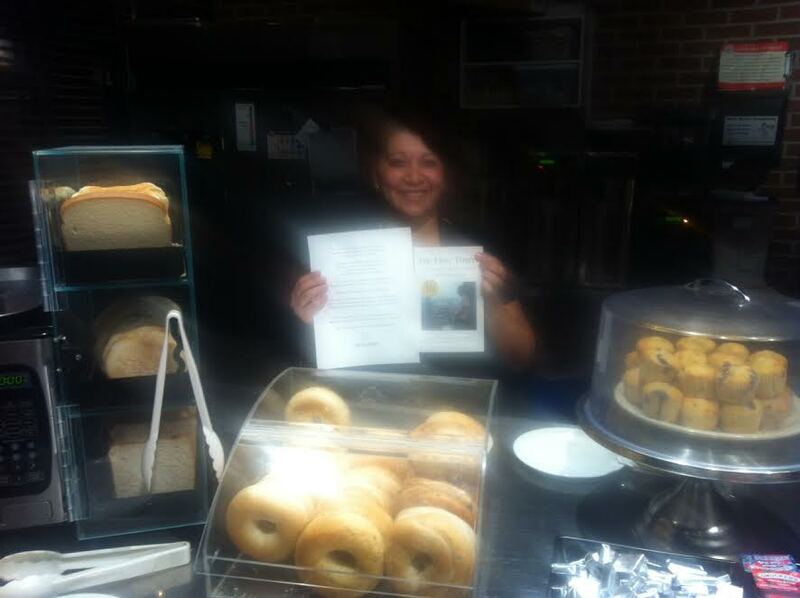 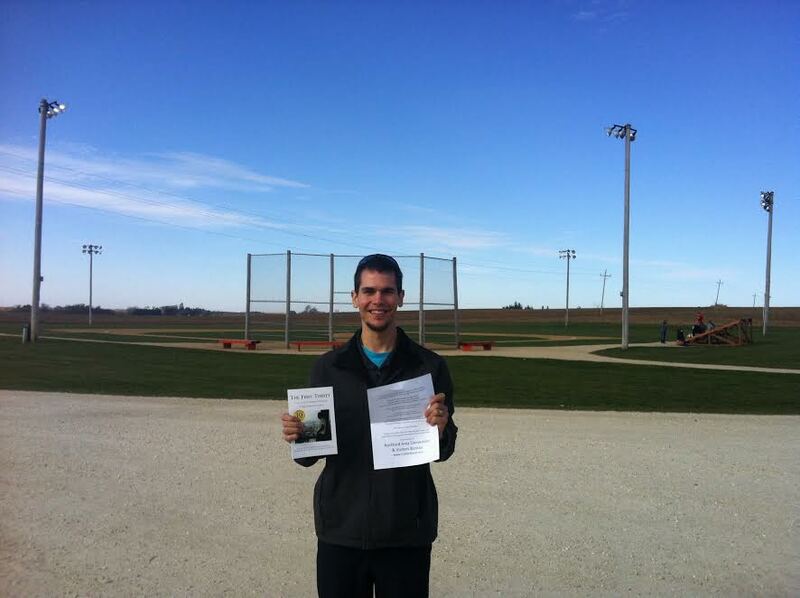 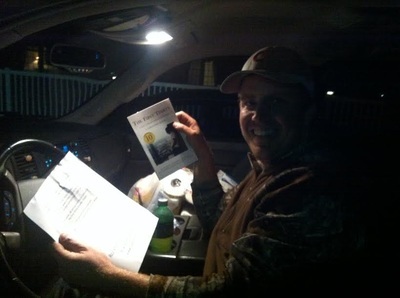 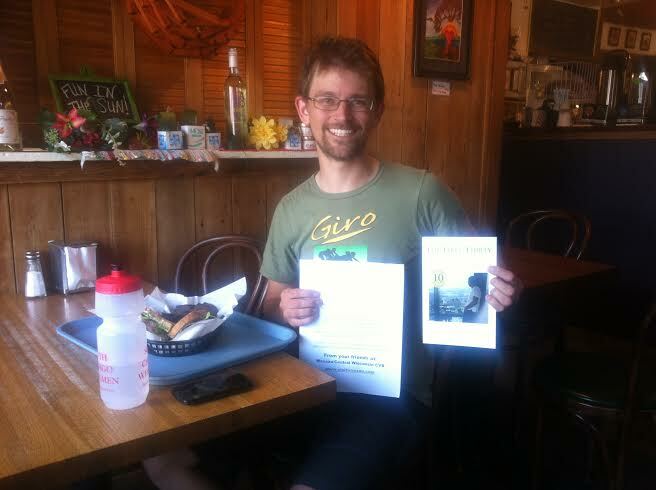 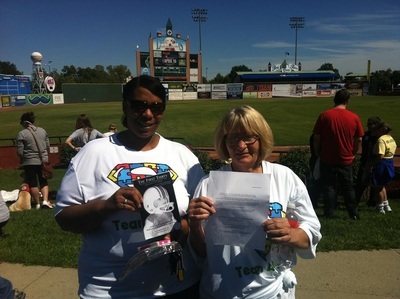 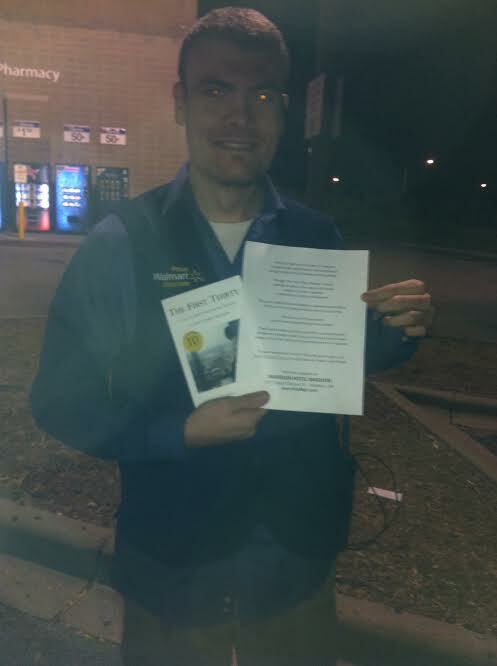 People & companies ordered copies to give out themselves in their own towns &/or places they visited. 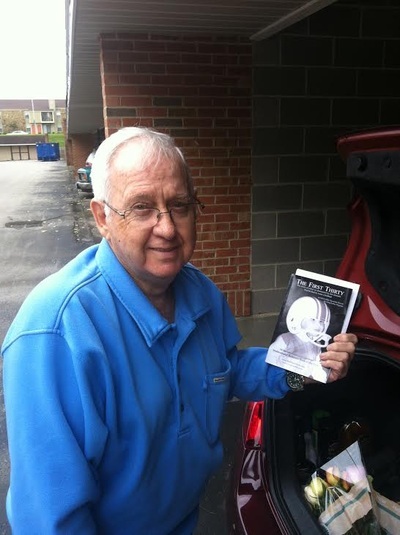 Examples include: A community of seniors in Kentucky ordered copies to give out to teens they witnessed show kindness to their residents. 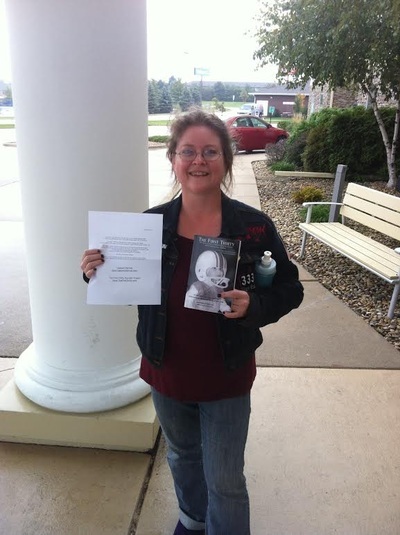 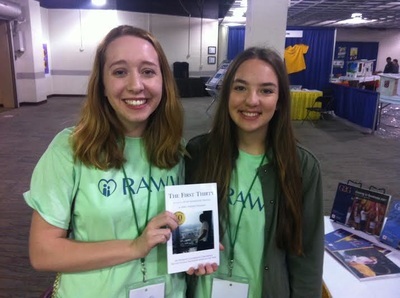 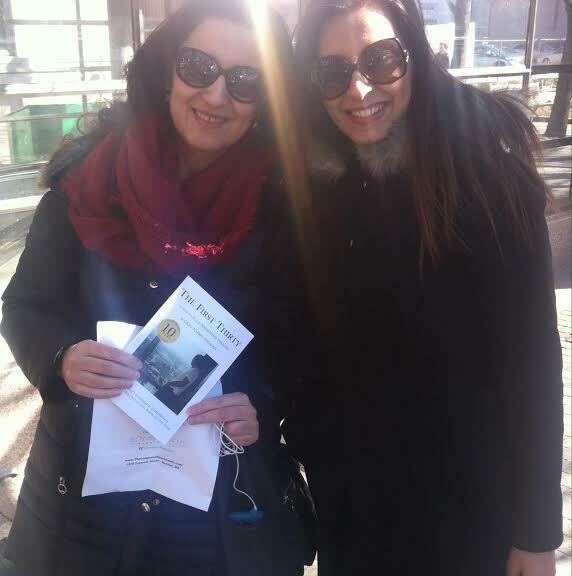 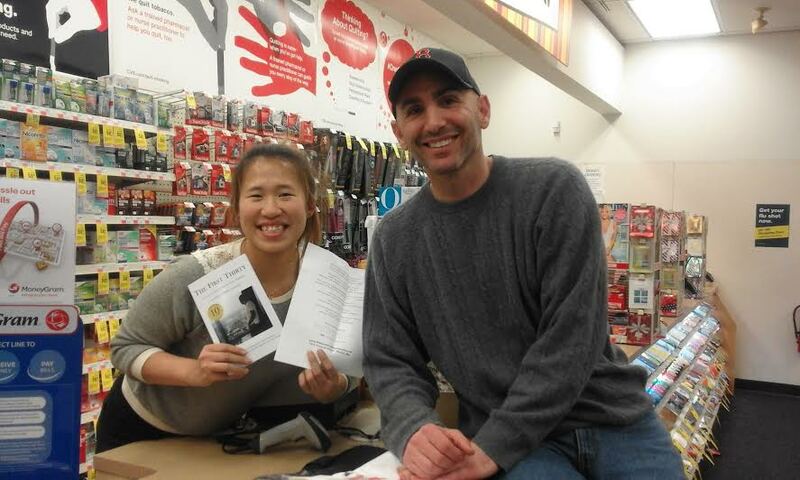 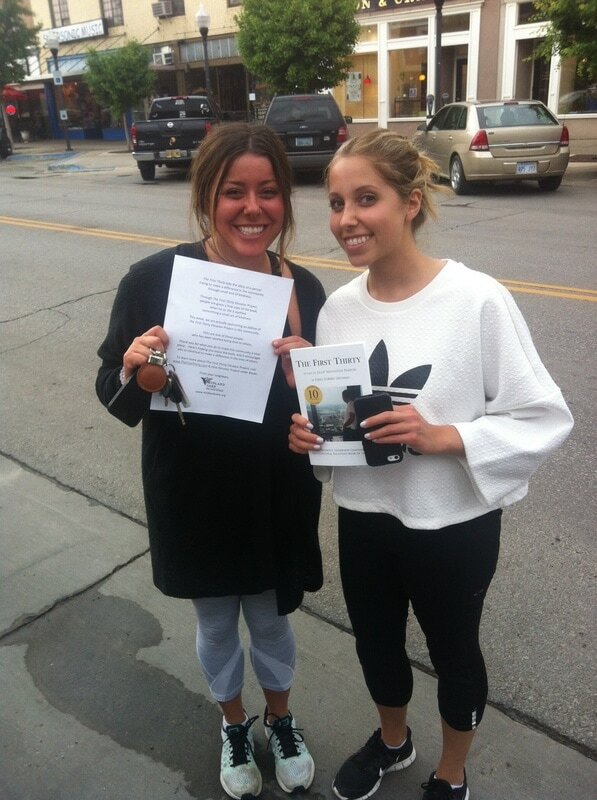 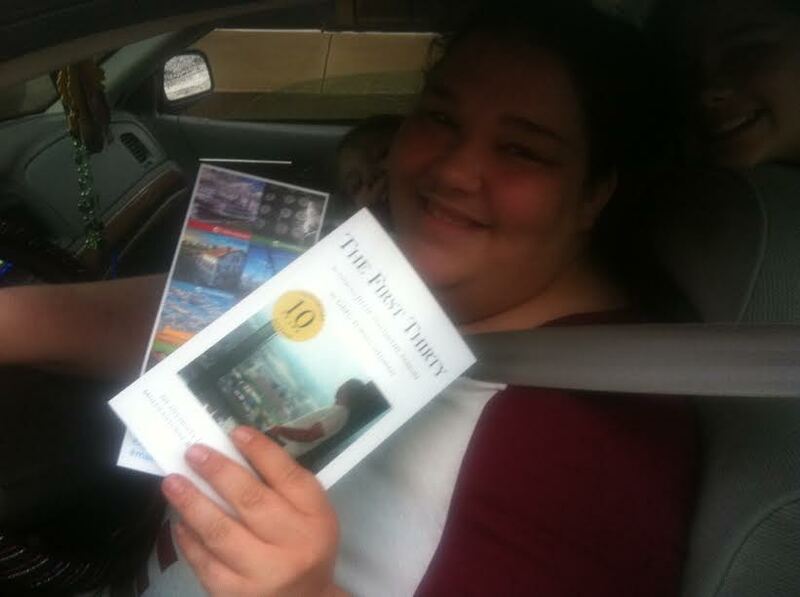 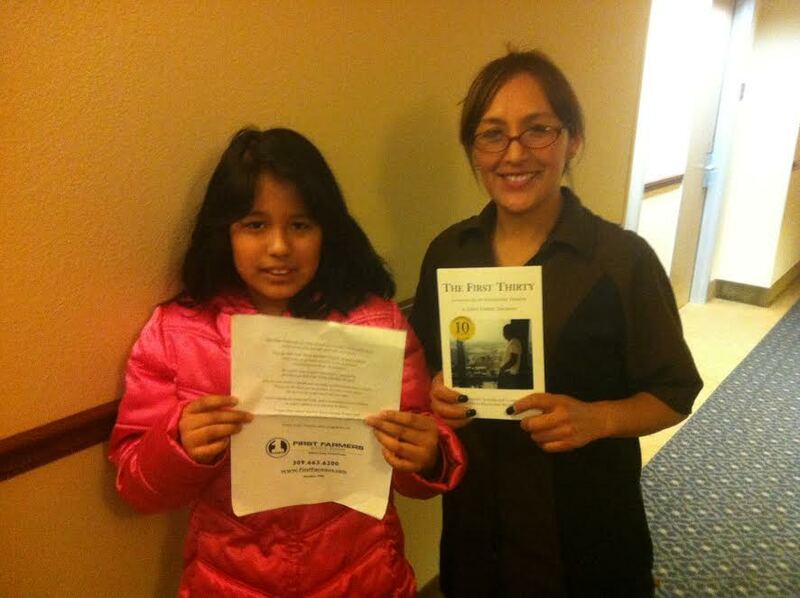 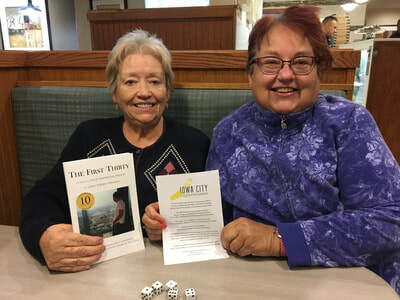 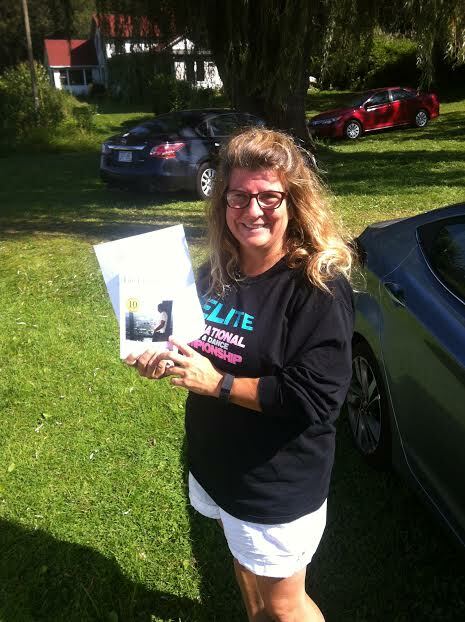 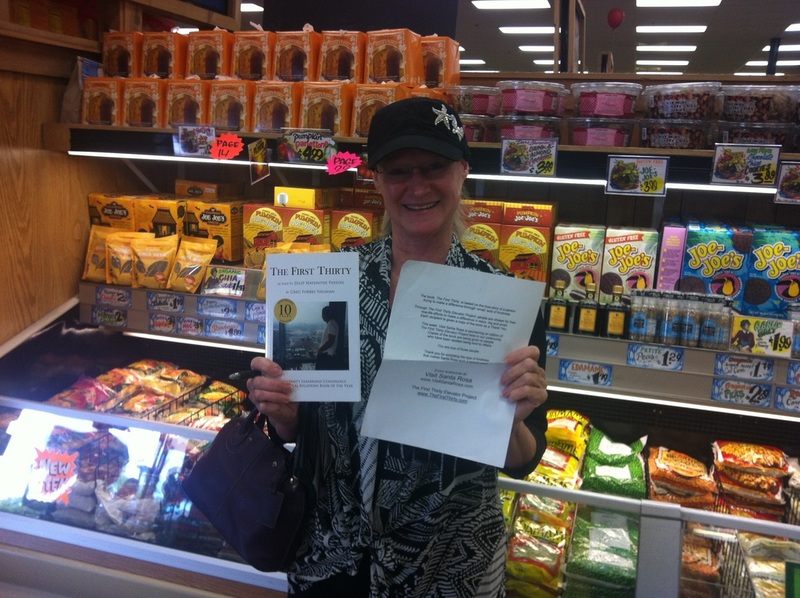 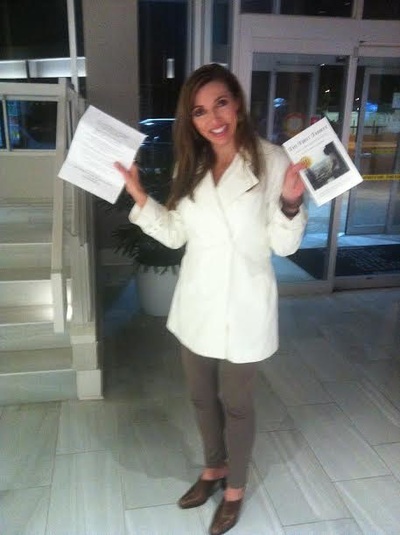 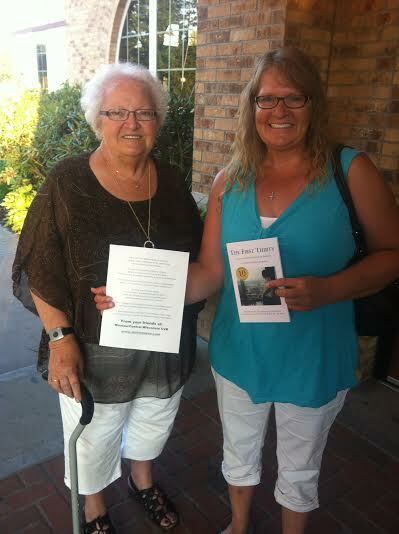 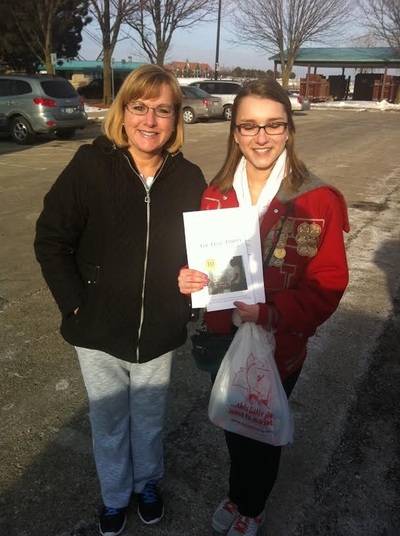 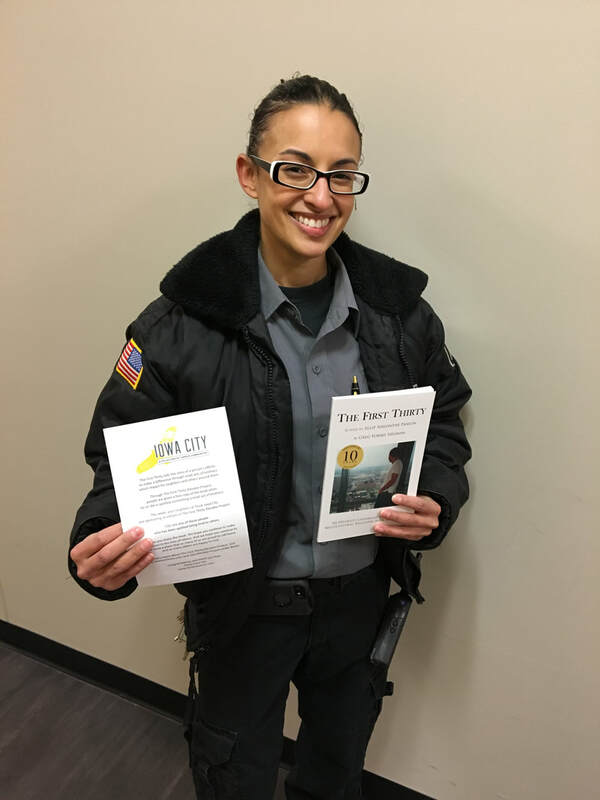 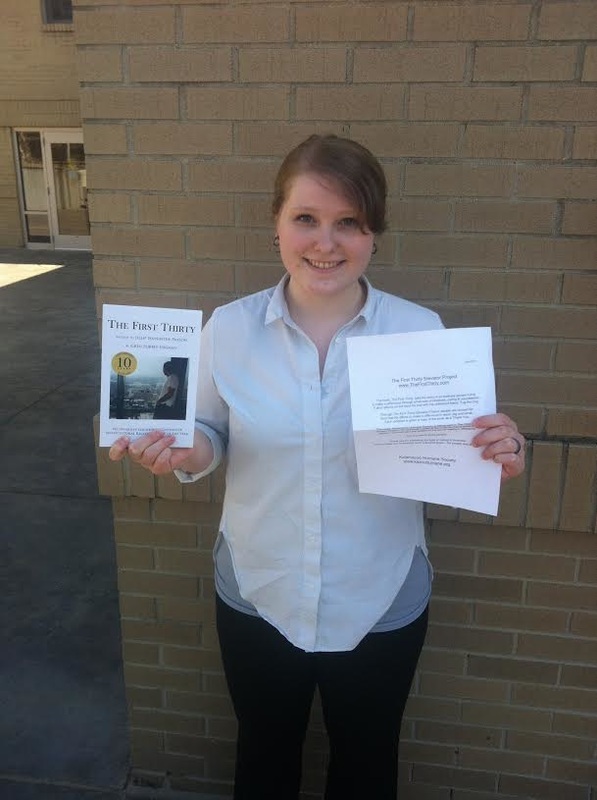 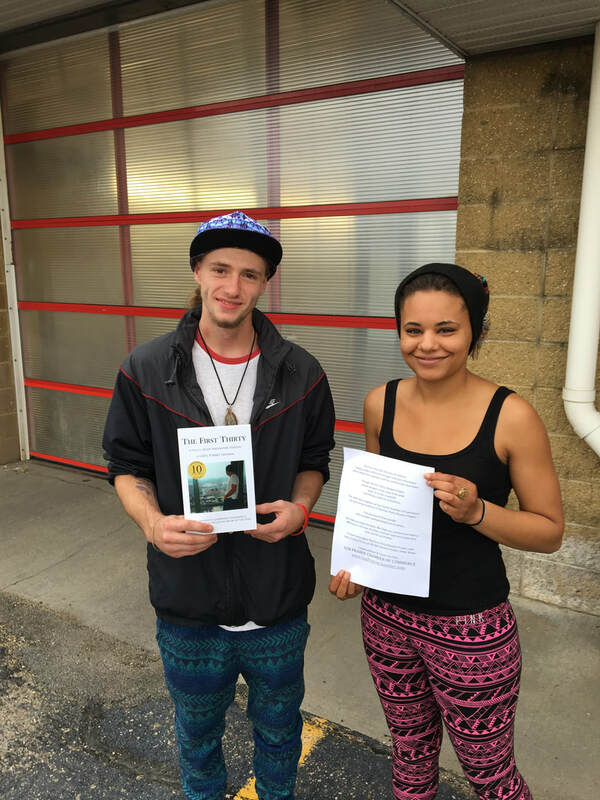 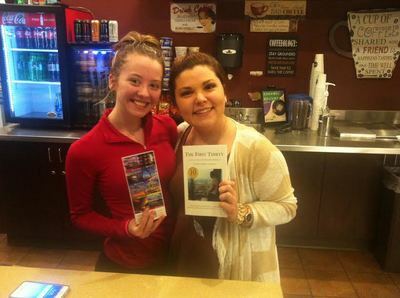 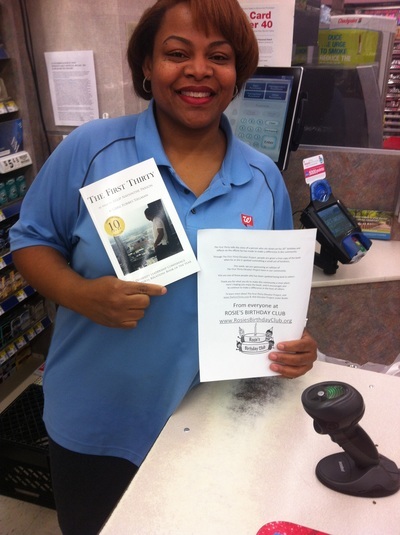 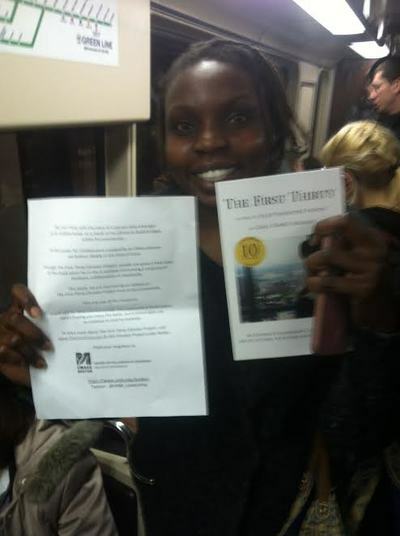 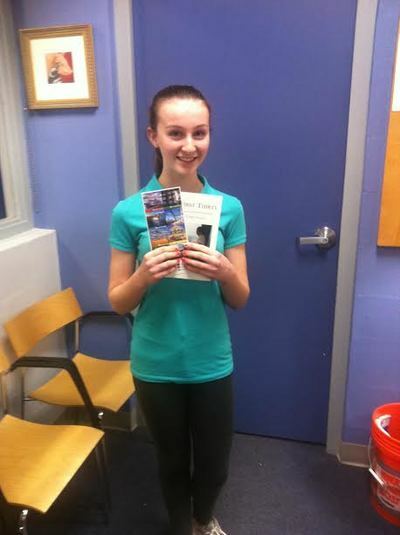 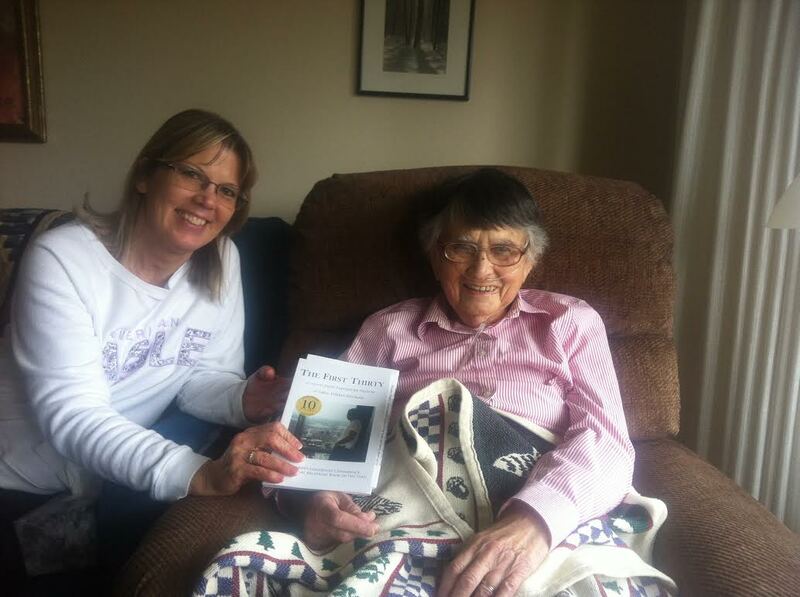 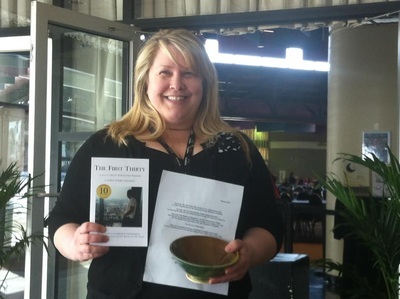 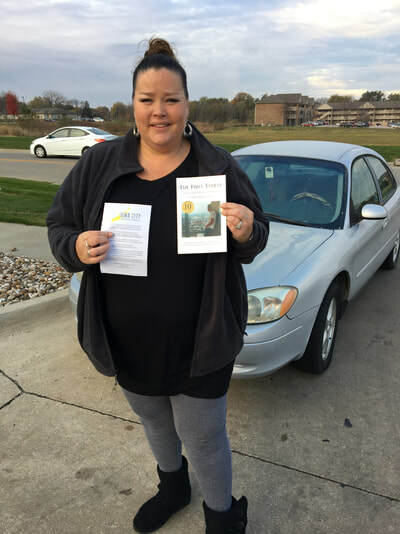 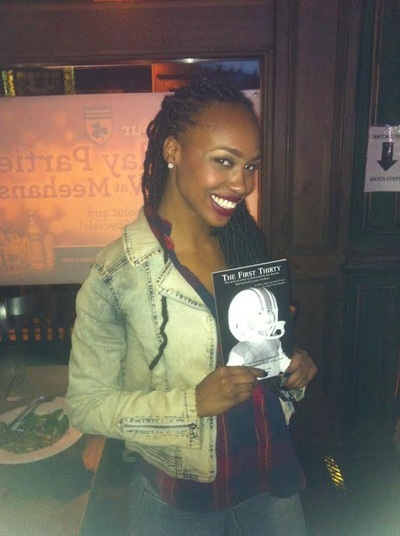 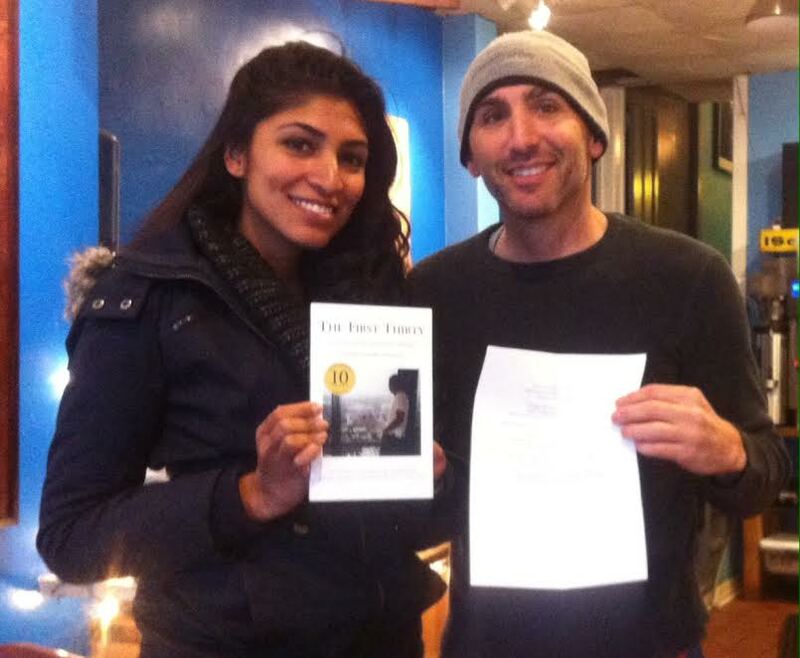 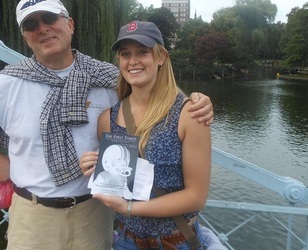 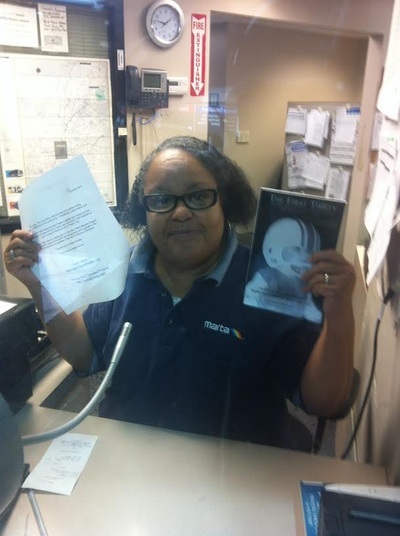 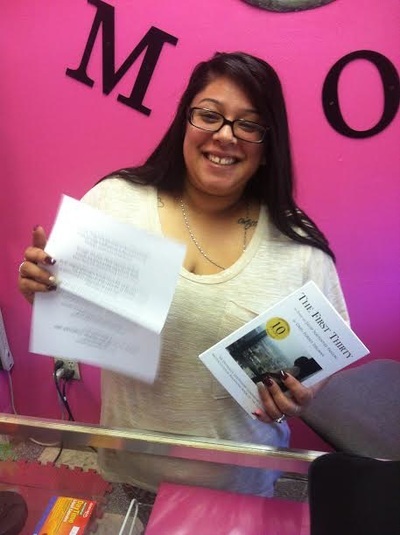 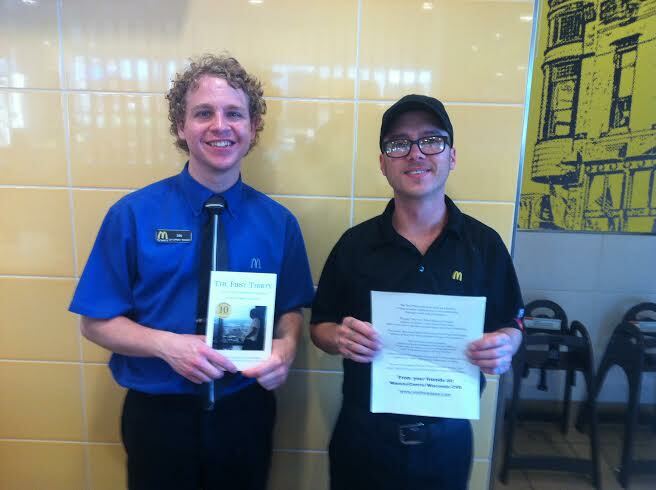 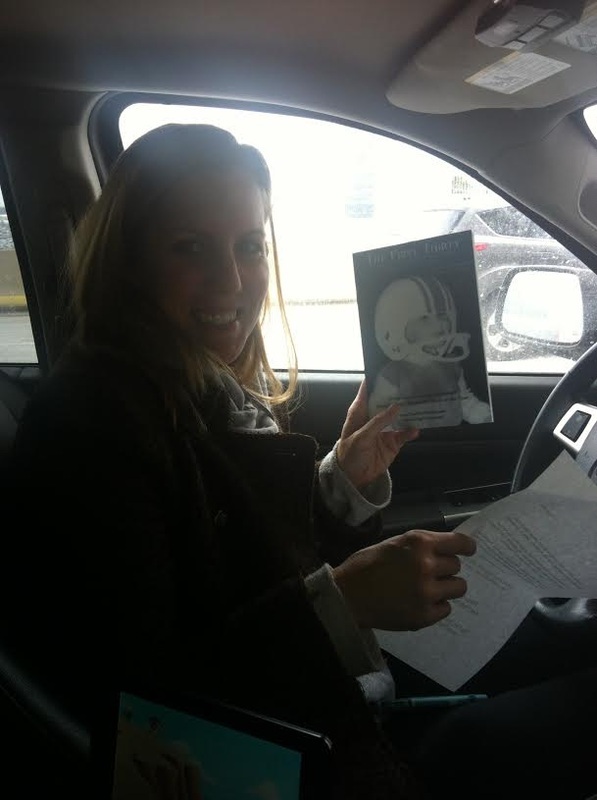 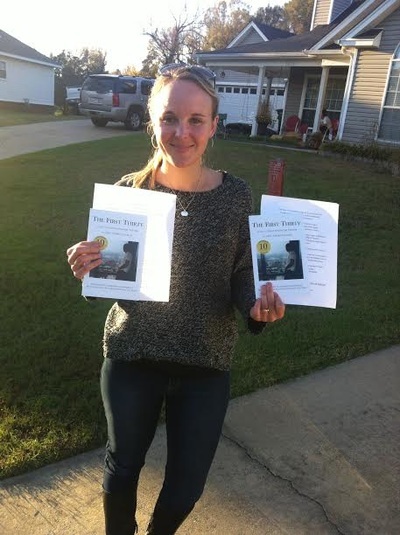 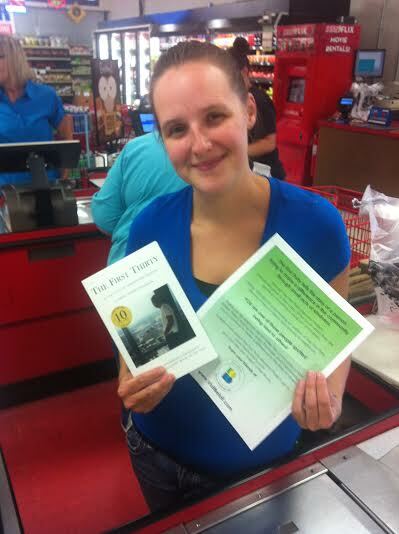 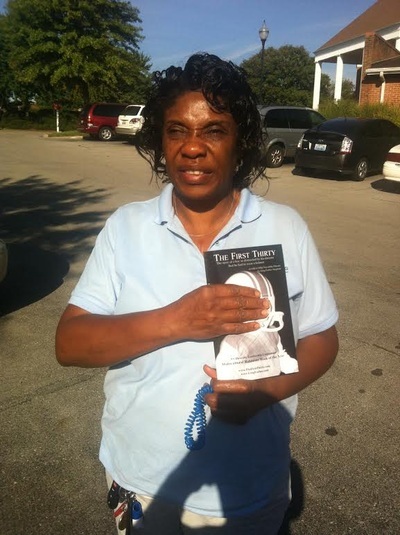 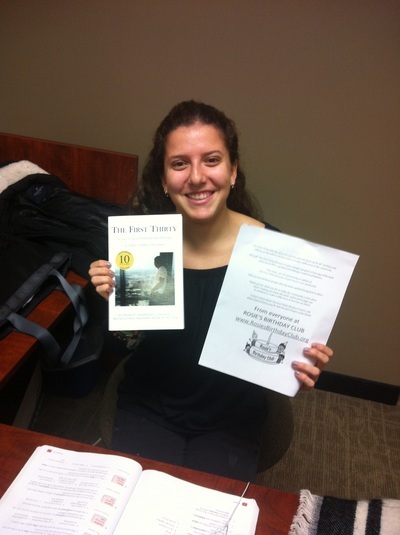 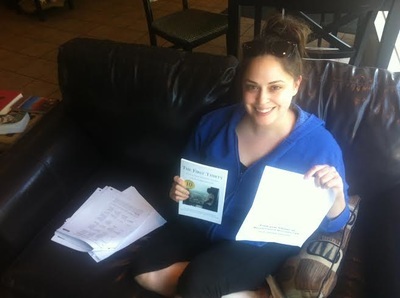 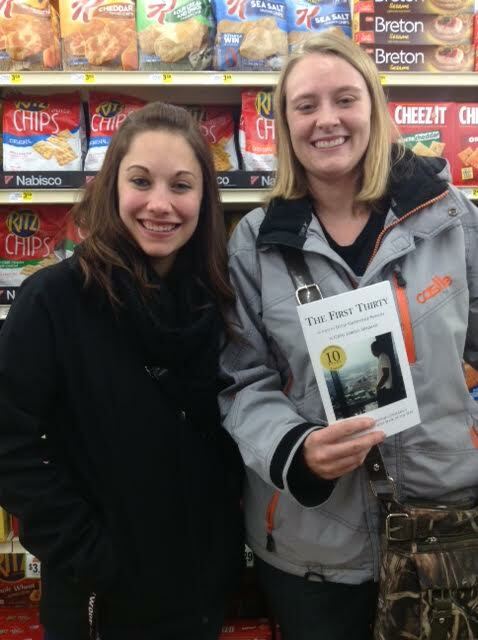 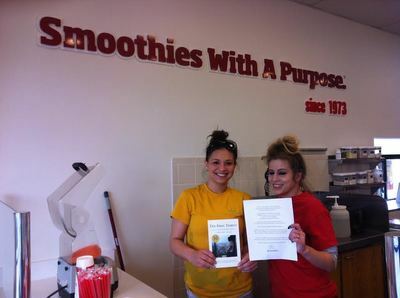 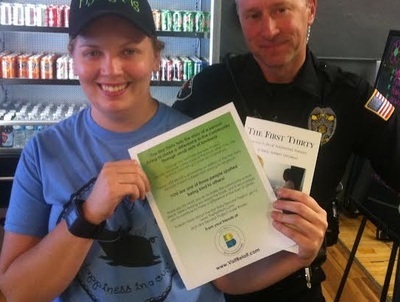 A mother & daughter in Canada ordered copies to give to good samaritans in their city. 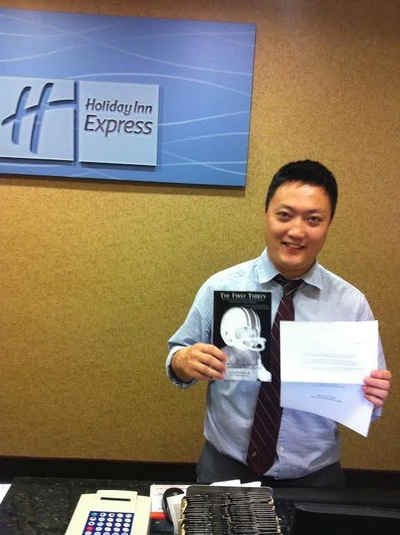 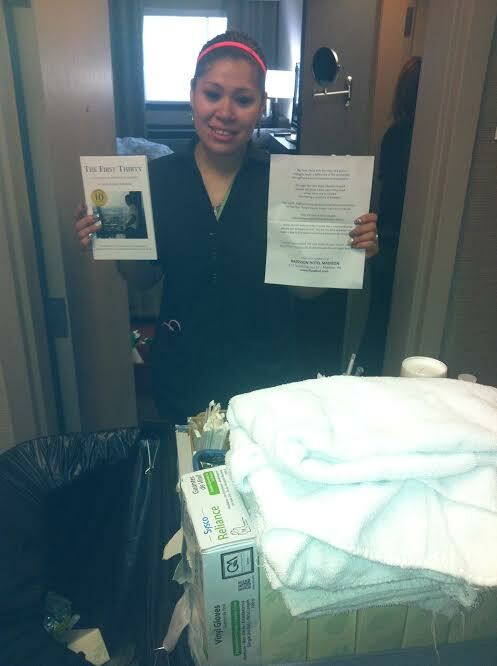 A hotel ordered copies to leave on pillowcases of guests who treat staff nicely. 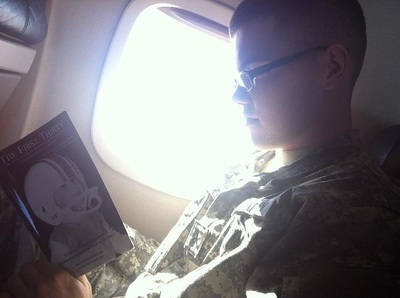 Before long, things took another new direction. 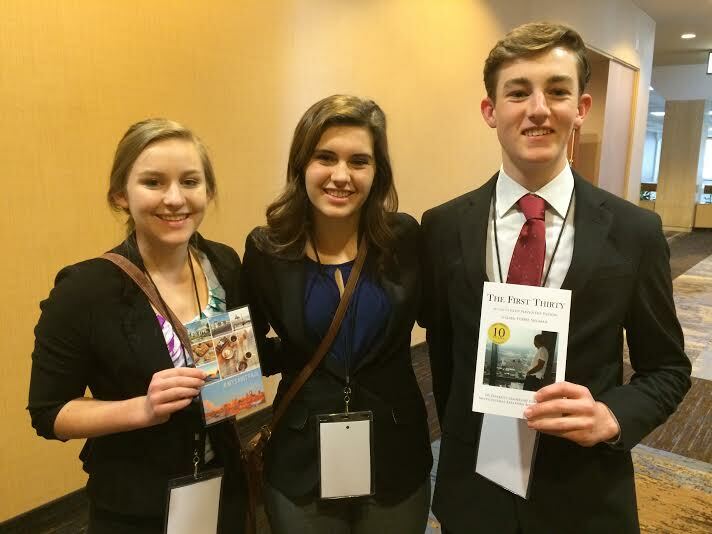 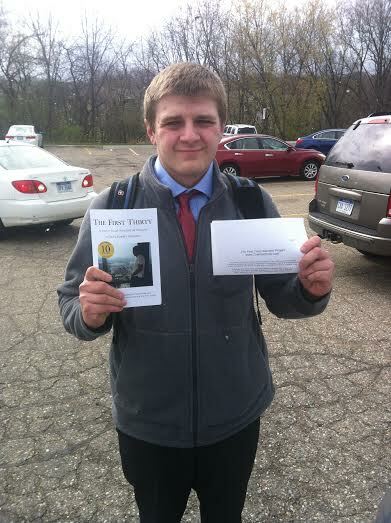 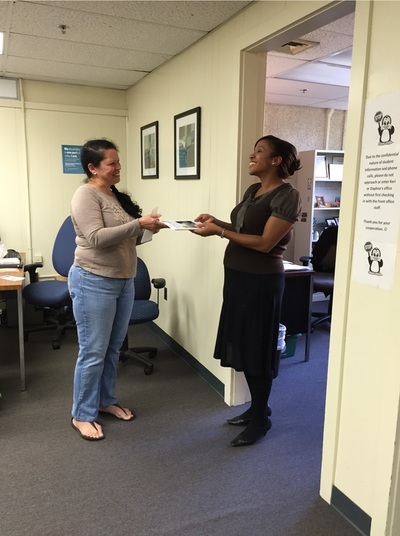 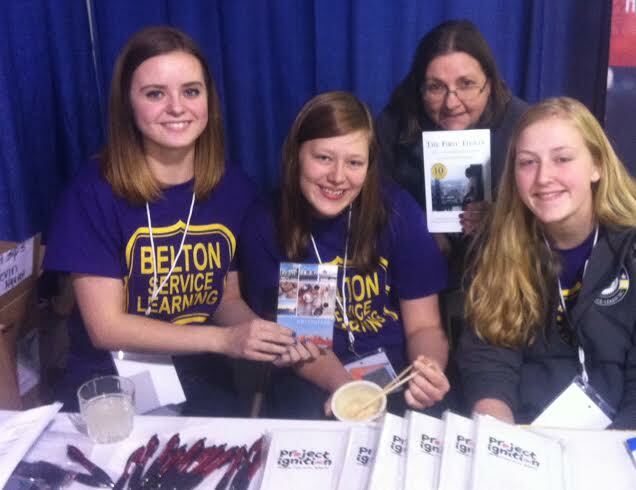 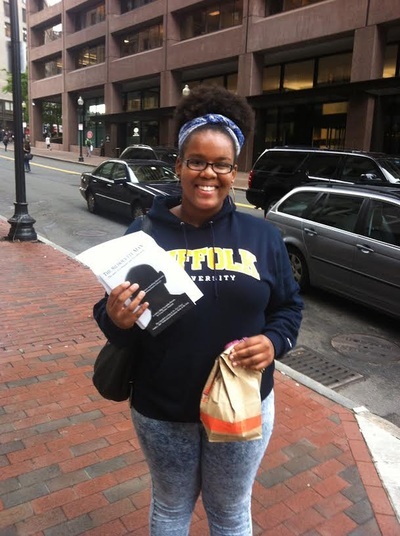 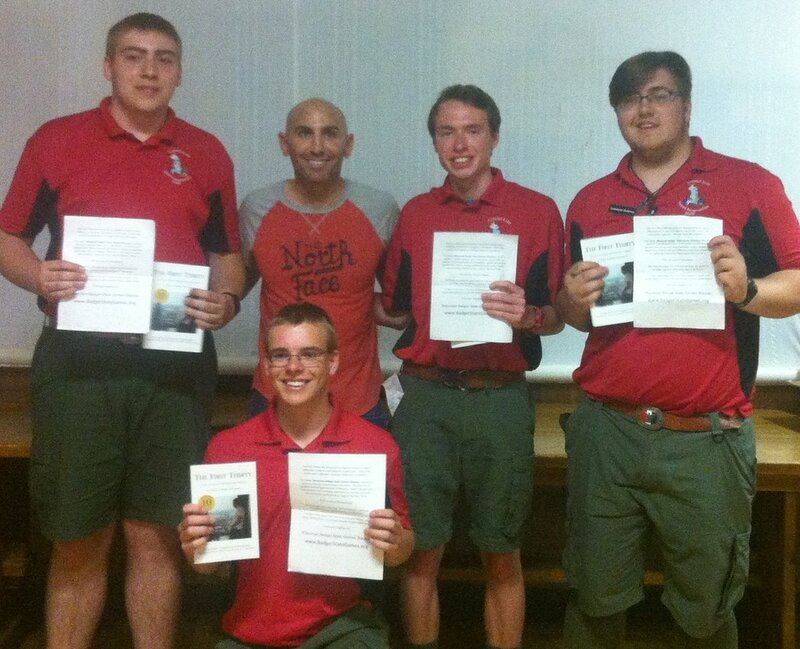 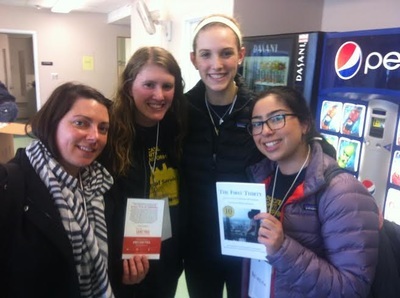 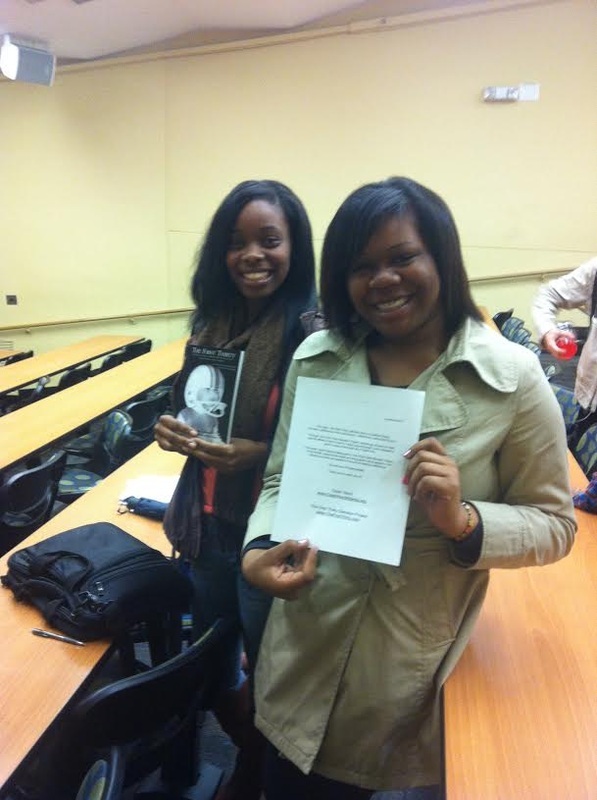 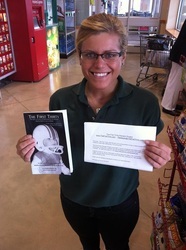 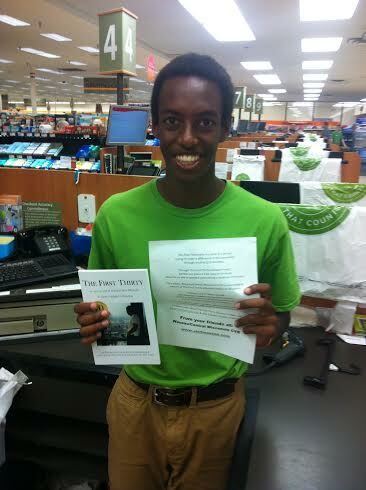 Groups ordered copies for students in their communities to give out -- providing them with the 'gift of giving'. 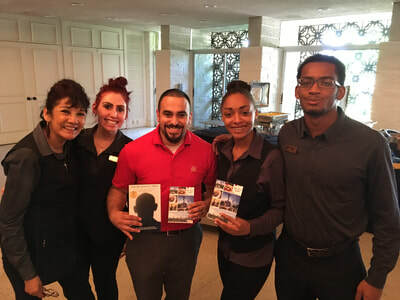 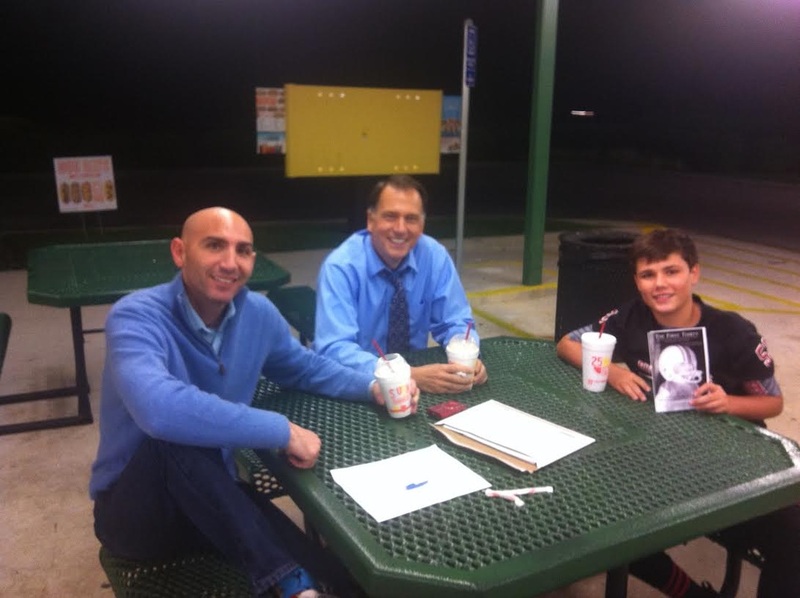 For instance, California Milk Advisory Board ordered copies for each student in their summer leadership program -- & then ordered matching copies so the students could give them to others. 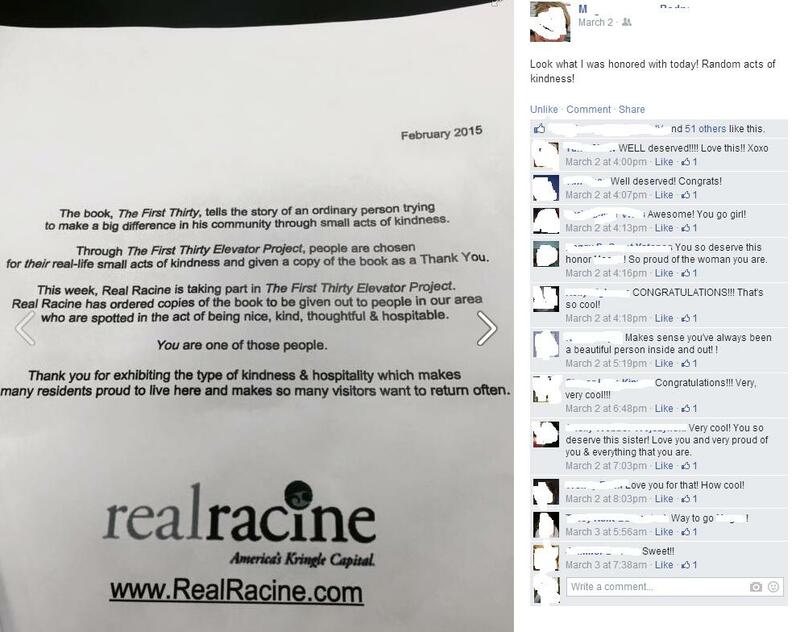 A middle school in Wisconsin ordered copies for 8th graders & matching copies for them to give to others. 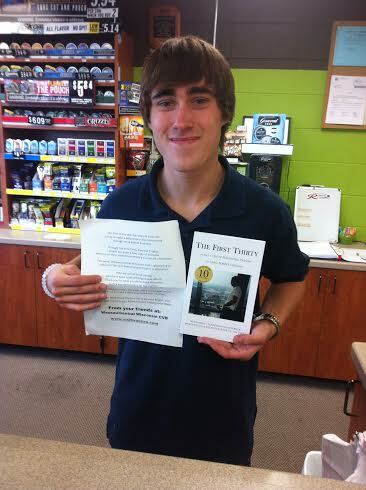 A Chamber of Commerce ordered copies for every graduate of a local school to give to people who treated them nicely. 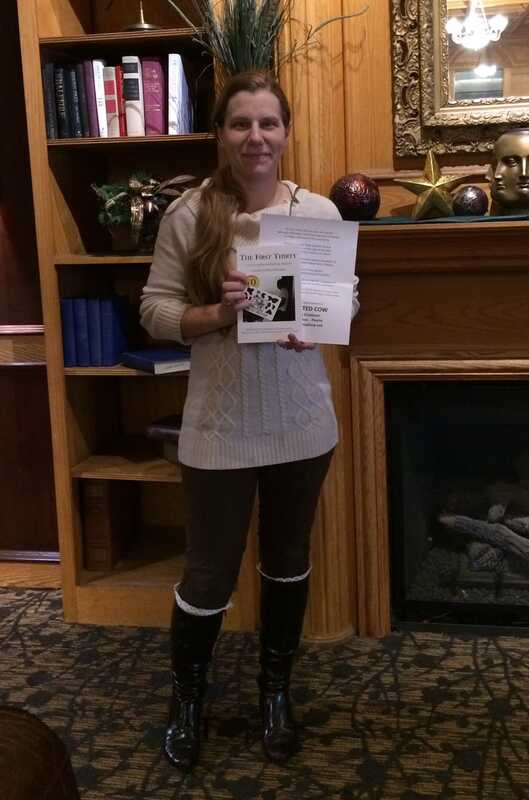 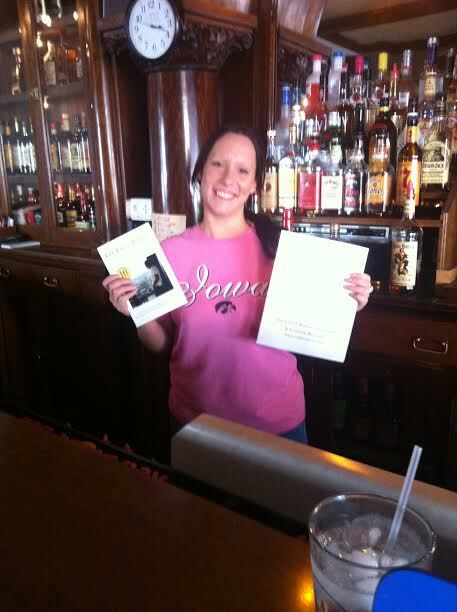 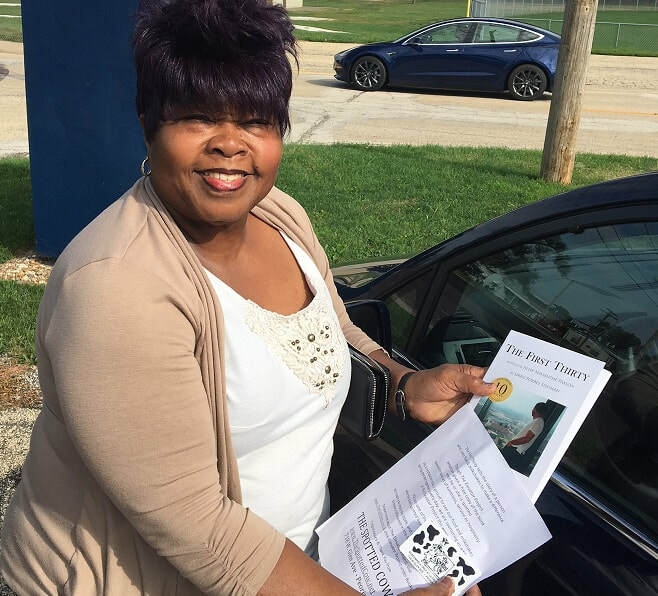 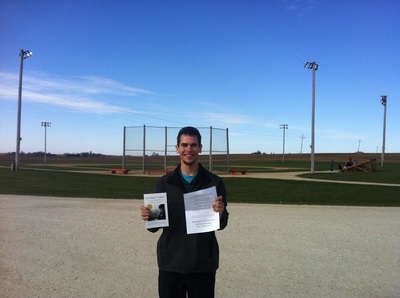 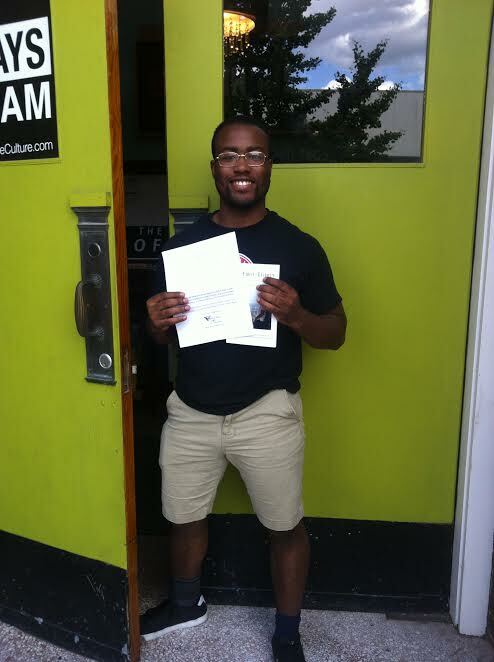 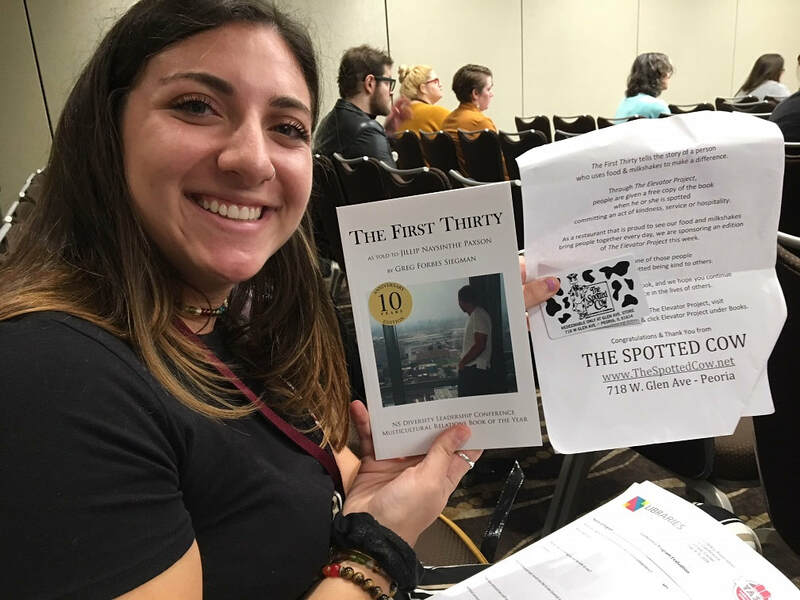 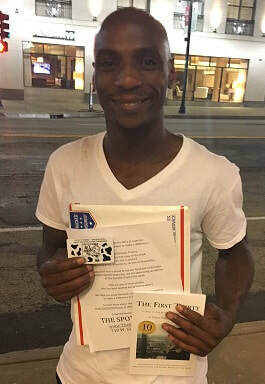 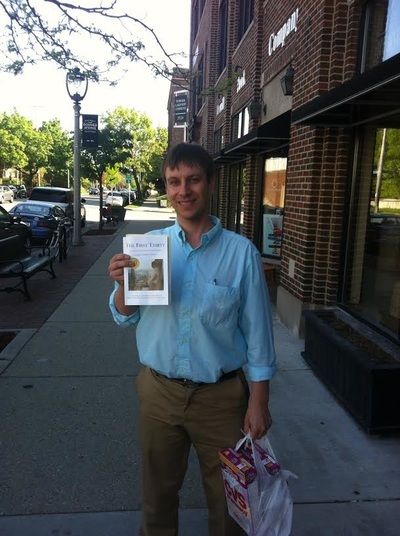 The Spotted Cow empowered a college student in Peoria to give out two dozen copies to people around town who are helpful and kind to others. 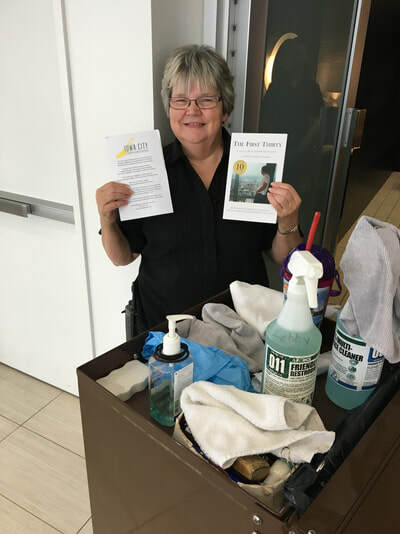 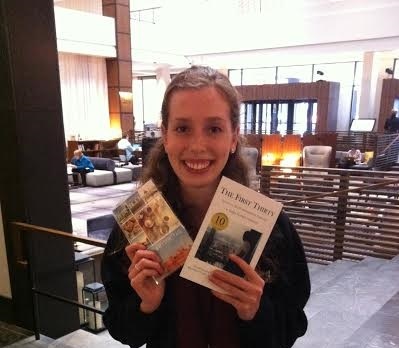 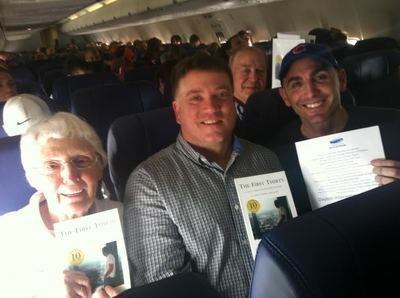 What began in an elevator in the USA eventually spread beyond the continent -- with copies of the book purchased & then given out to people who commit acts of kindness in places as far away as China & Africa. A sponsor has also now ordered copies to be given out to good samaritans in the United Kingdom & Brazil. 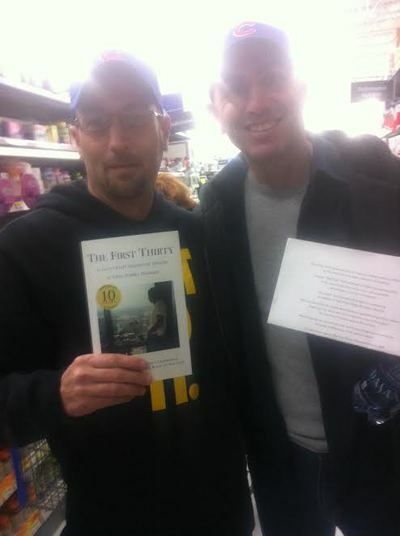 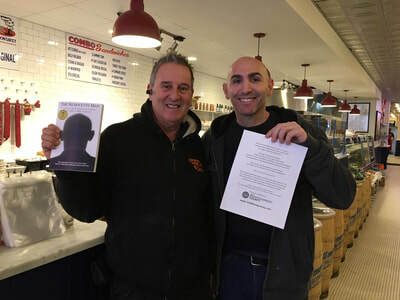 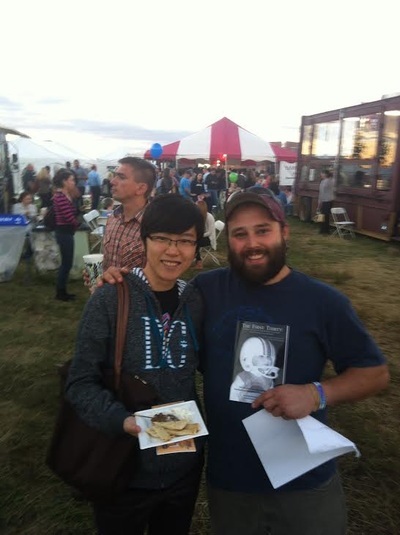 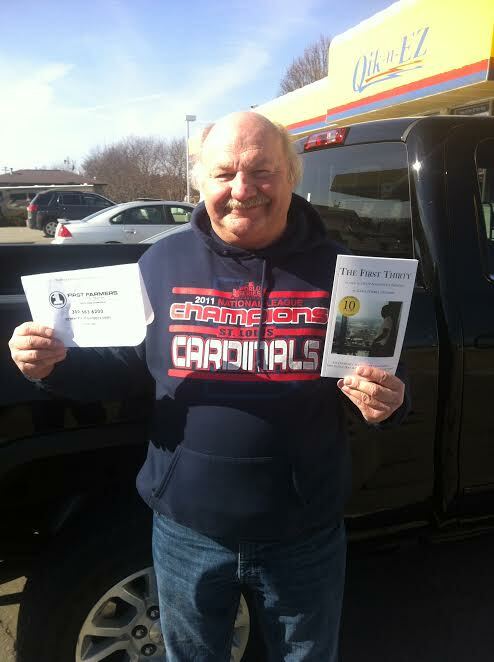 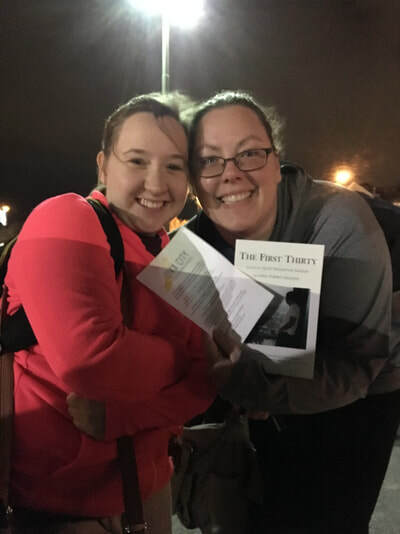 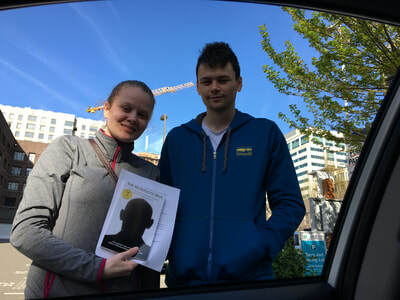 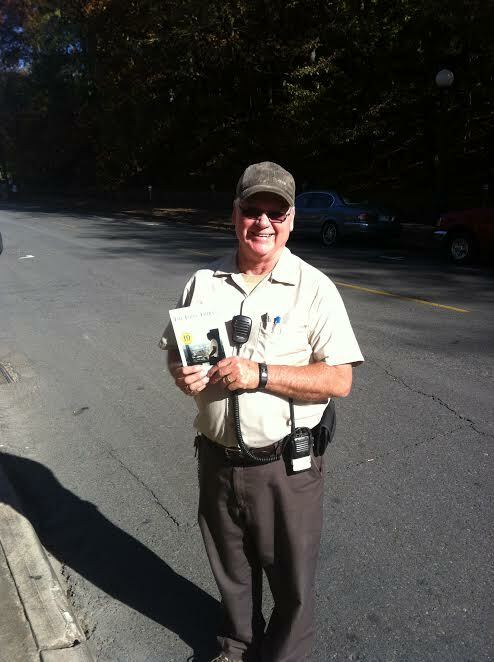 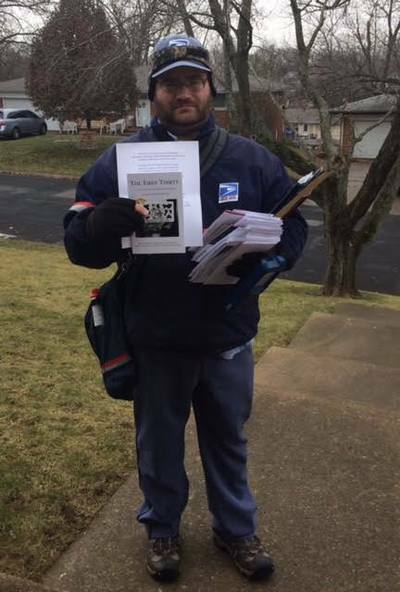 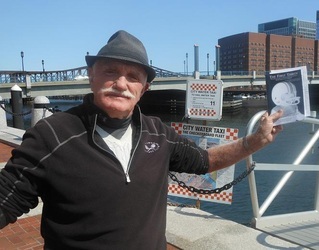 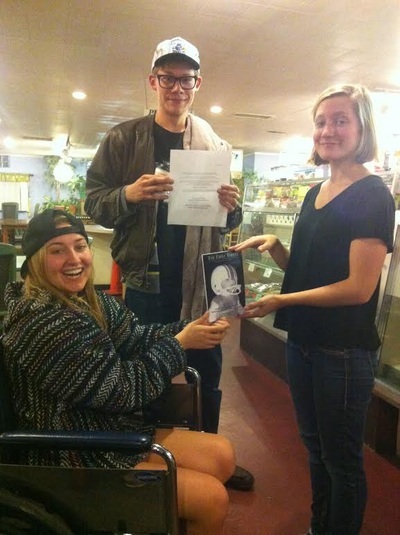 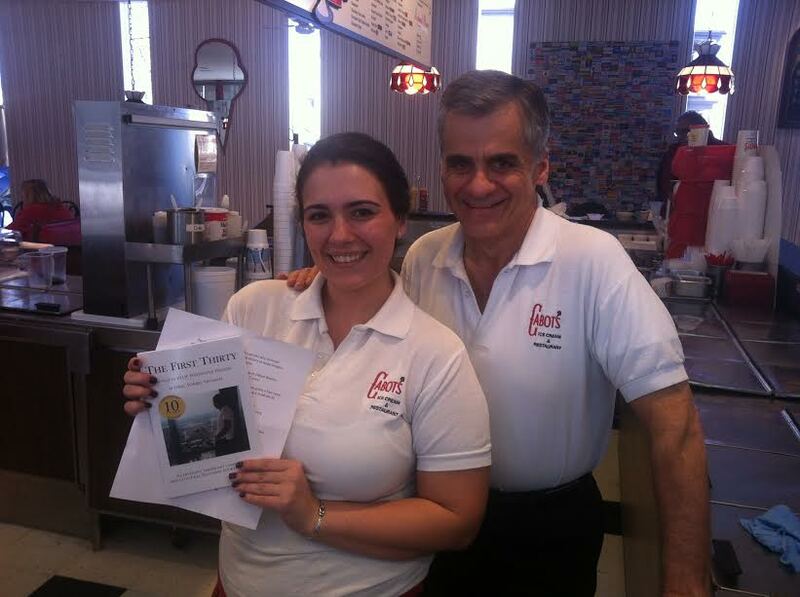 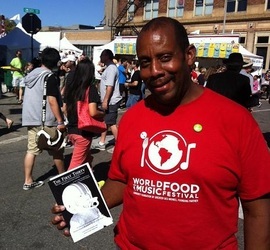 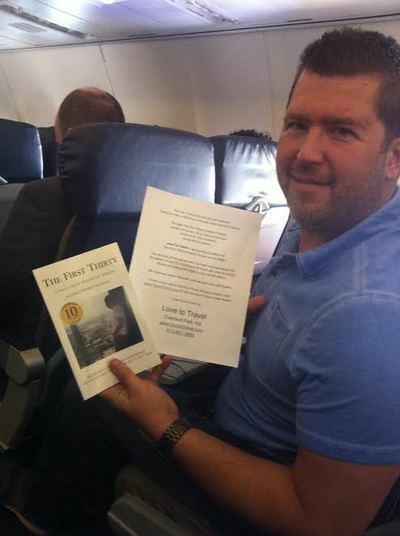 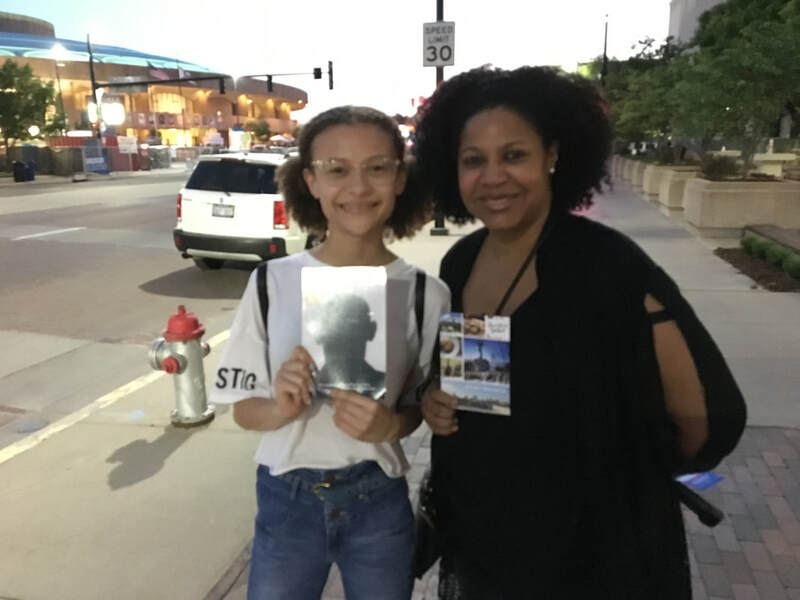 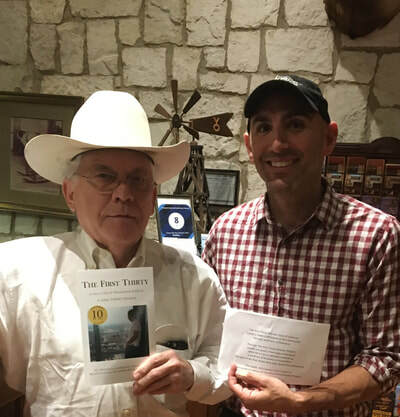 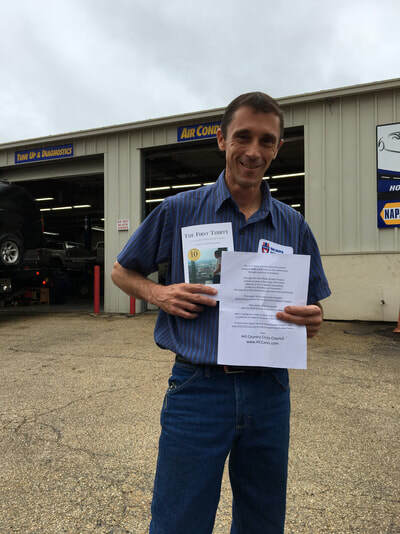 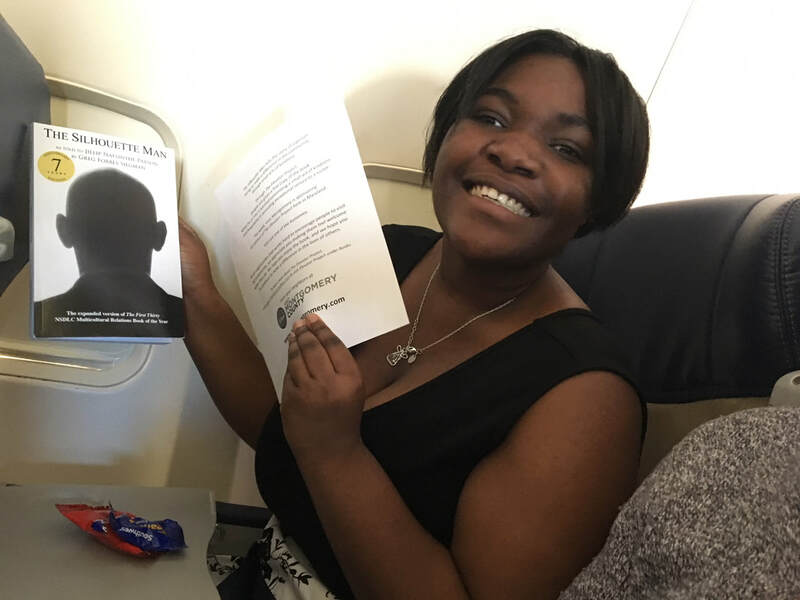 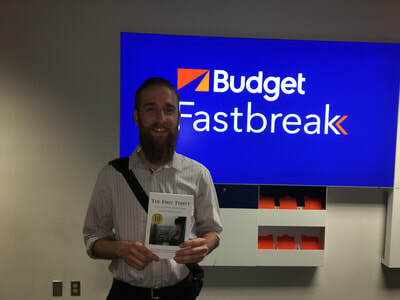 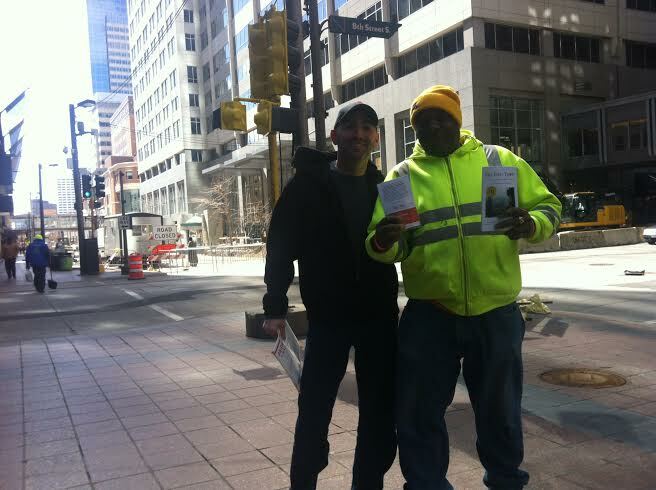 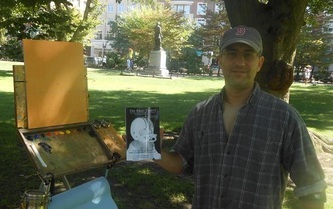 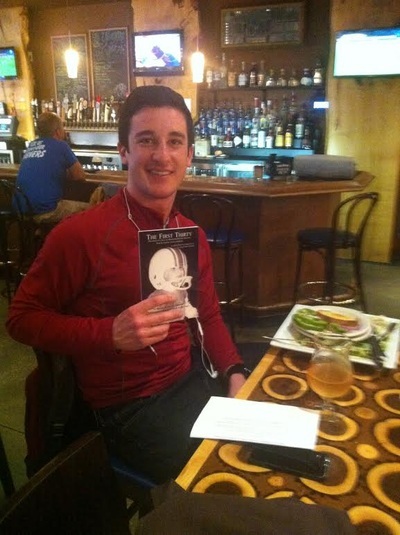 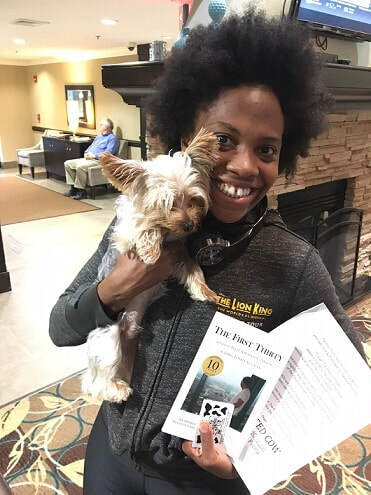 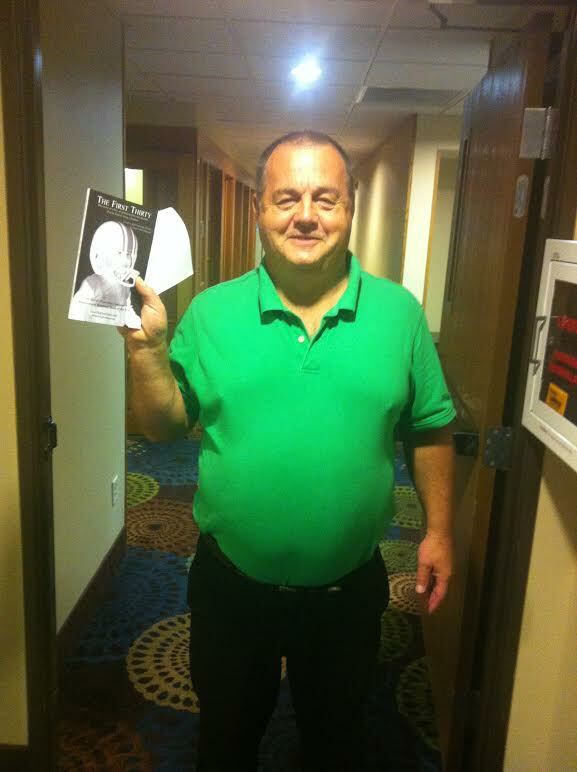 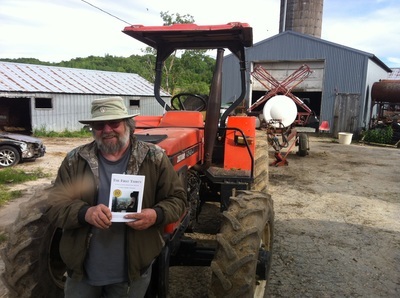 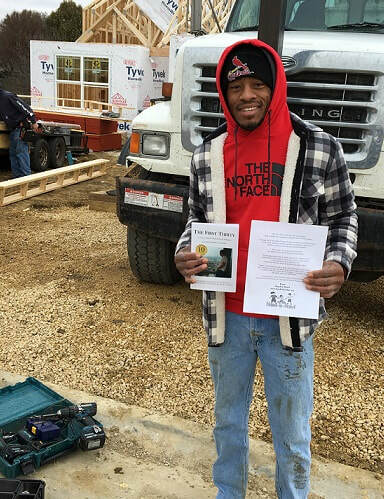 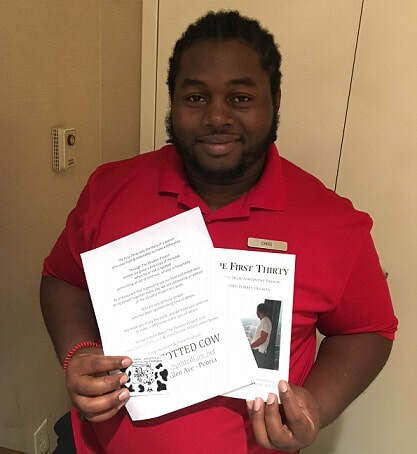 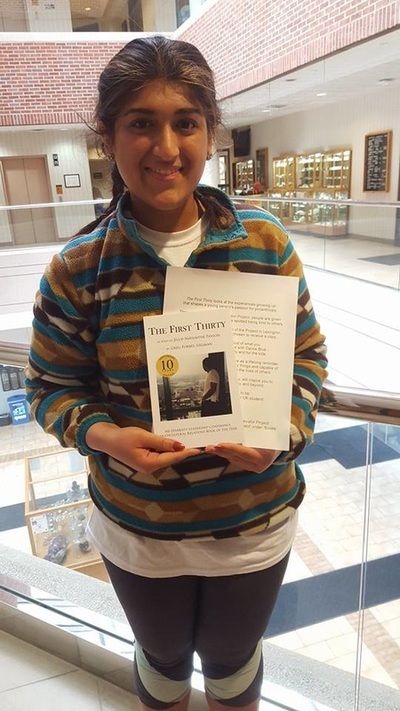 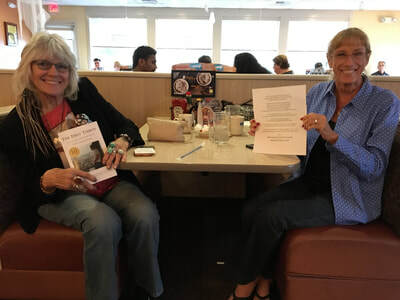 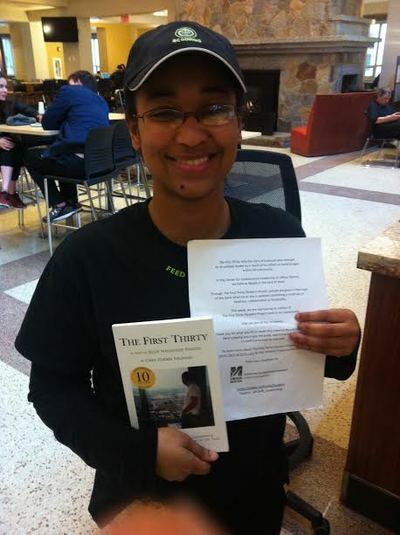 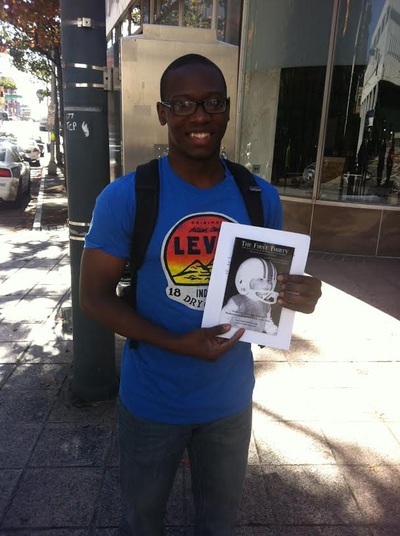 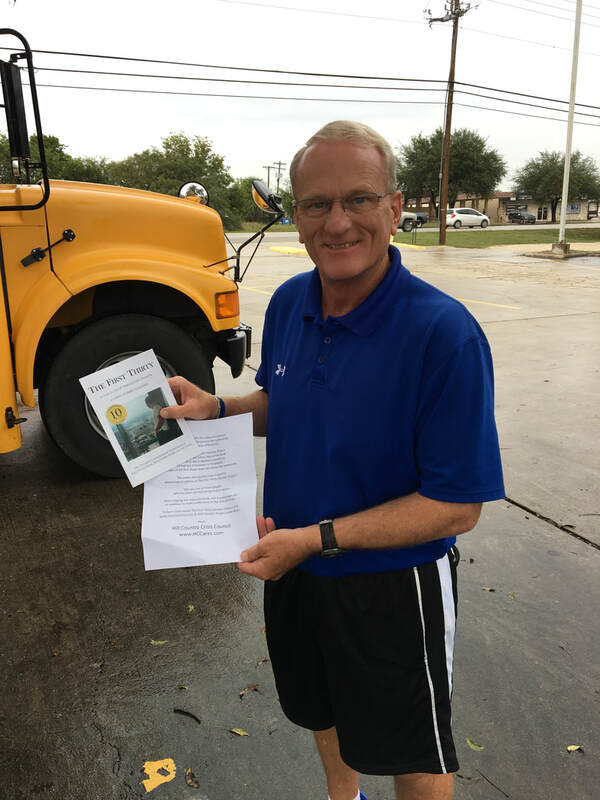 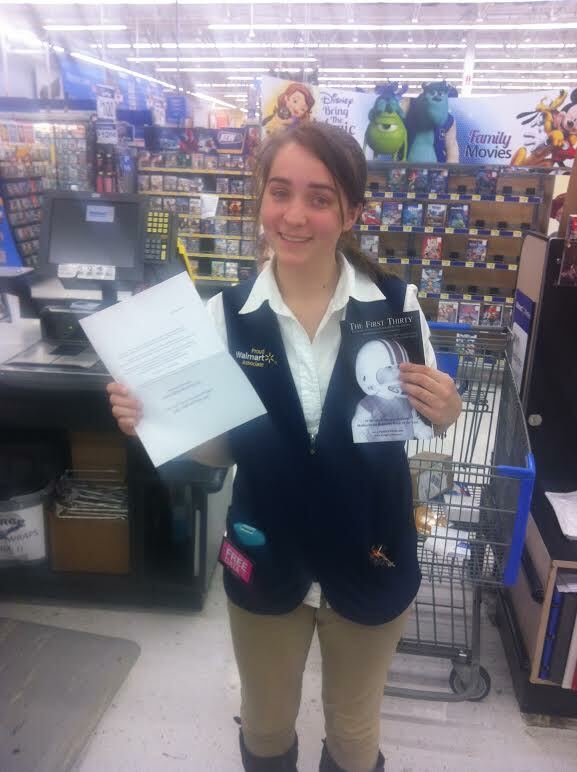 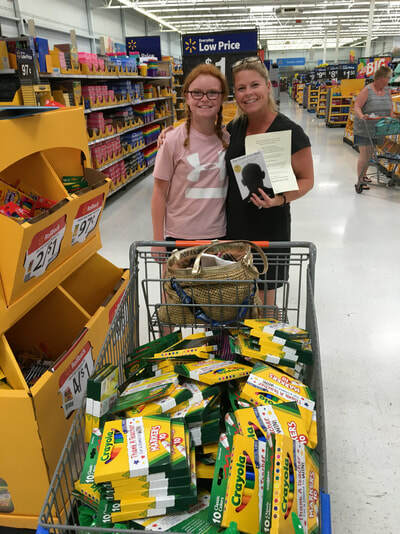 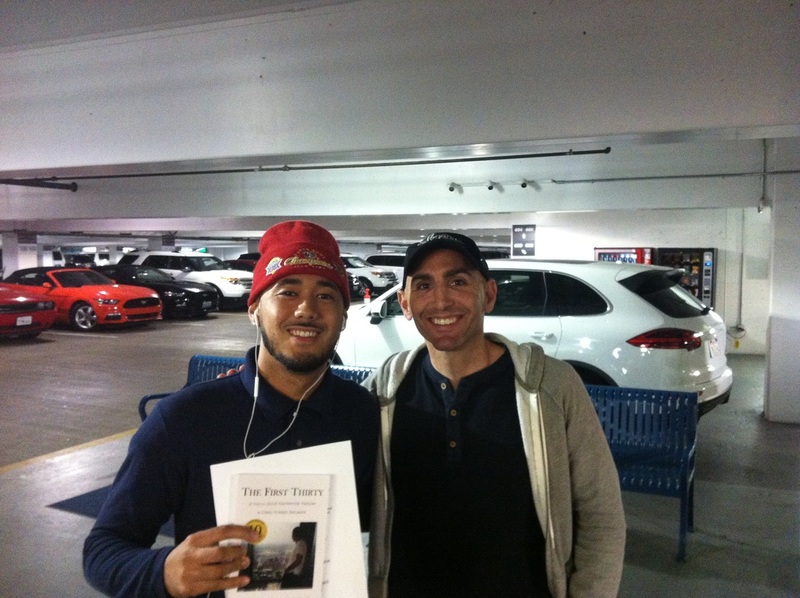 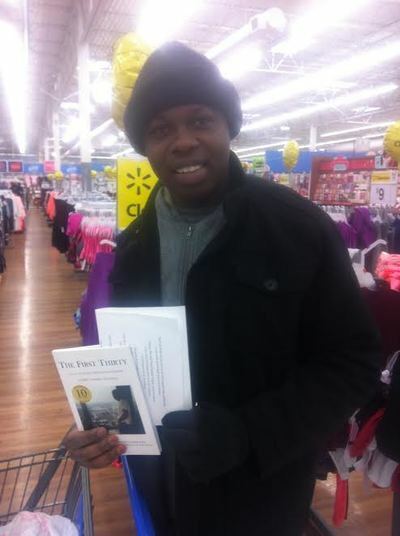 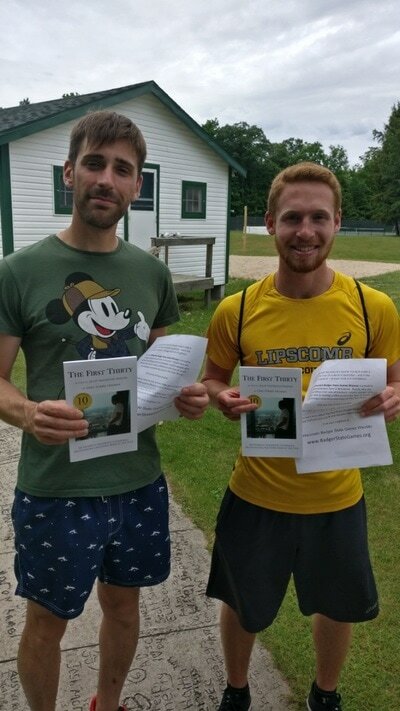 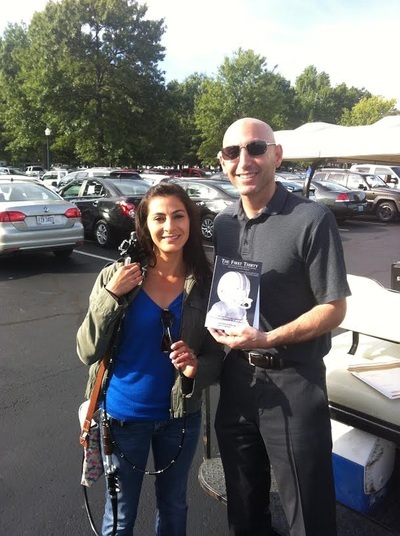 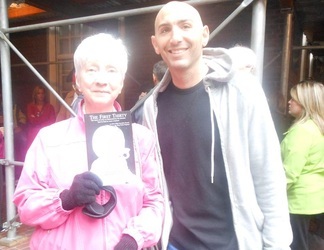 In the meantime, it has continued to take place around America - with Greg and others giving out copies, one act of kindness, one copy of The First Thirty at a time. 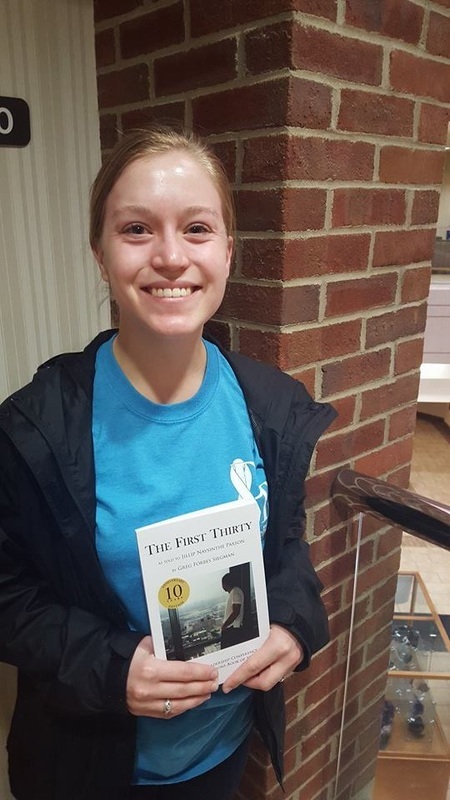 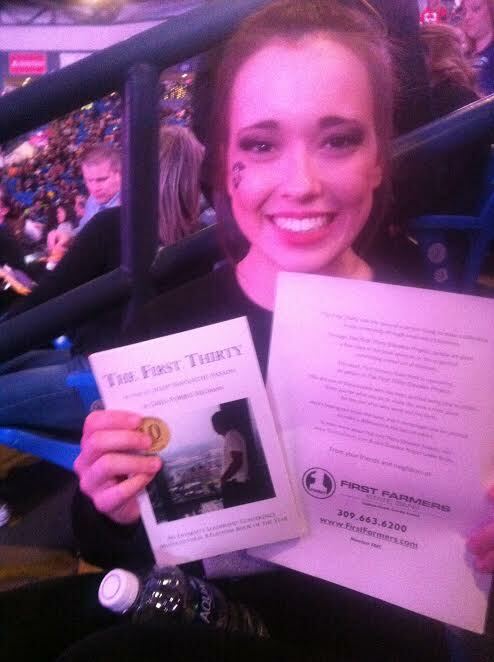 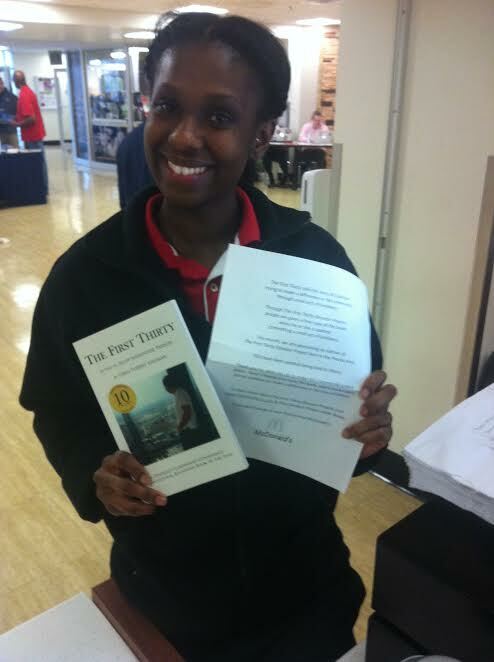 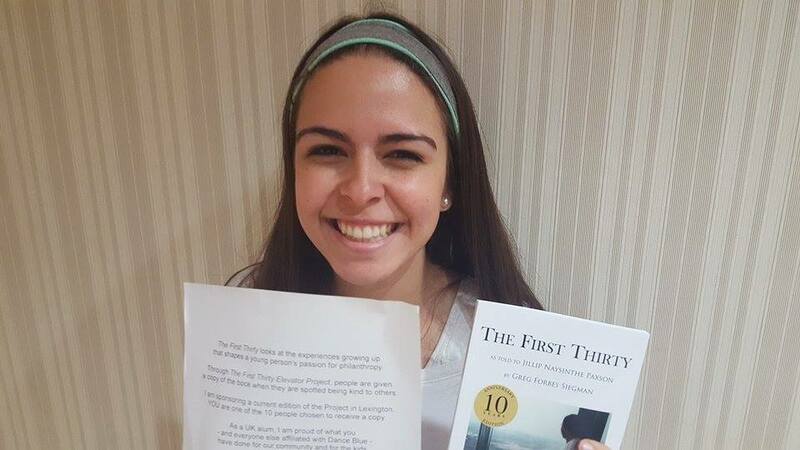 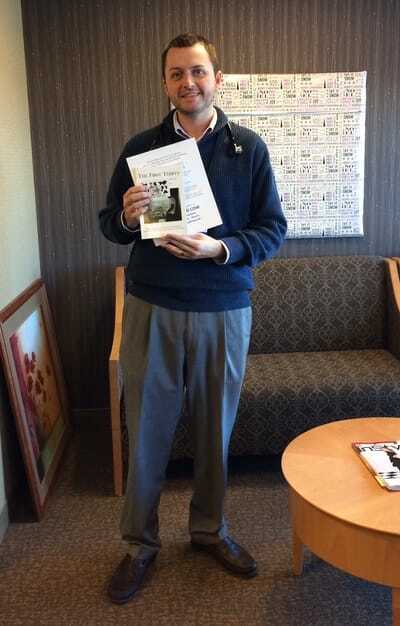 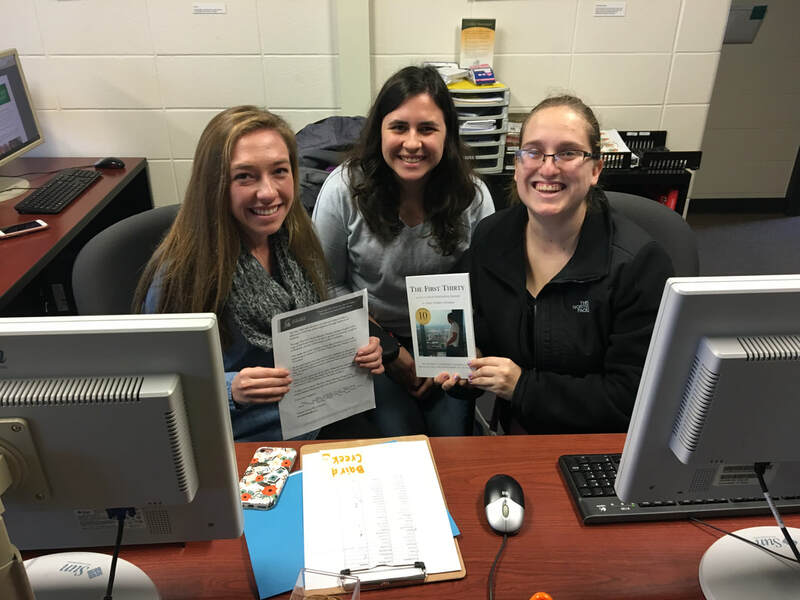 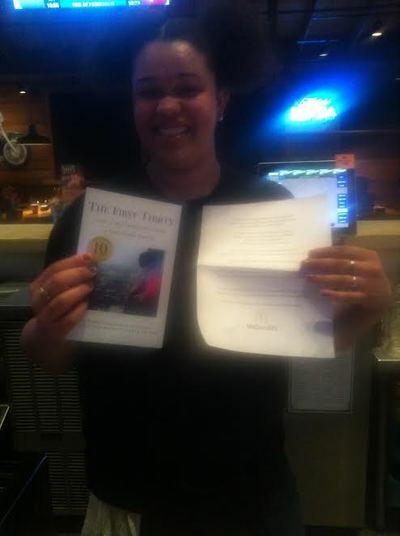 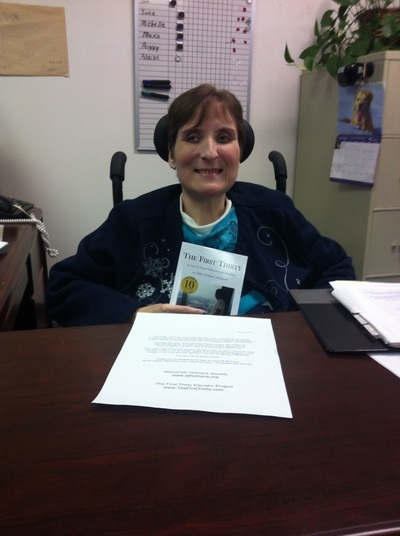 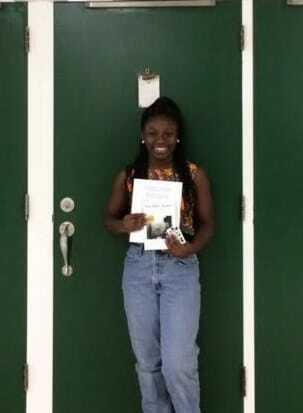 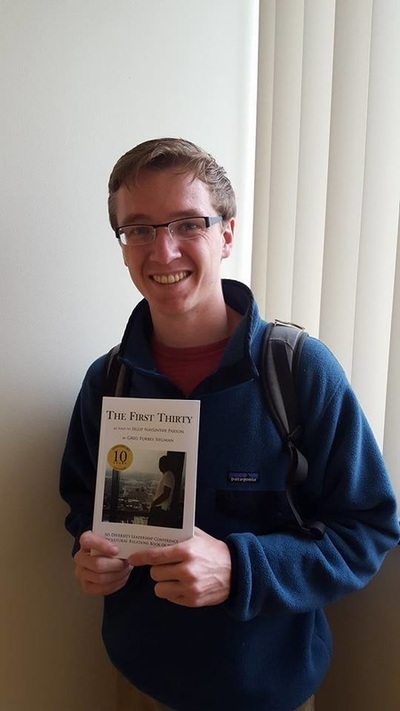 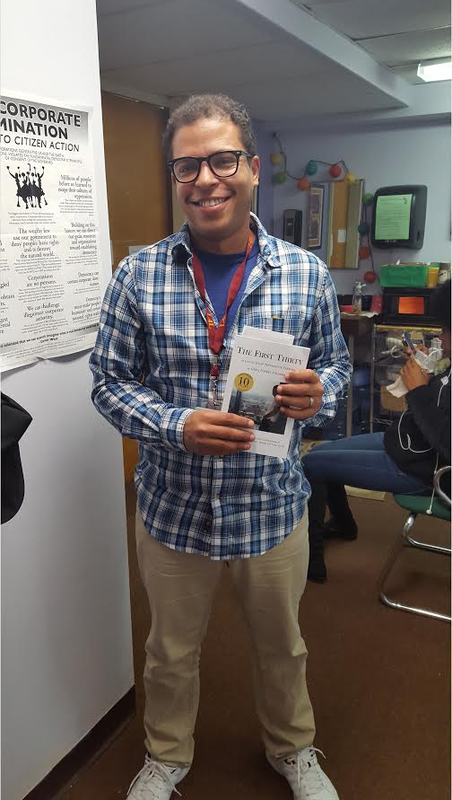 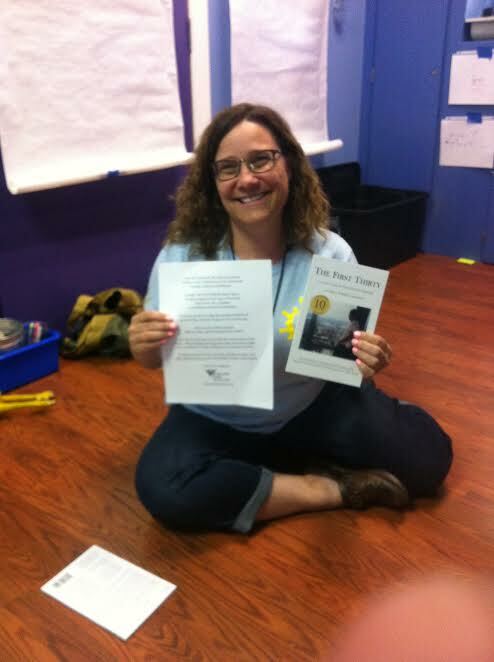 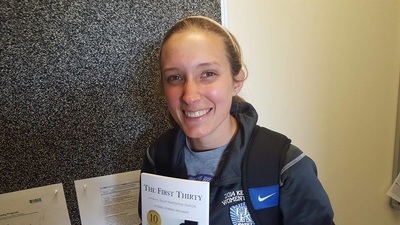 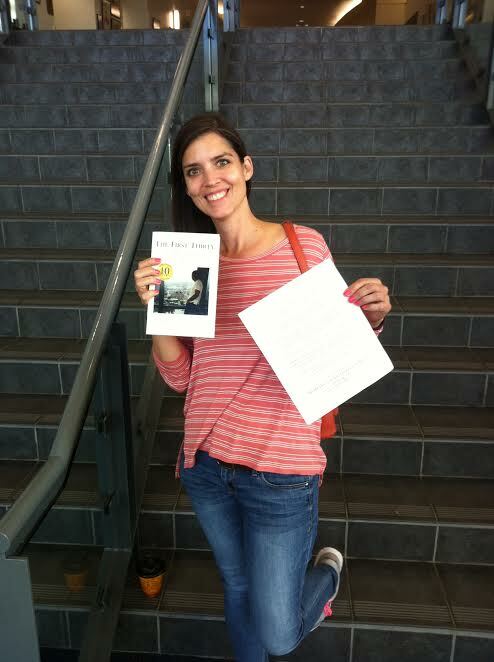 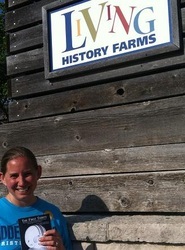 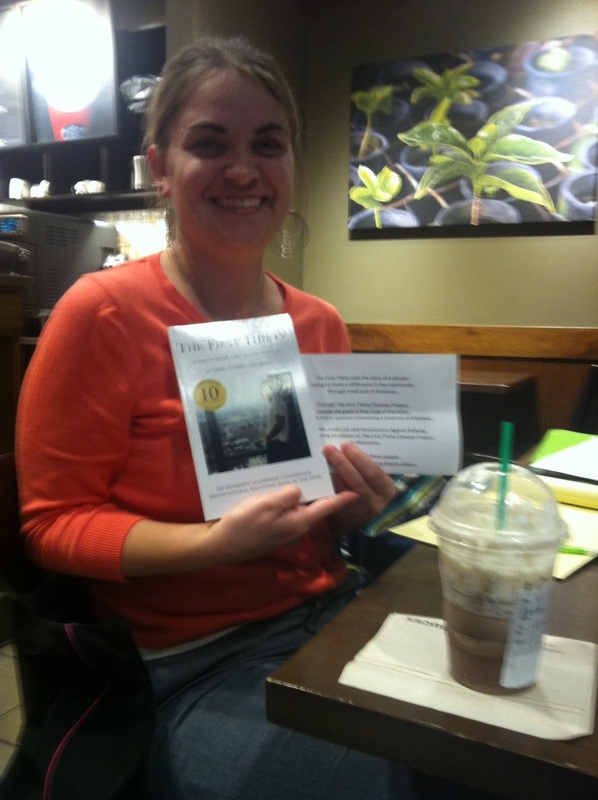 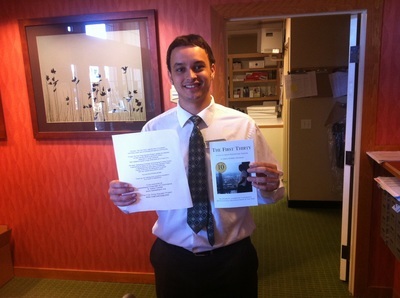 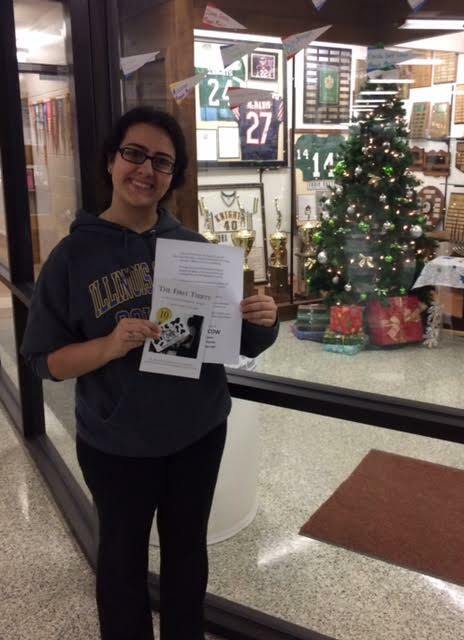 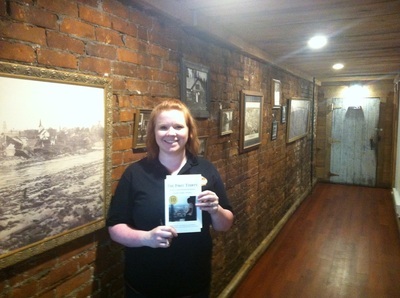 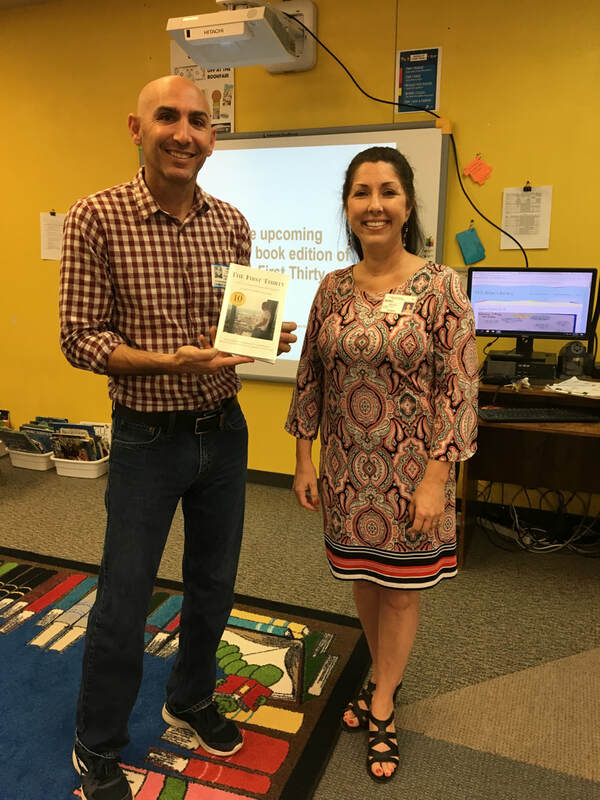 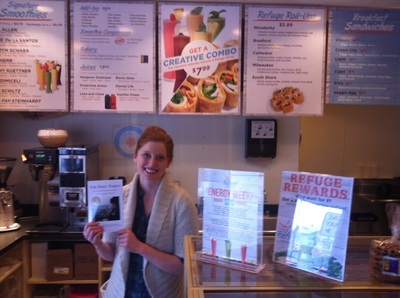 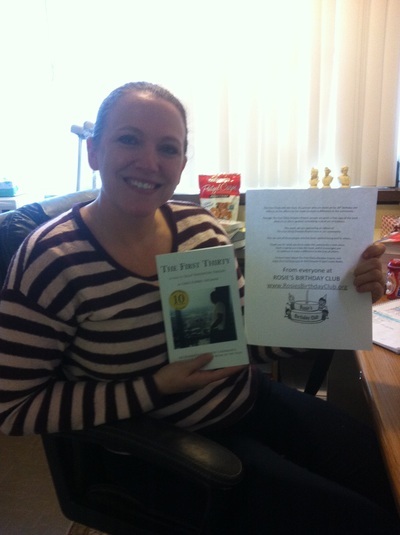 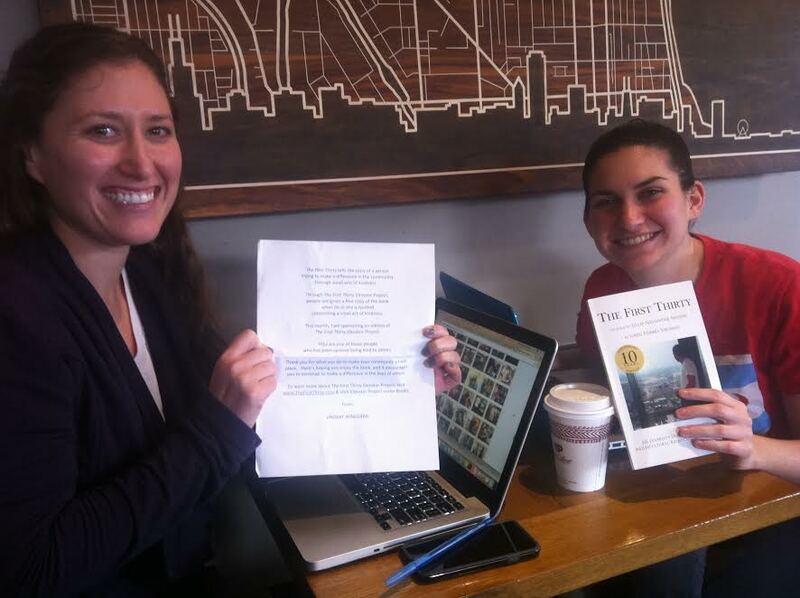 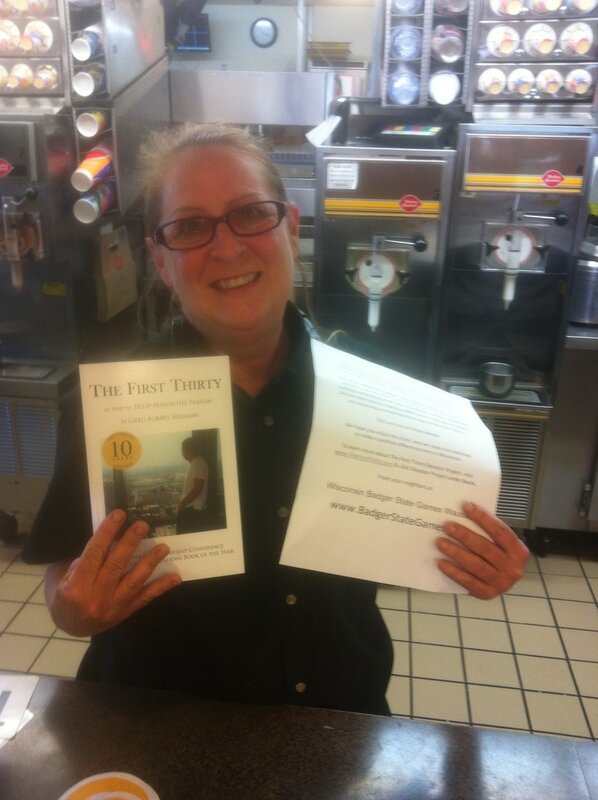 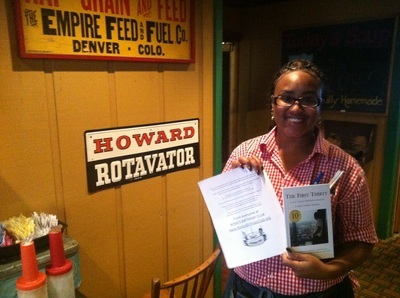 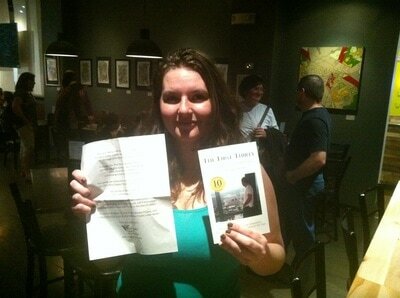 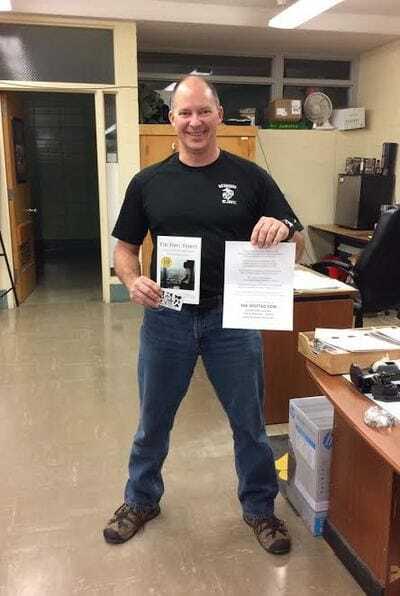 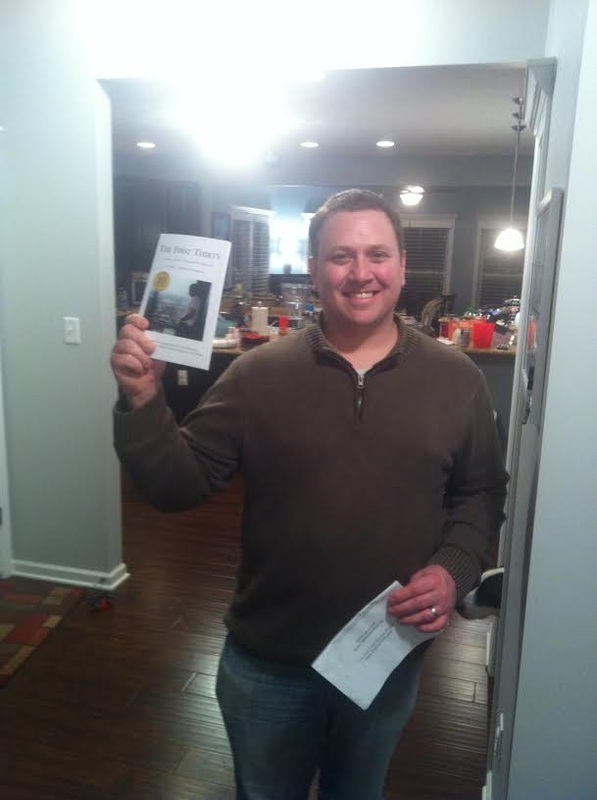 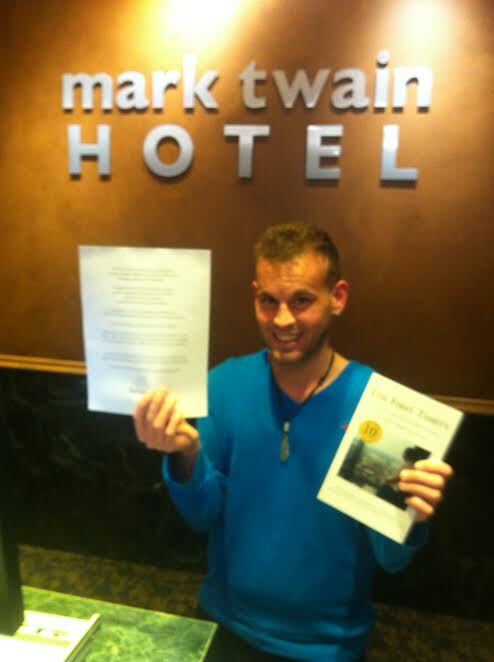 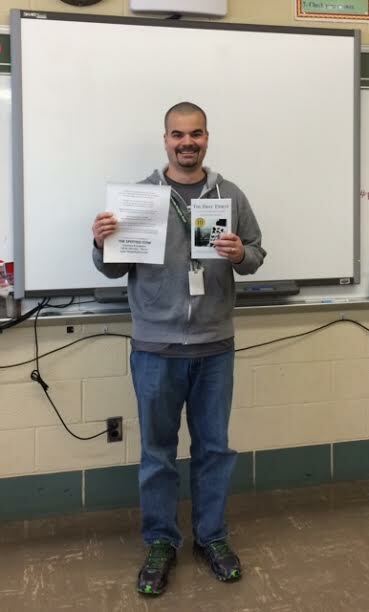 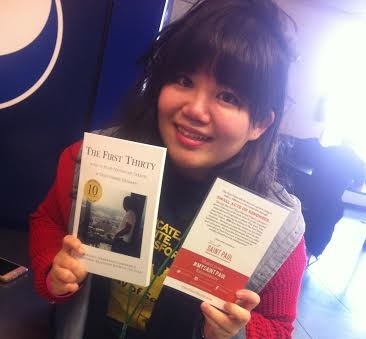 After learning of The Elevator Project, Random Acts of Kindness Foundation chose The First Thirty as a recommended read. 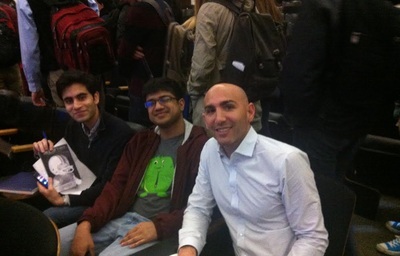 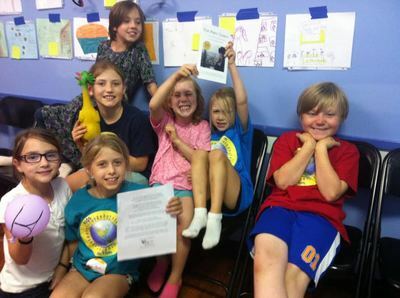 The Project was highlighted by Philanthropy Forward. 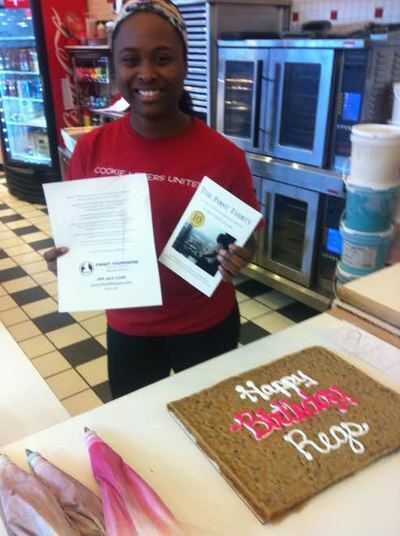 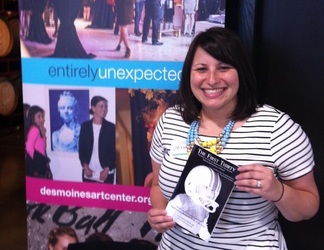 The popular nonprofit organization, Rosie's Birthday Club, featured The Elevator Project on its website after sponsoring an edition of it. 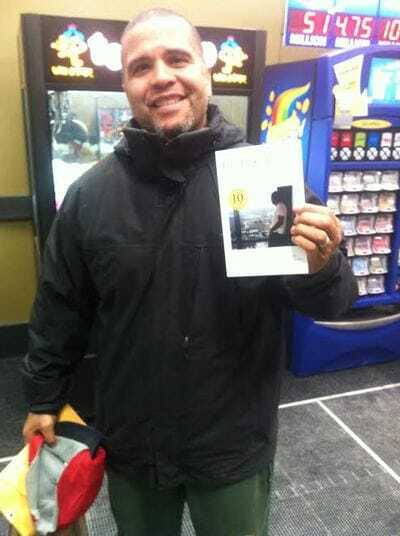 ​After an installation of the Project in Lexington, Kentucky Monthly featured The Elevator Project in its magazine. 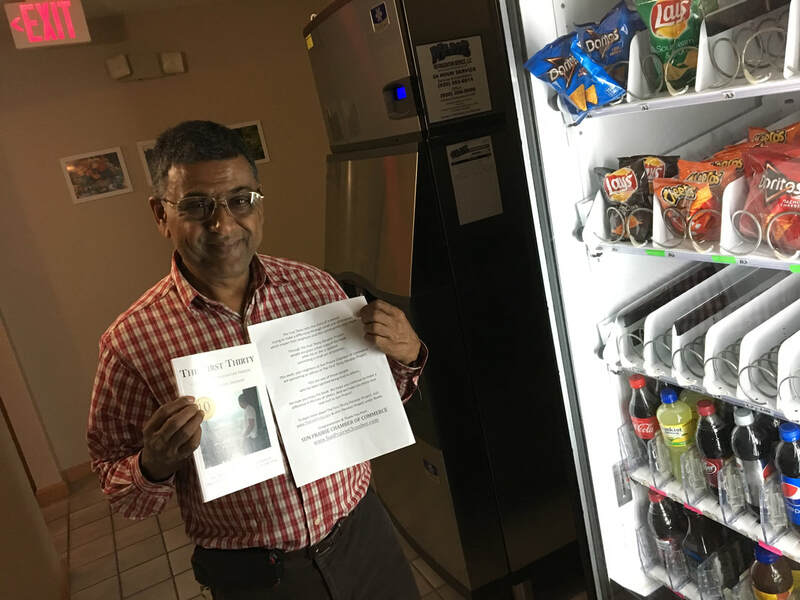 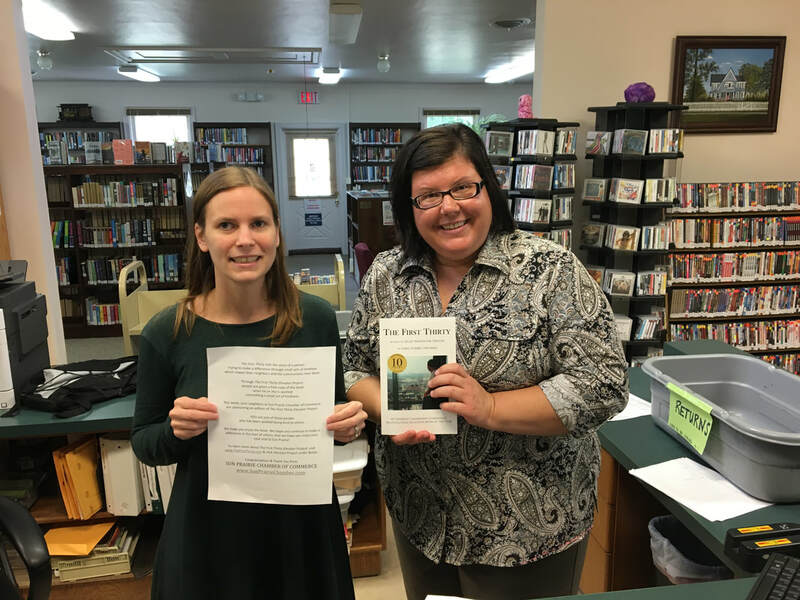 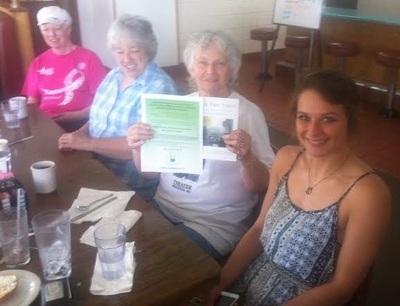 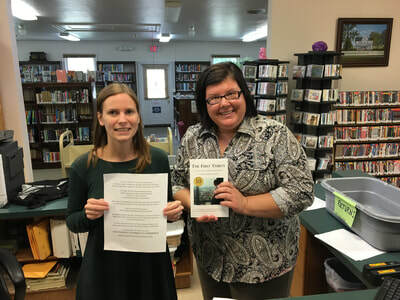 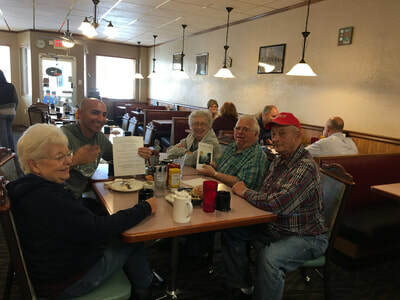 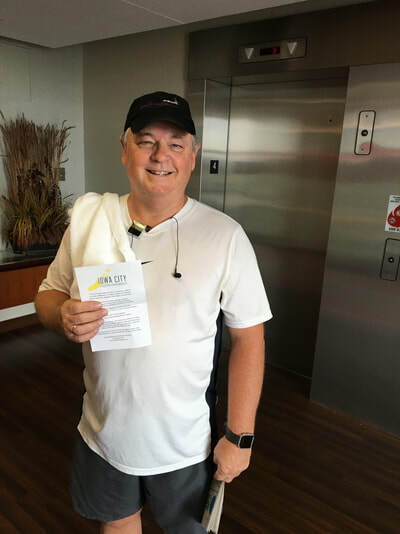 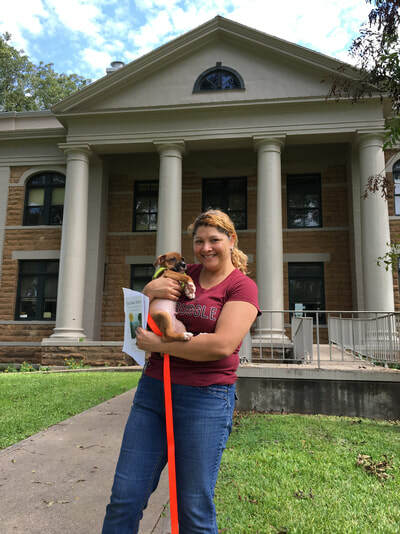 In Iowa, Dyersville Commercial ran an article "Dyersville's Kindness on Display" -- recognizing residents who were honored through The Elevator Project. 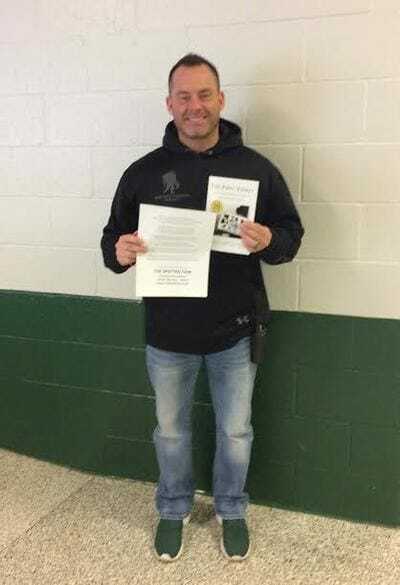 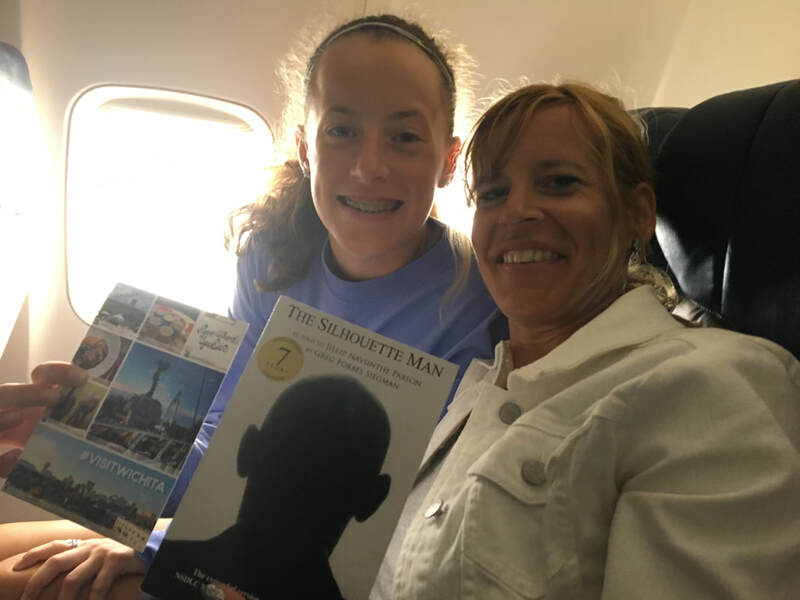 Pro golfer Jeff Hatten ordered the book to recognize an inspiring young student-athlete who stuck up for another boy teased by classmates. 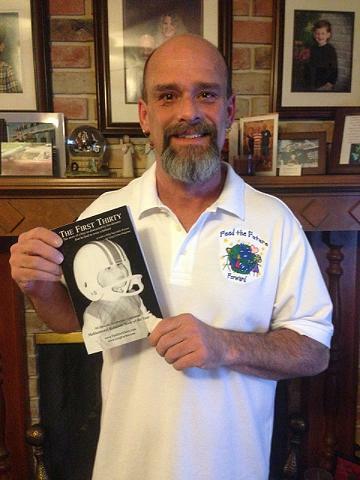 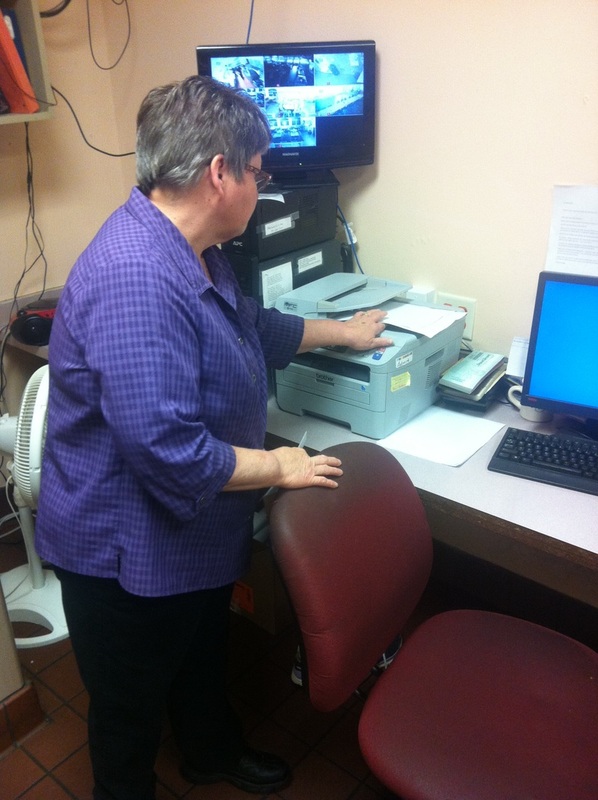 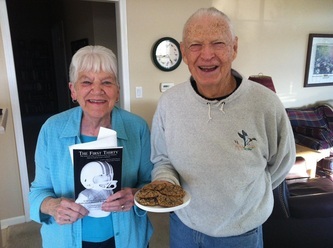 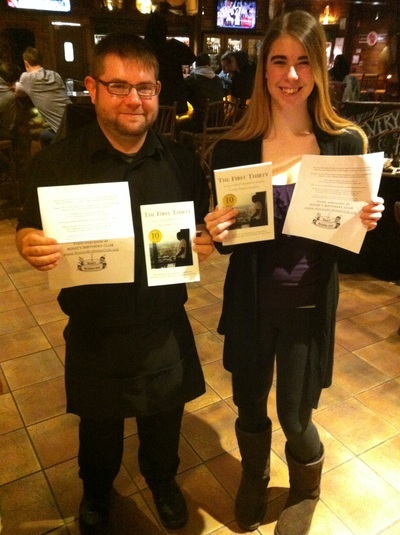 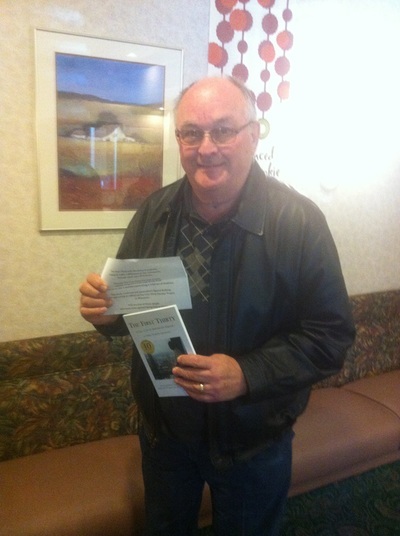 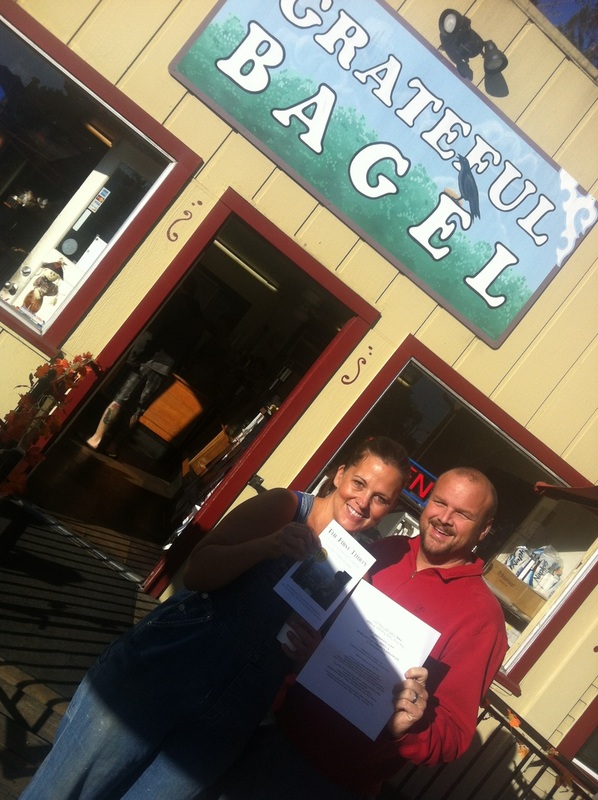 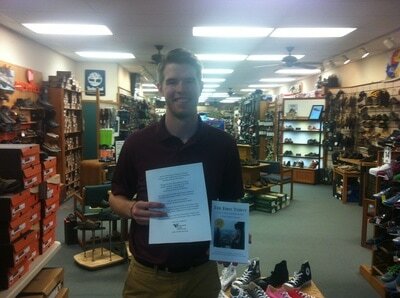 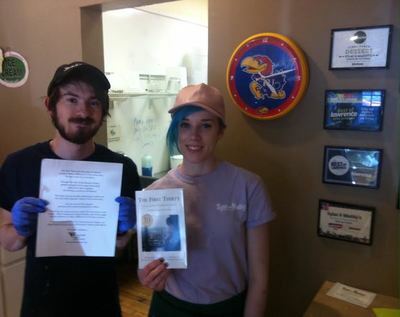 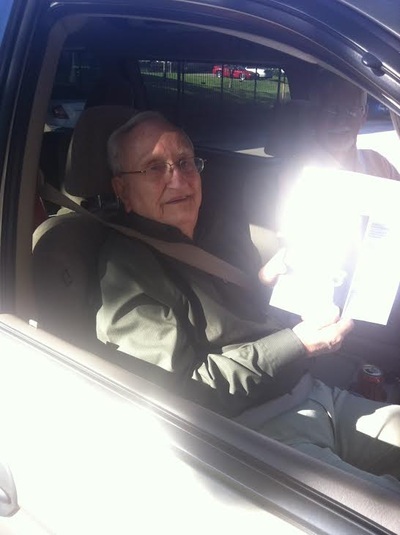 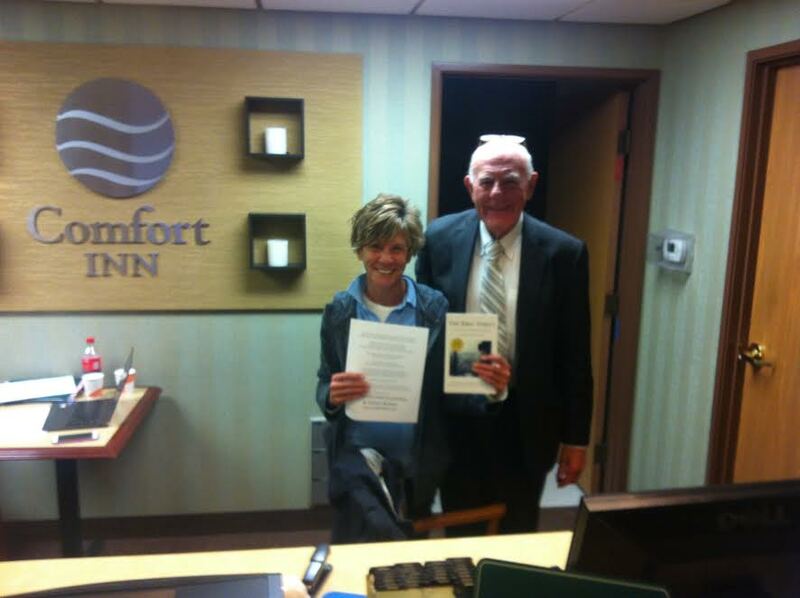 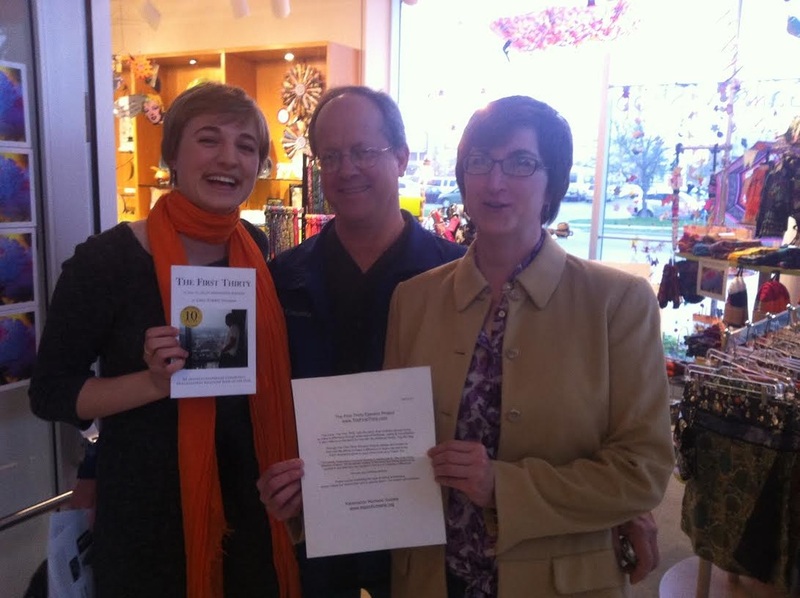 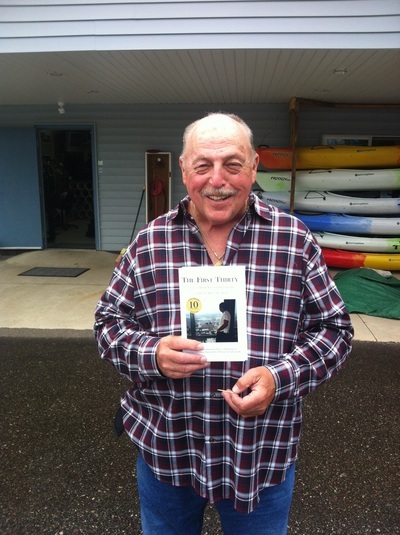 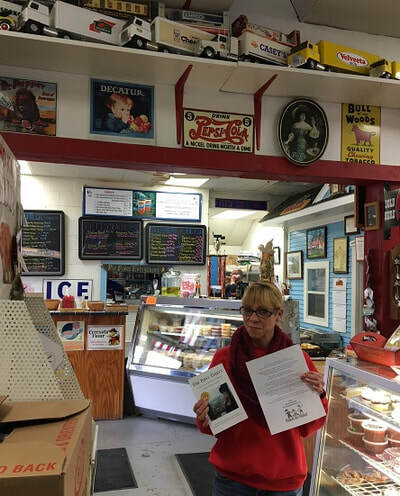 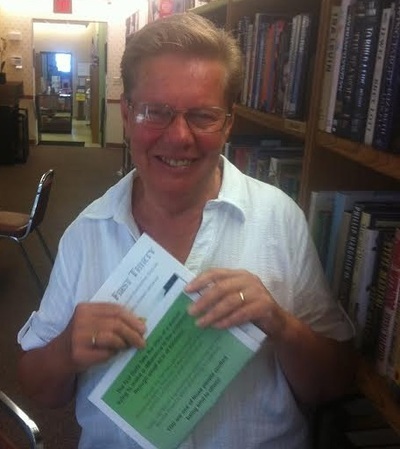 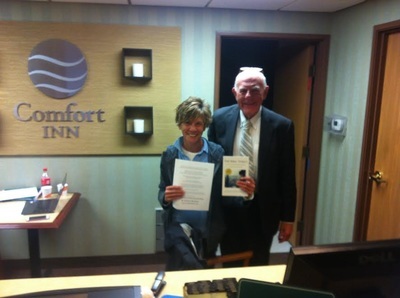 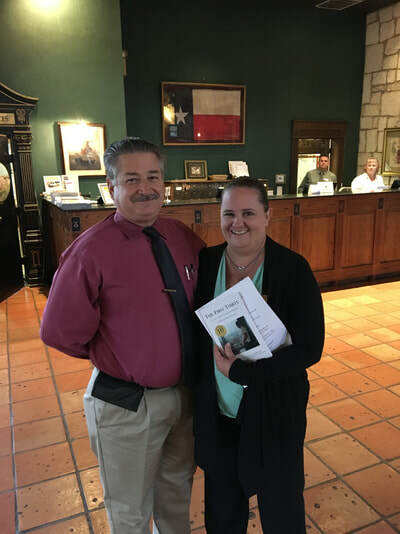 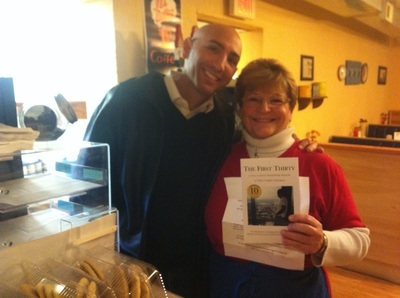 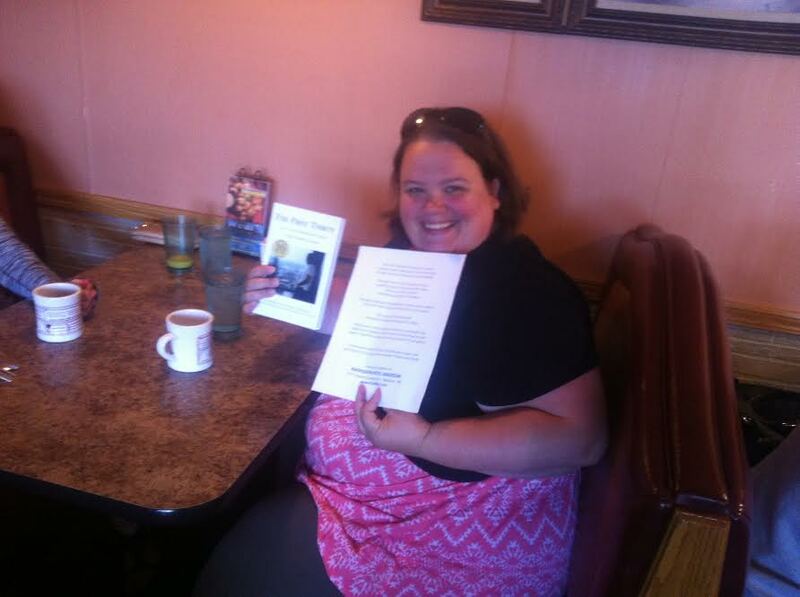 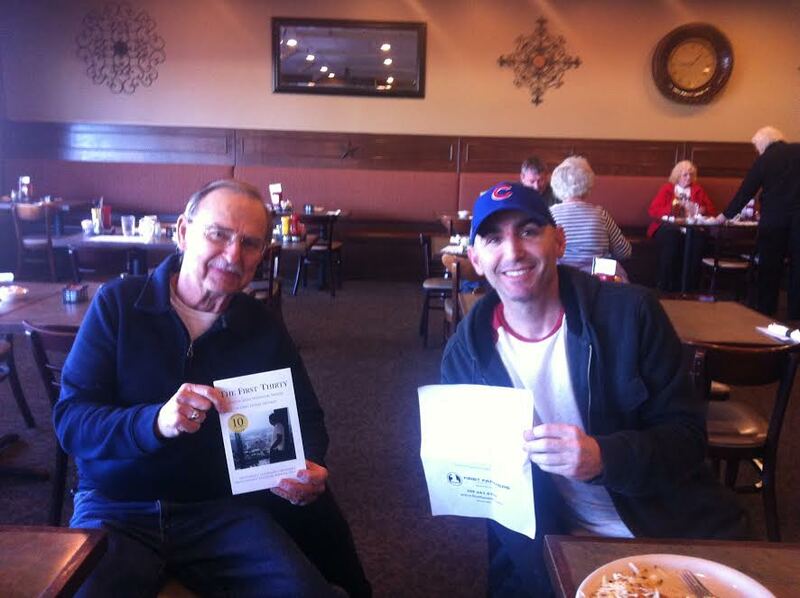 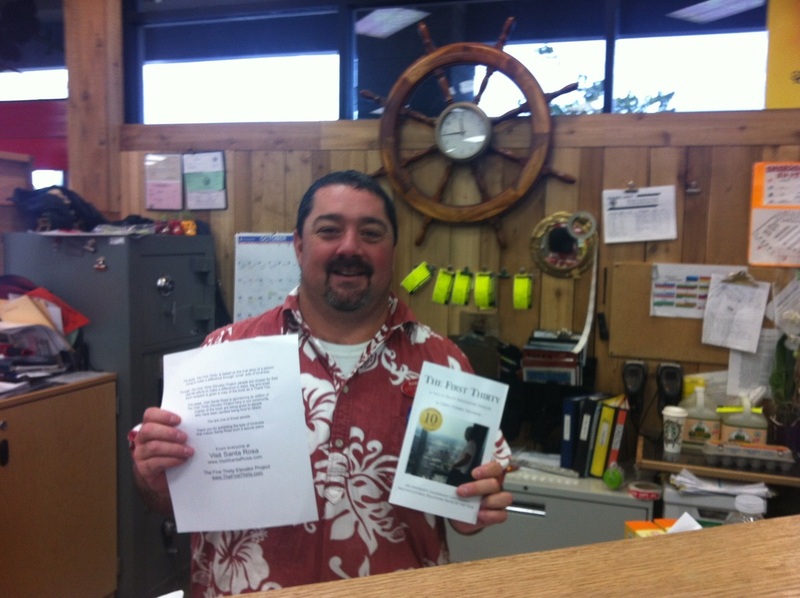 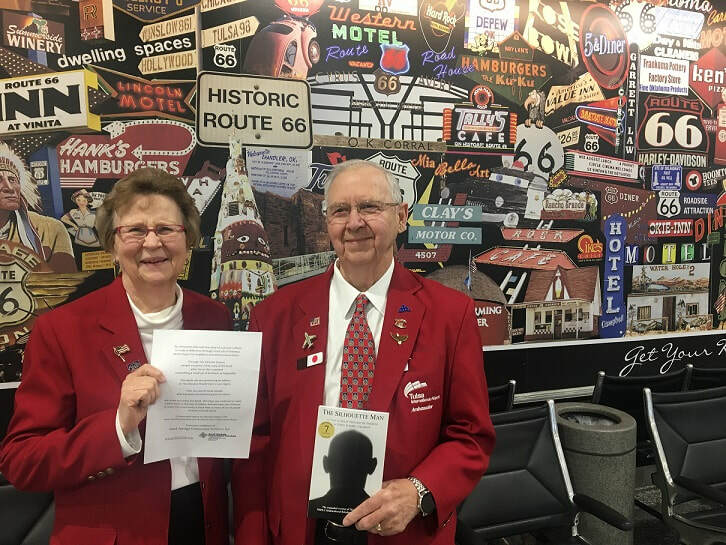 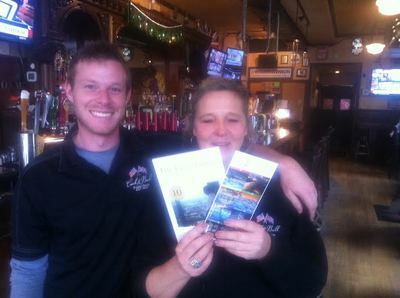 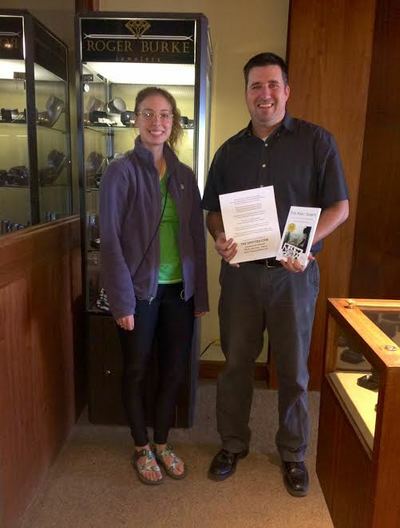 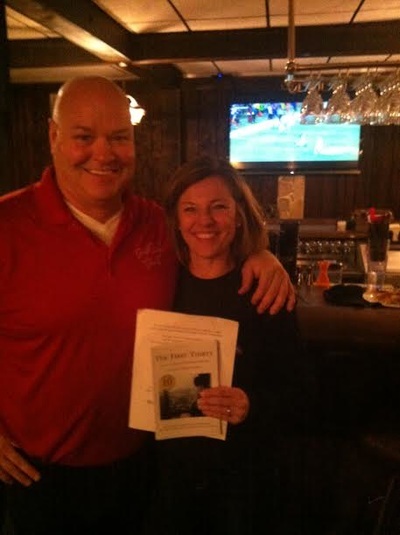 Mayor Mike Gamache & his wife Beth ordered copies to recognize people in the Mayor's hometown who treat people nicely. Eagle Elevator, Open Hand & KONE Corporation each ordered copies to be given to people who were kind to others (in Boston, Atlanta & Mt. 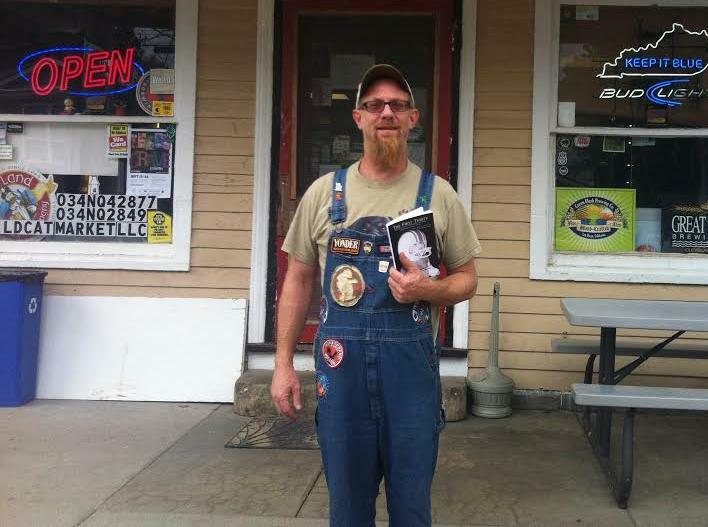 Joy, PA). 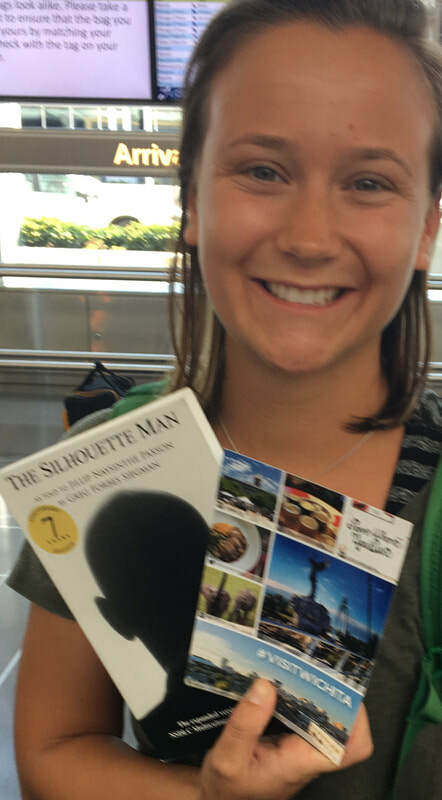 In 2008, The First Thirty's expanded edition, The Silhouette Man, was released. 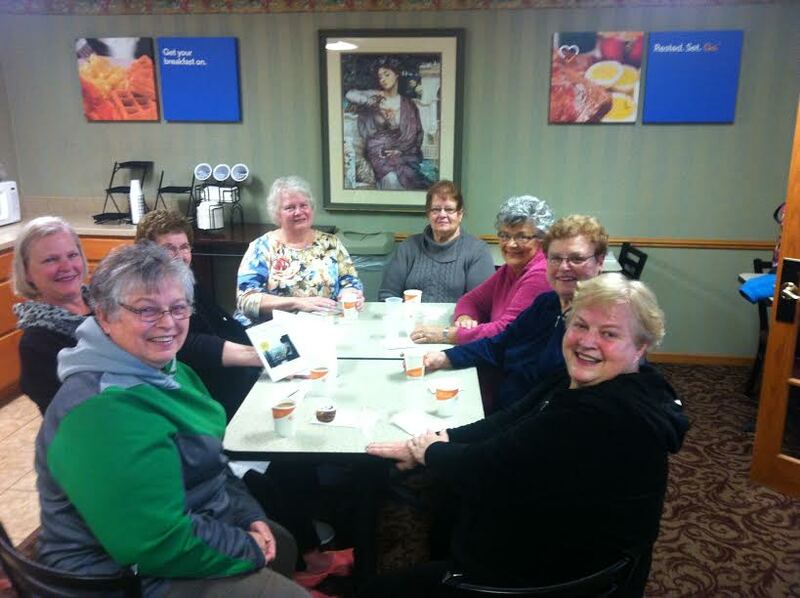 At times, groups (i.e. 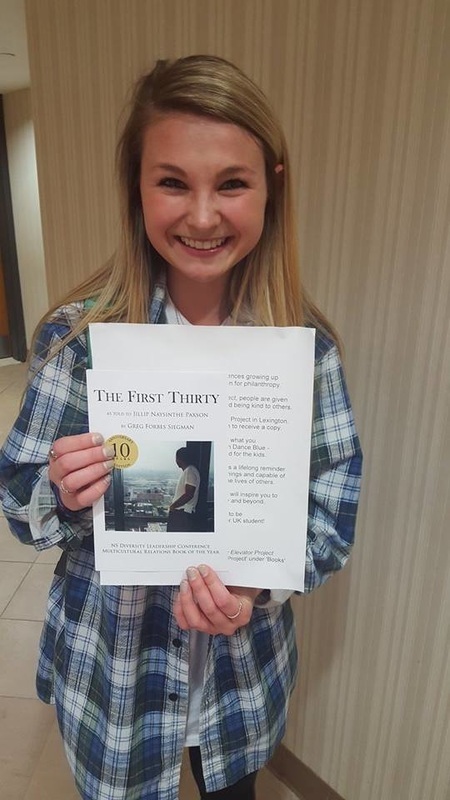 Visit Montgomery) began sponsoring The Elevator Project utilizing The Silhouette Man as well -- while others continued to do it with The First Thirty. 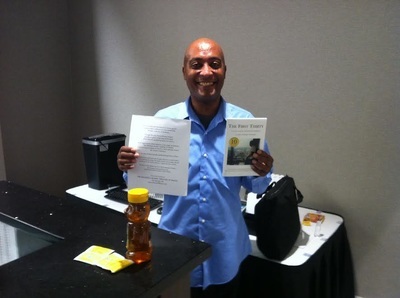 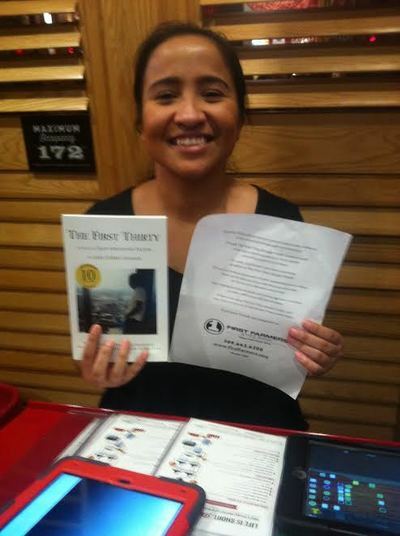 In some cases, groups also began utilizing the books themselves while simultaneously sponsoring the Project in its regular format. 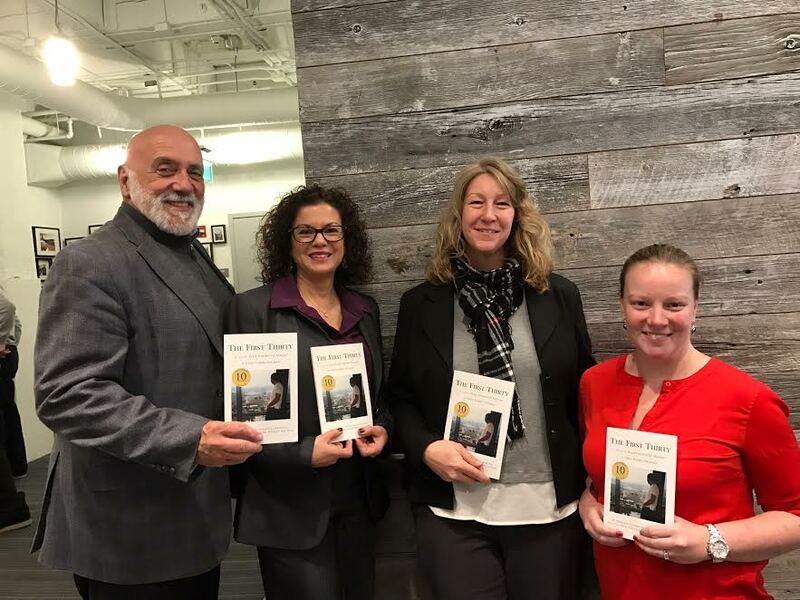 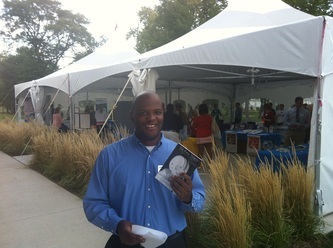 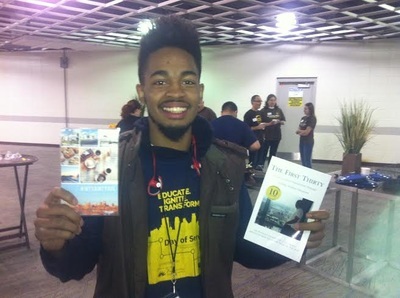 Center for Collaborative Leadership at UMass Boston sponsored an edition of The Elevator Project. 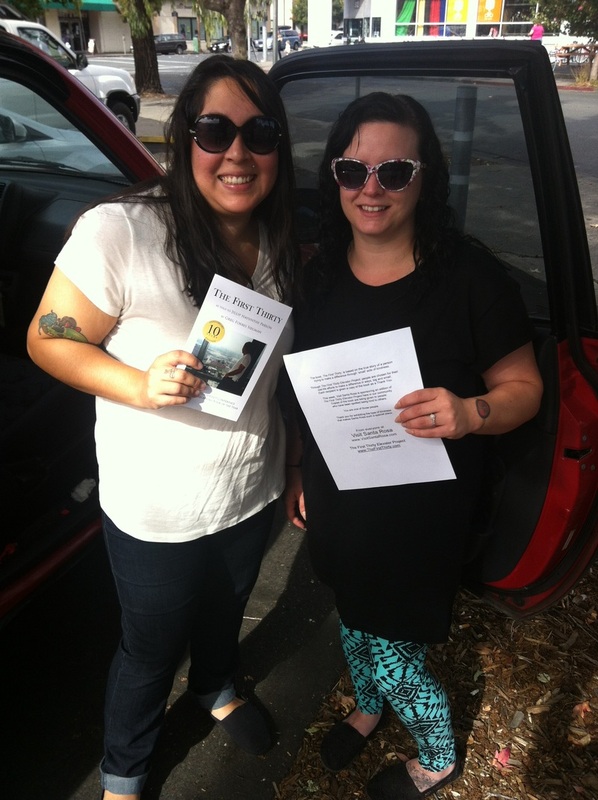 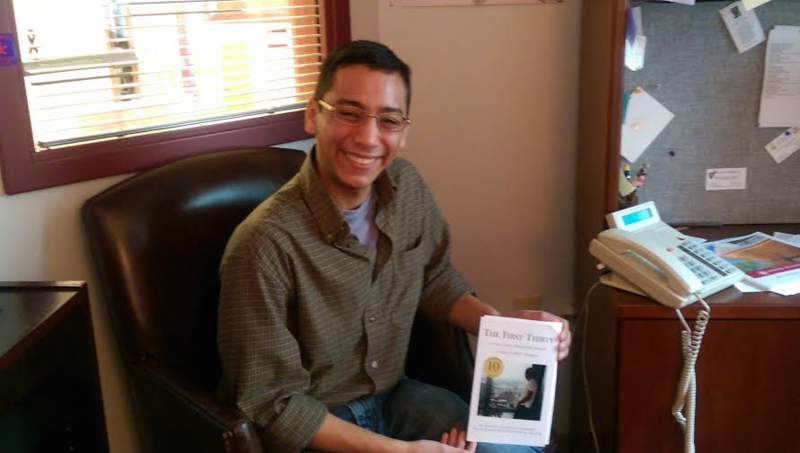 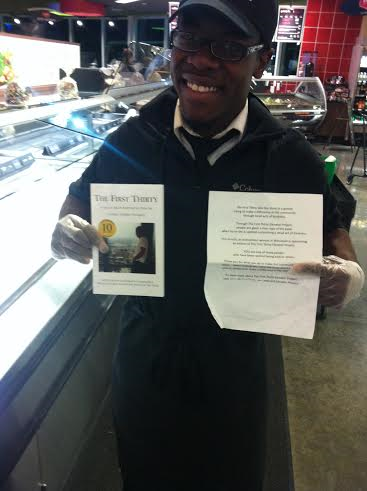 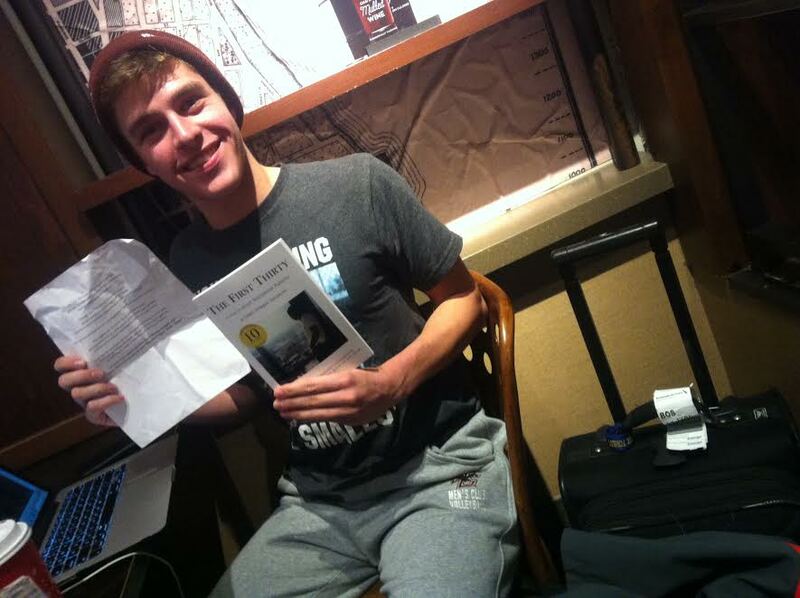 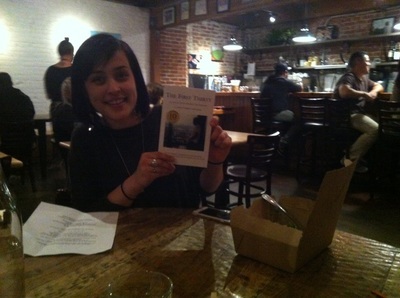 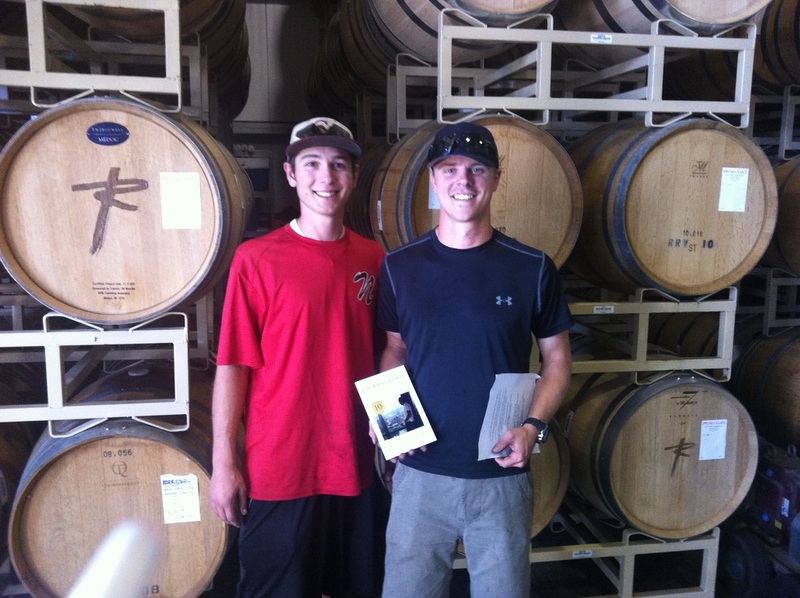 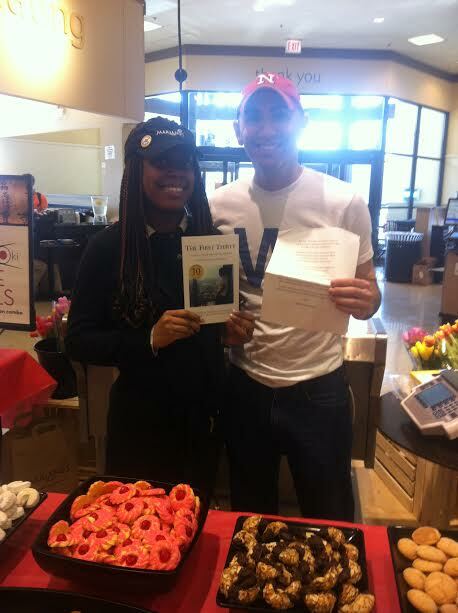 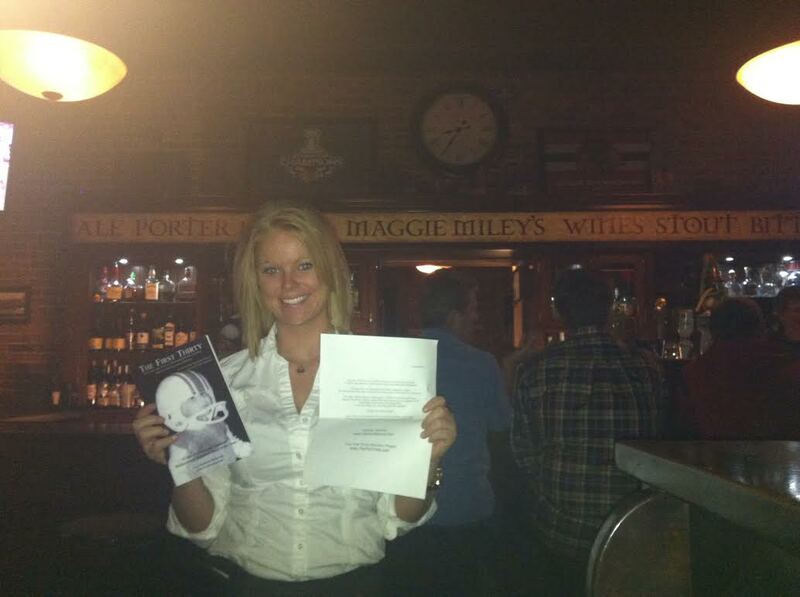 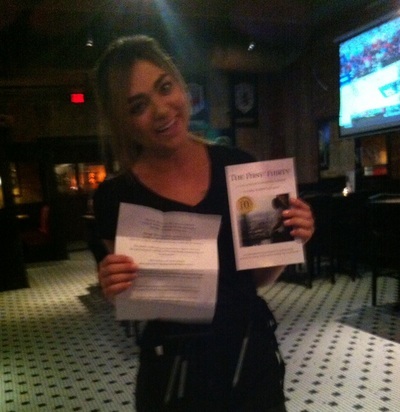 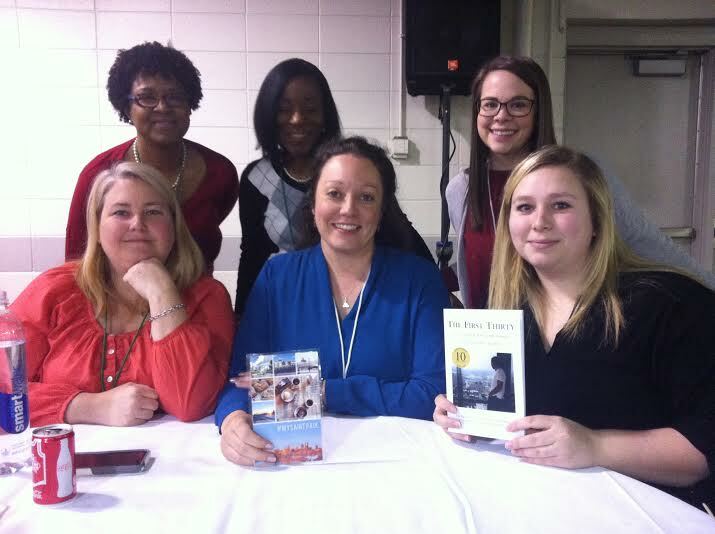 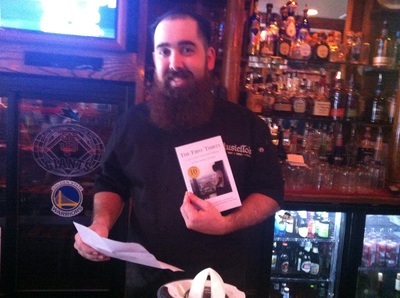 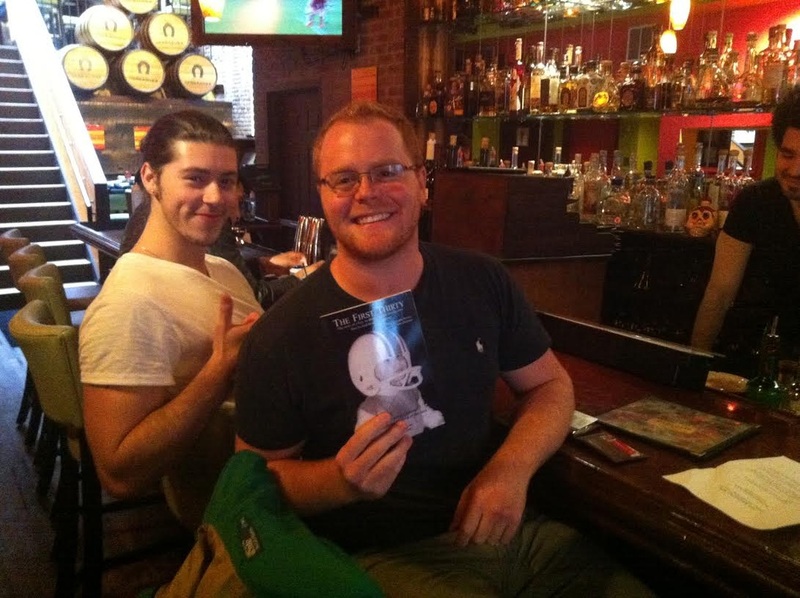 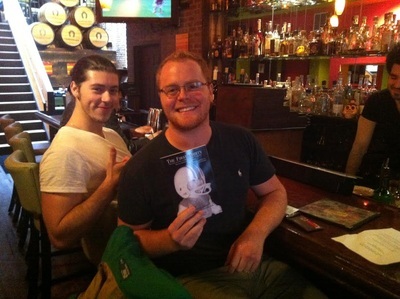 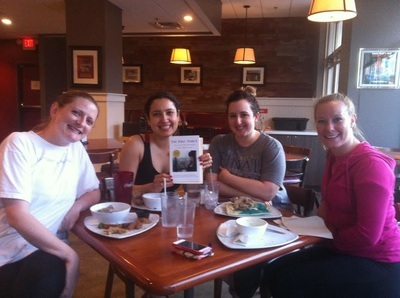 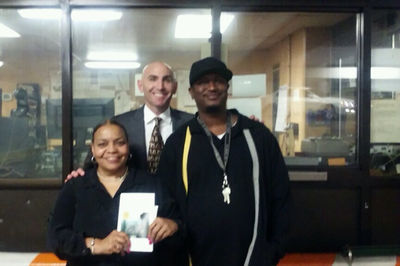 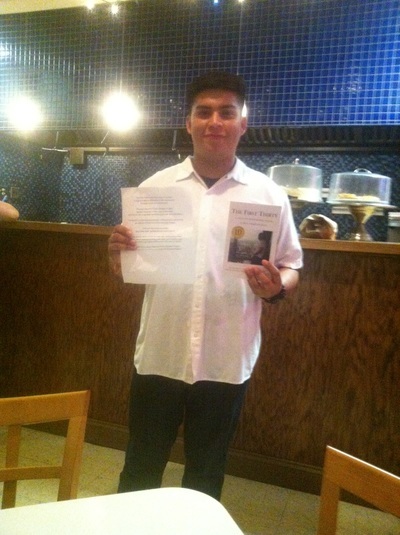 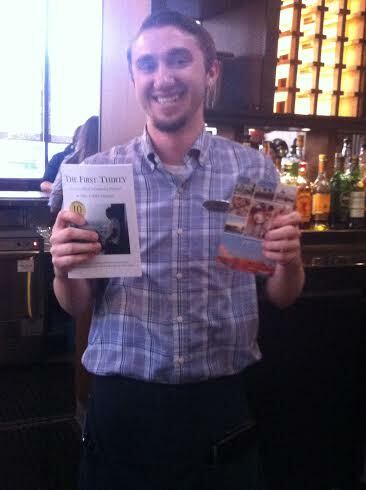 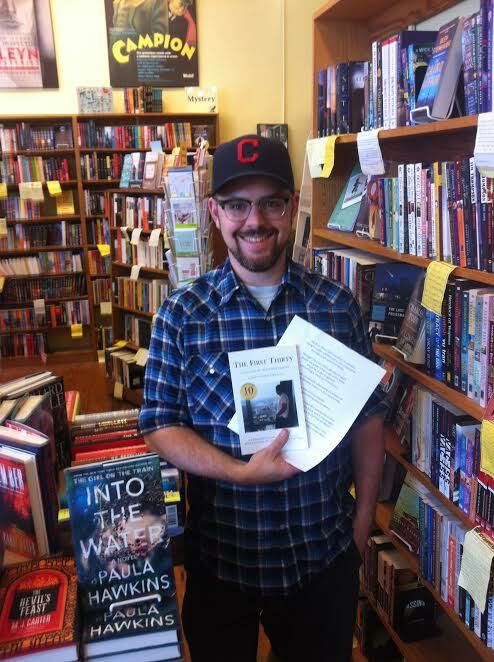 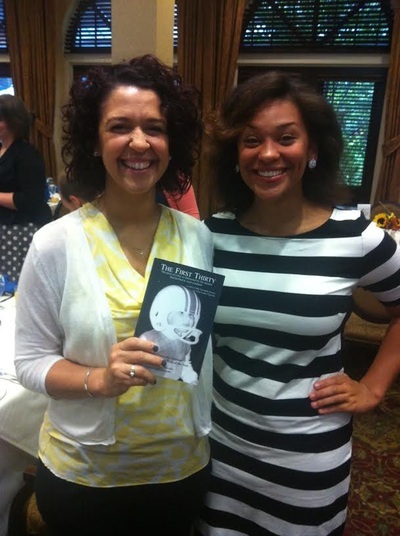 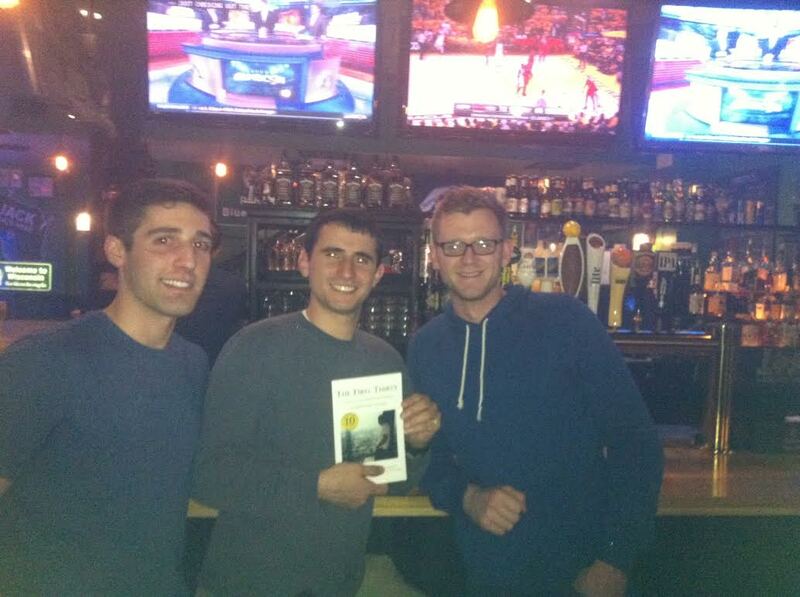 They also ordered copies to do a book club-style read of the book with their own staff. 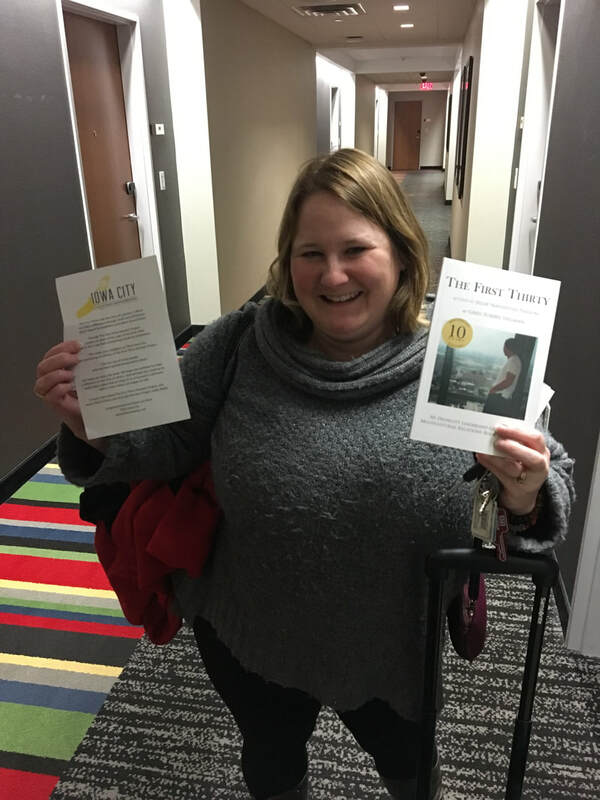 meetNKY | Northern Kentucky CVB did the same thing: They sponsored an edition of The Elevator Project in their region. 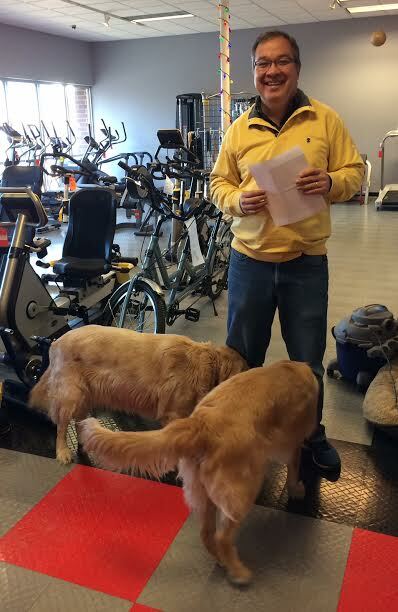 In addition, they ordered copies for their own staff. 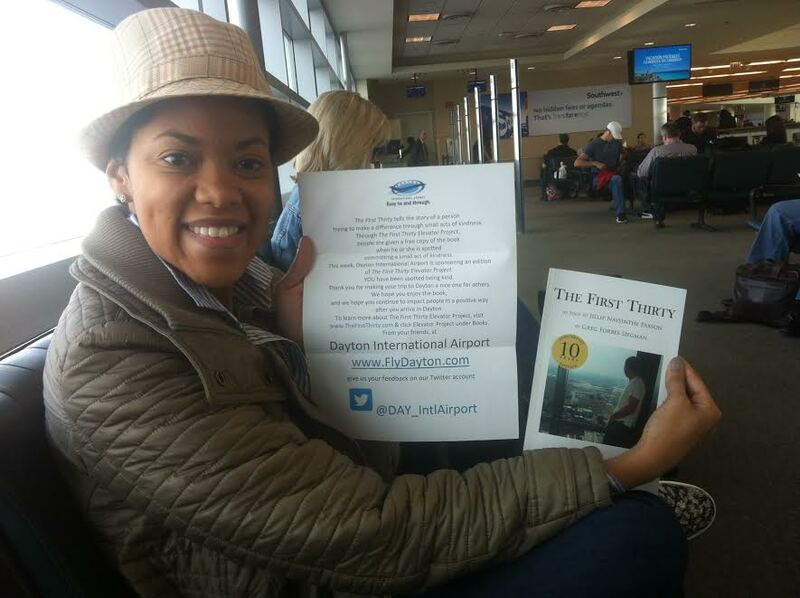 Dayton International Airport sponsored an edition of the Project for flights to and from Dayton. 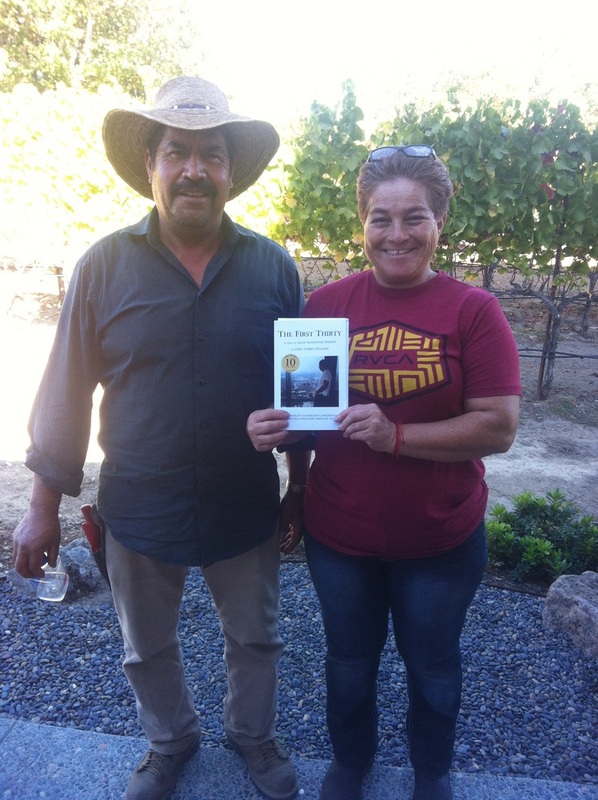 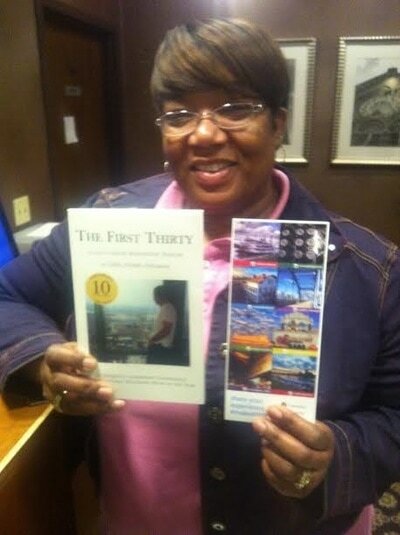 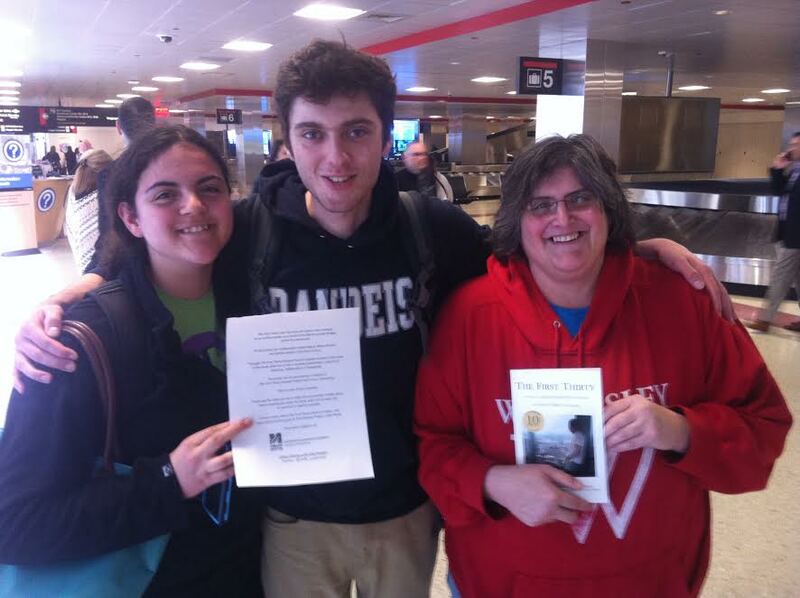 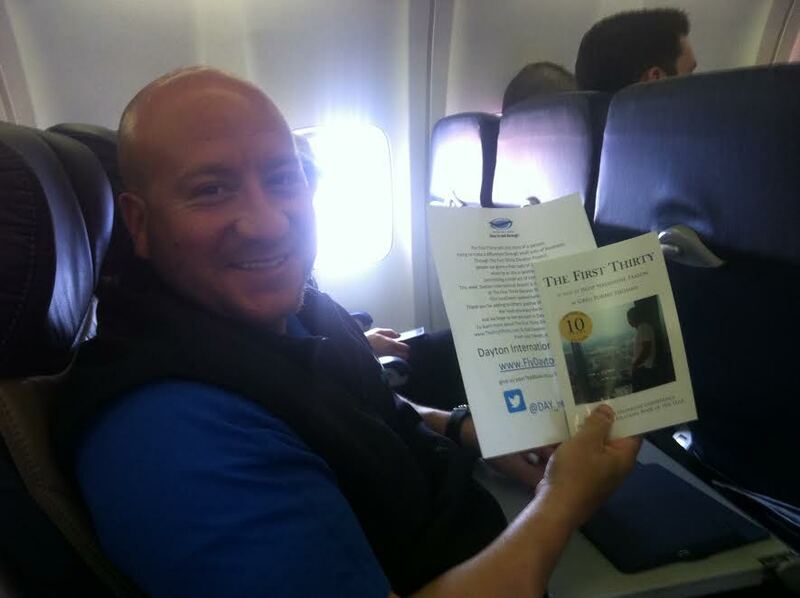 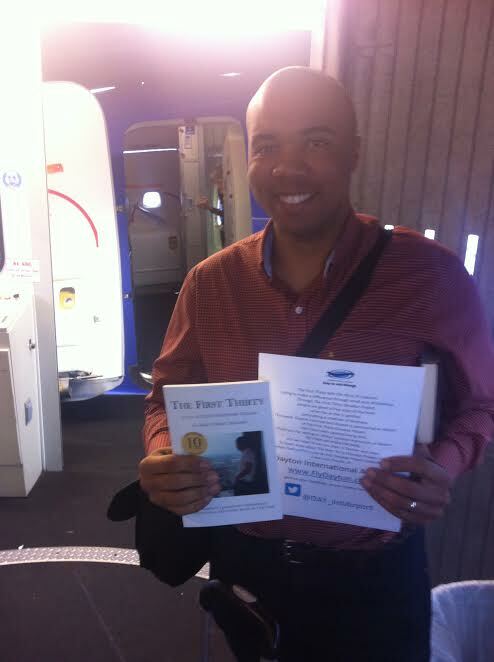 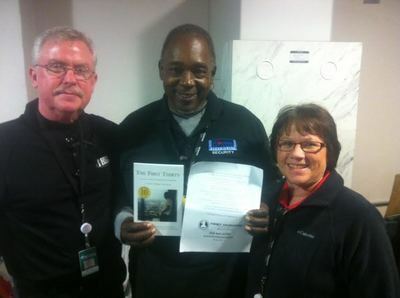 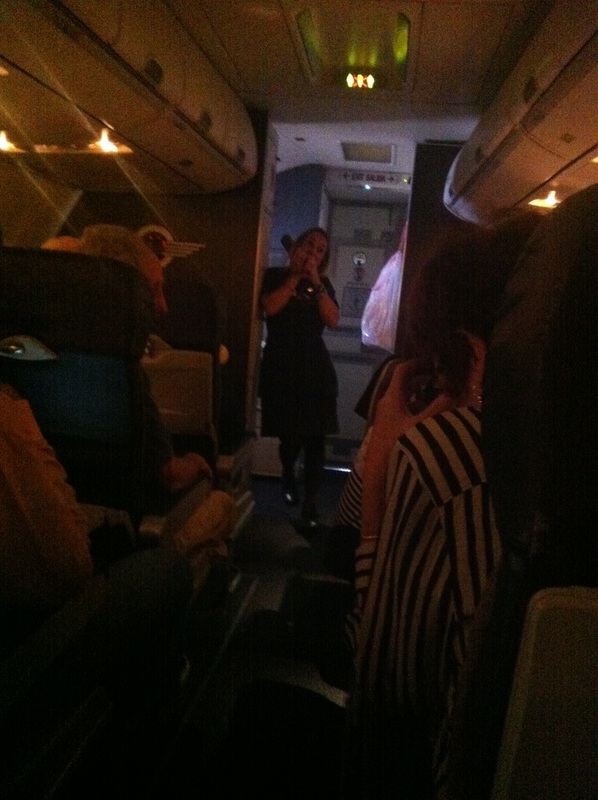 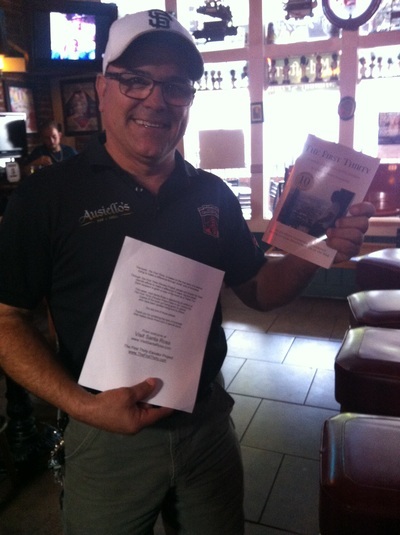 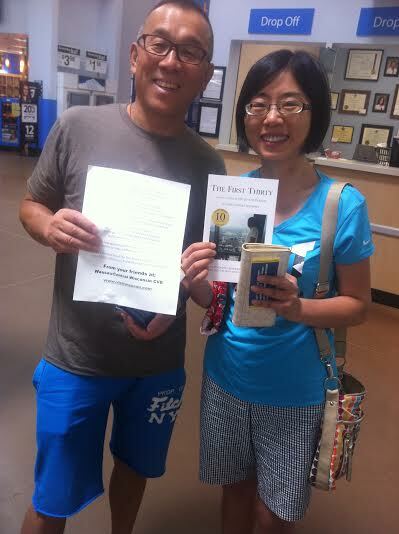 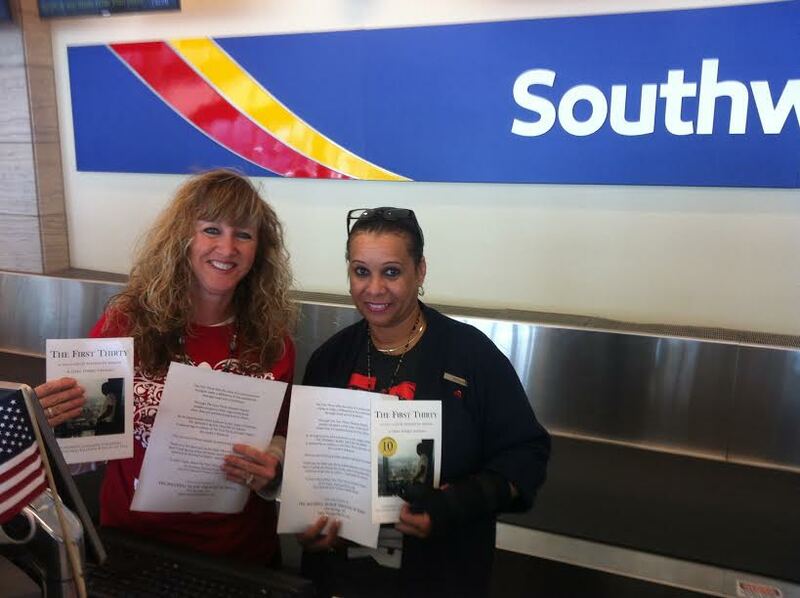 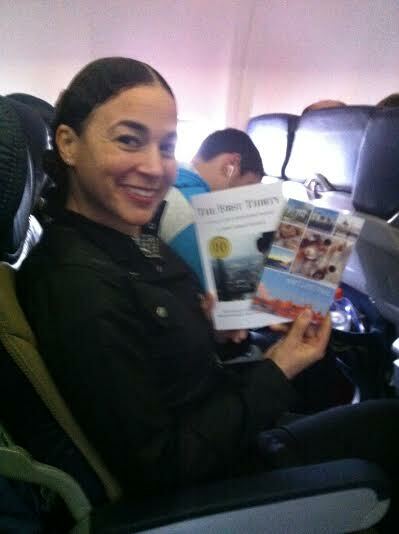 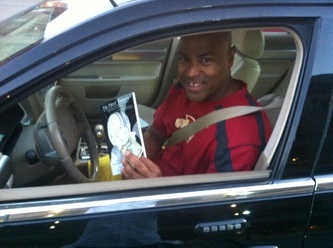 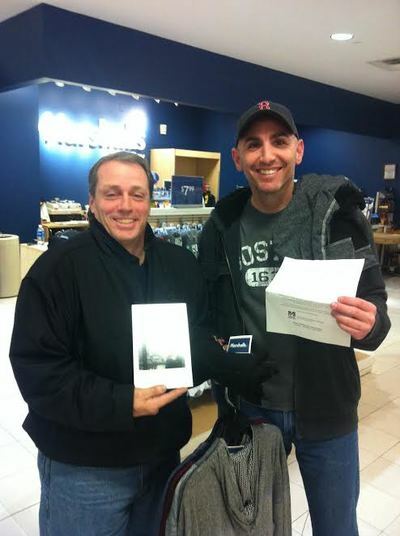 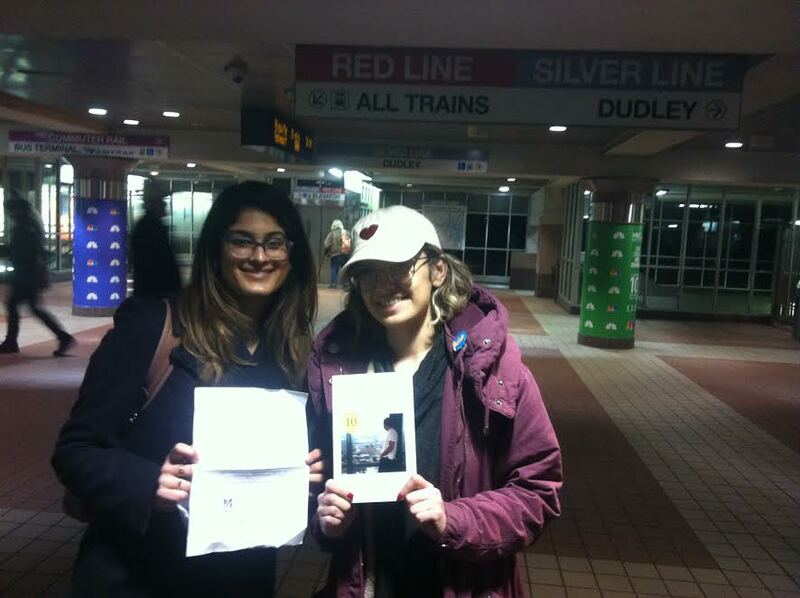 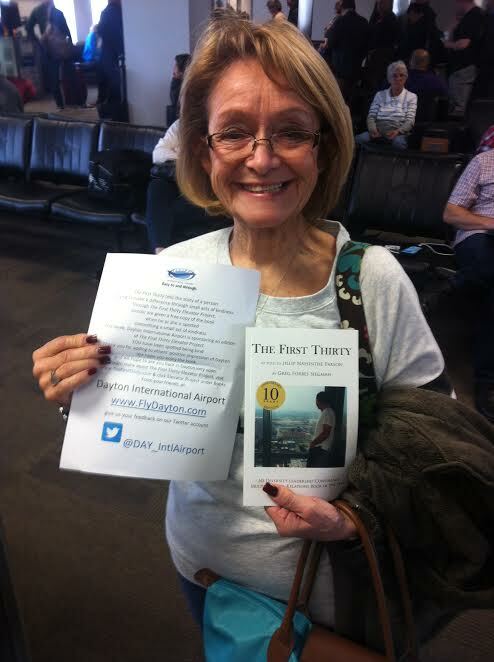 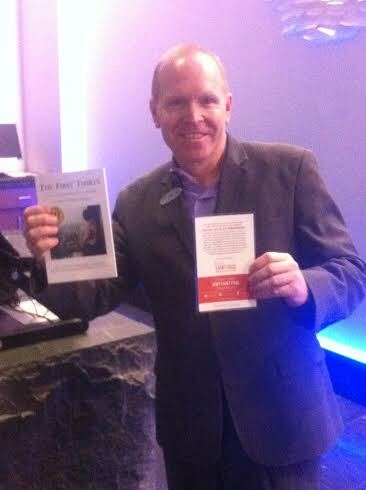 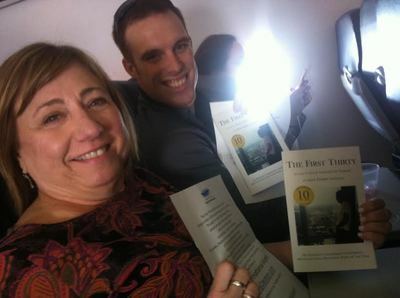 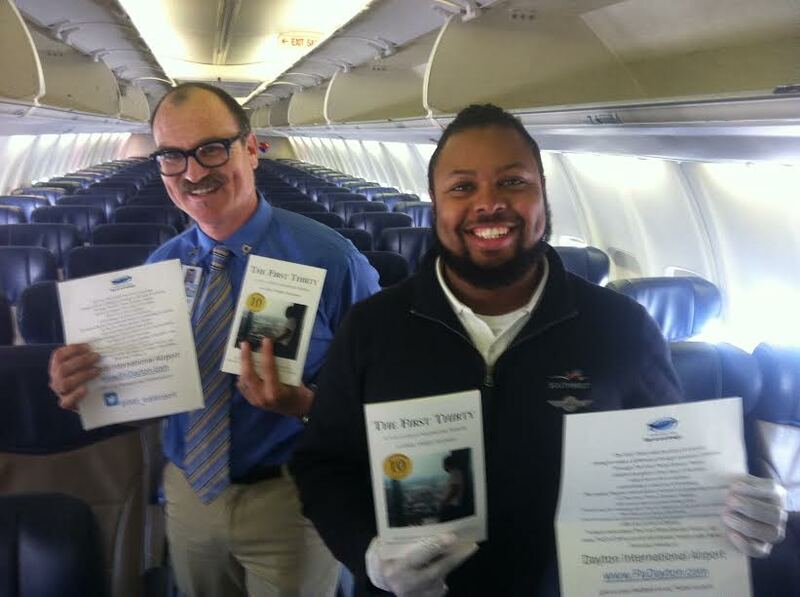 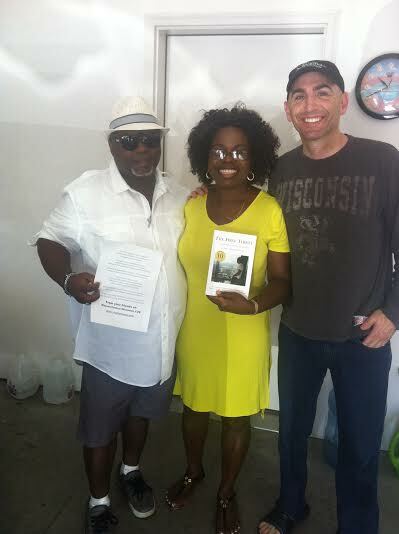 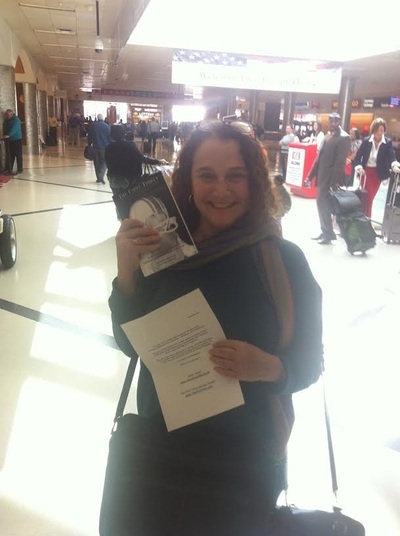 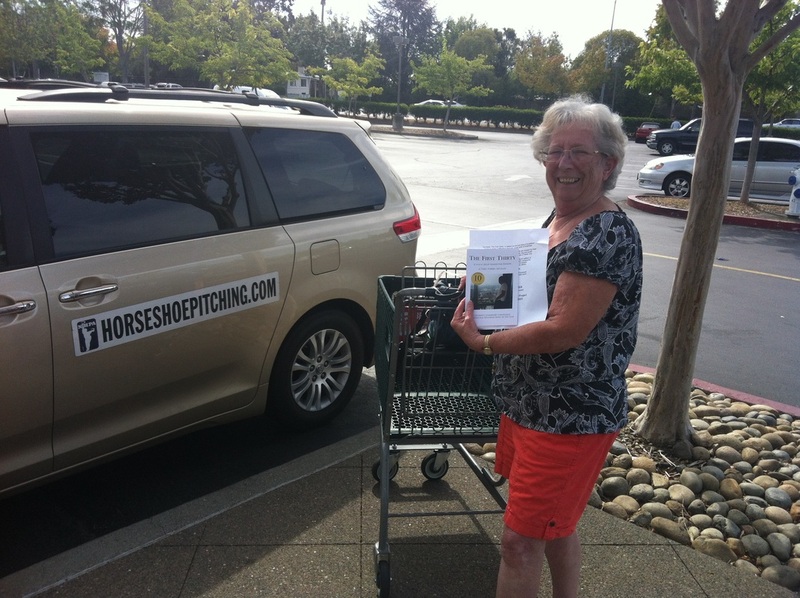 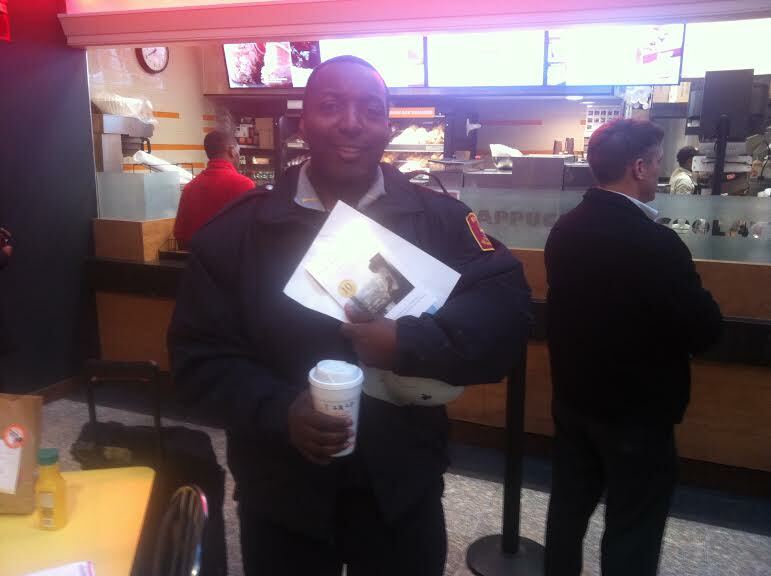 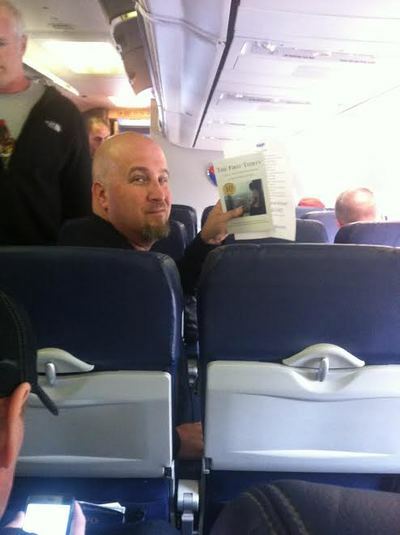 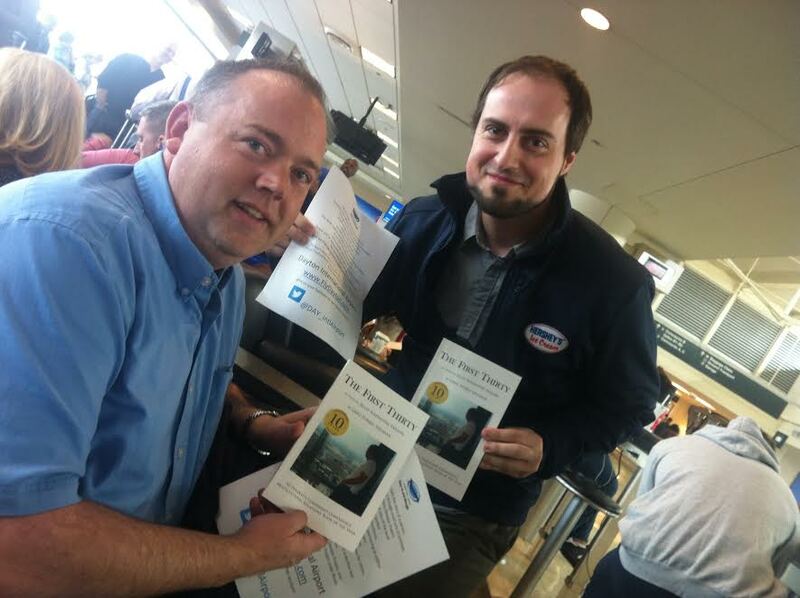 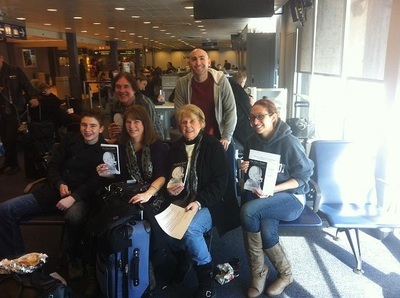 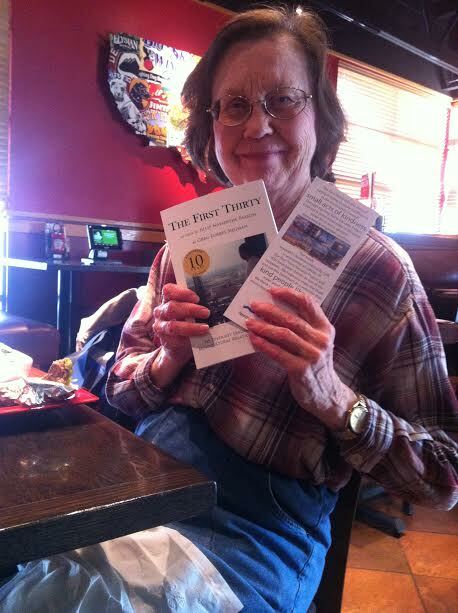 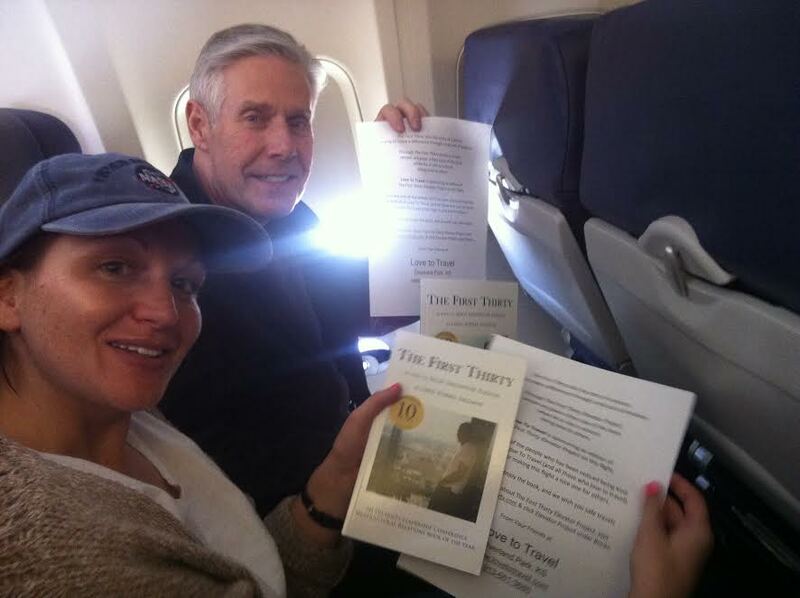 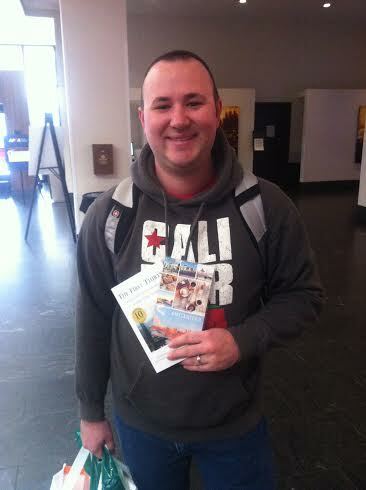 Passengers & crew who were spotted being kind to others received copies of the book. 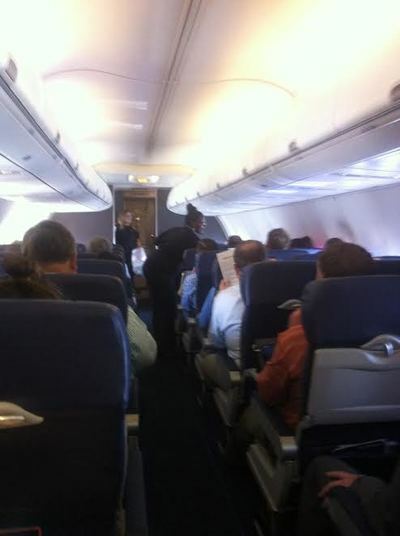 Visit Pittsburgh did the same thing for a flight to Pittsburgh. 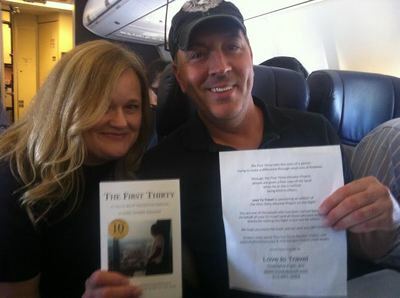 Love To Travel sponsored the project on a flight to Kansas City. 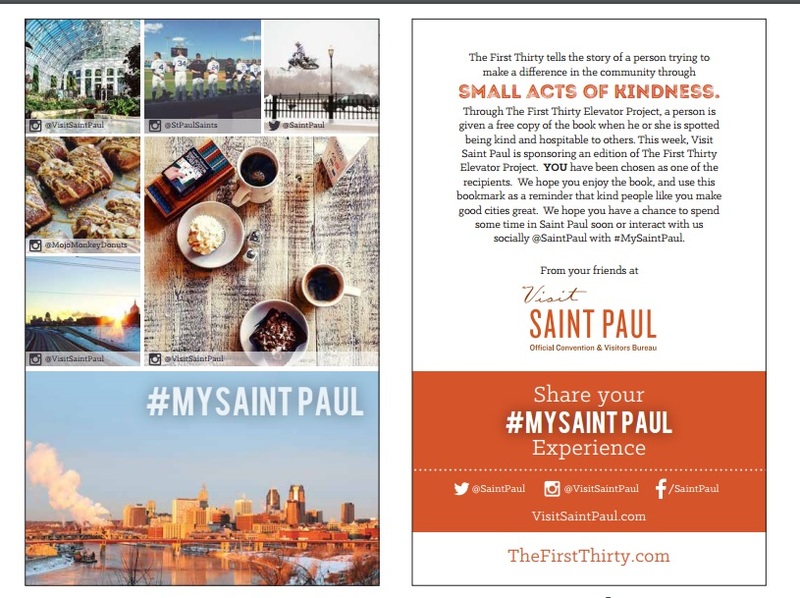 Visit Saint Paul, Sand Springs Community Services, Inc.; Quad Cities Convention & Visitors Bureau, Greater Renton Area Chamber of Commerce, Visit Wichita, Sun Prairie Chamber of Commerce, Midland Care, Think Iowa City, Boston Cares, Greater Green Bay Chamber of Commerce, First Farmers State Bank, Hand-in-Hand, Visit Santa Rosa, Hill Country Crisis Council, Lexington Convention & Visitors Bureau (visitLEX), McDonald's, Radisson Hotel Madison, The Spotted Cow, The Maxwell Blade Theatre of Magic, Visit Beloit, The Longwood Apartments, Greater Des Moines Convention & Visitors Bureau, Wisconsin Humane Society, Rockford Area Convention & Visitors Bureau (Go Rockford), Generations Against Bullying, Uptown Normal, Real Racine, Texas Restaurant Association, Rosie's Birthday Club and Sebastopol Chamber of Commerce & Visitor Center have ordered copies of The Silhouette Man or The First Thirty to be given to visitors &/or locals who showed kindness to others in their respective communities, cities and states around North America. 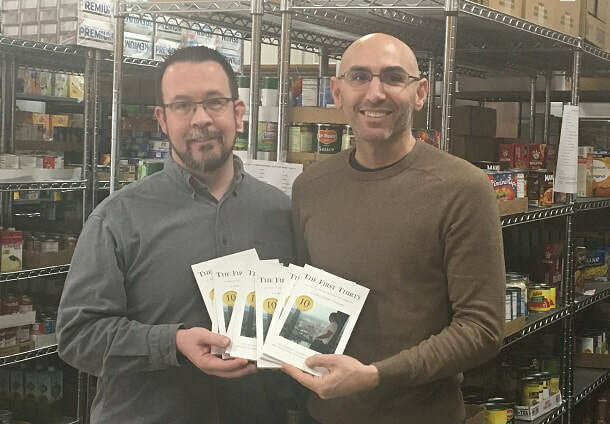 With each book, the recipient typically receives a copy of a note from the sponsor of that particular edition of the project. 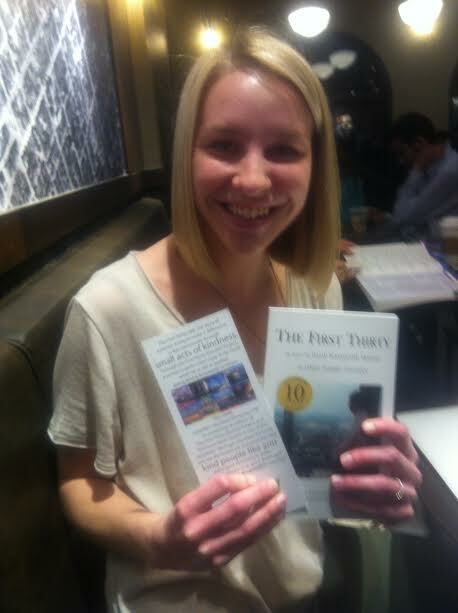 Every so often, a sponsor goes a step further and creates a bookmark for the occasion. 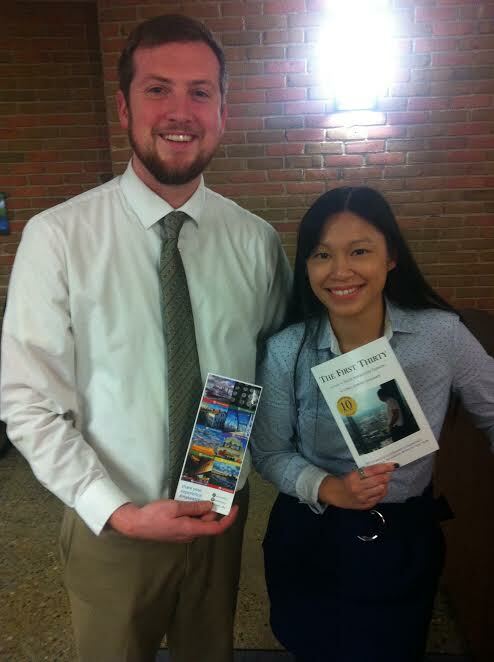 Here are some examples of those bookmarks. "...My life's mission has been to bring people together and when I read this book, it gave me tons of ideas for how to do so....[It is a book] which speaks to folks of all ages." 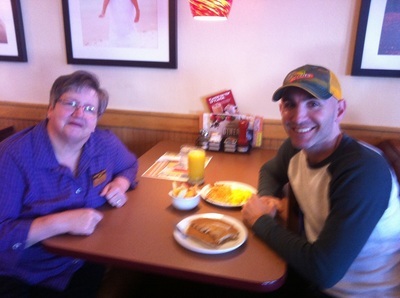 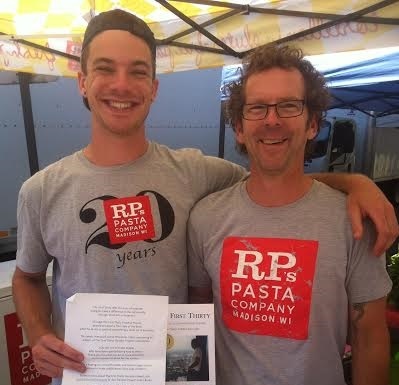 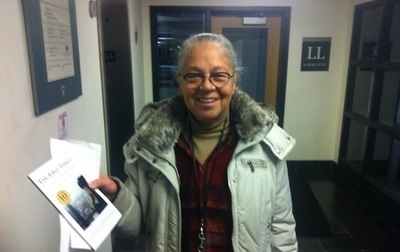 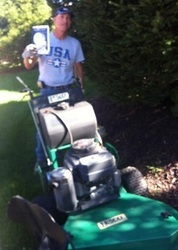 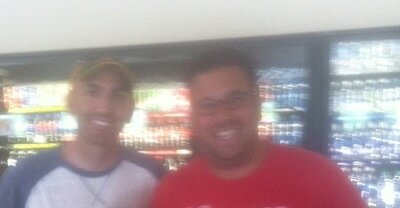 "Thank you for the recaps and pictures too. And most importantly, thank you for what you do, and doing it in our community! What great impressions you have left on so many...Thanks again for making a huge difference across America! 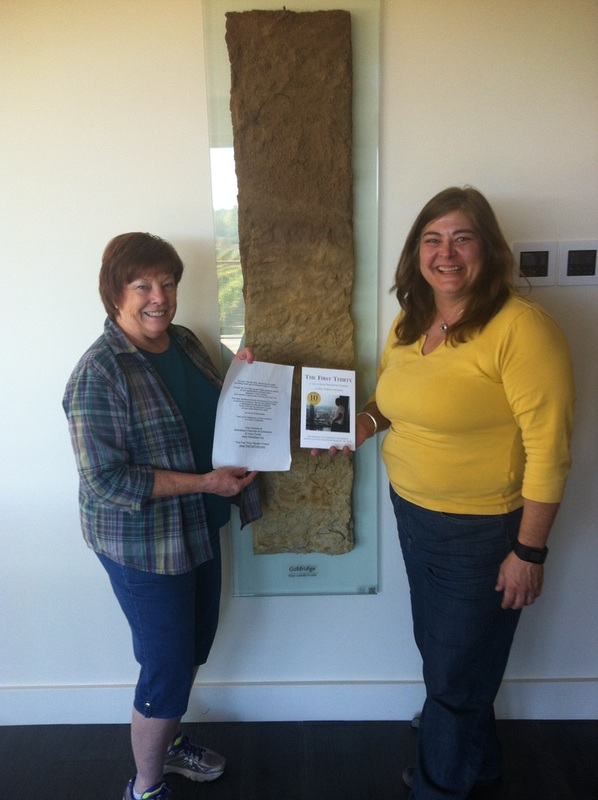 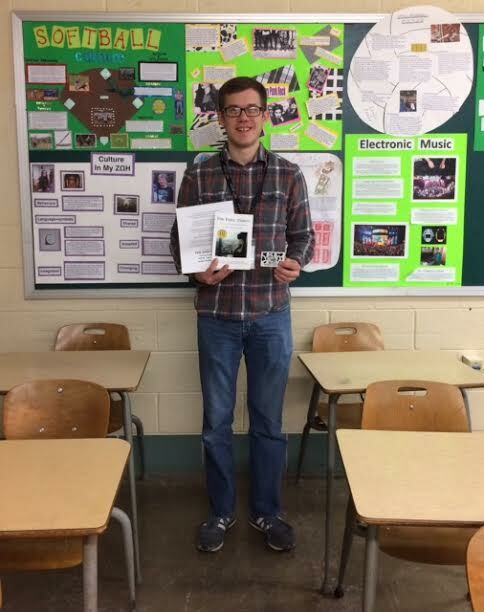 "It is definitely a surprise to me that [I was chosen] as a recipient for the book, but the gesture made my day a little brighter. 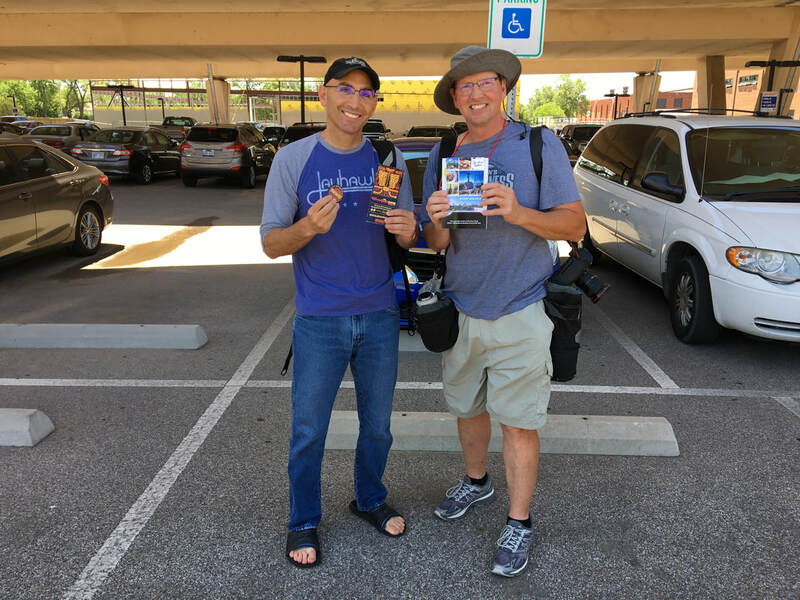 I firmly believe one kind smile can make a difference in someone’s life & I’m glad that yesterday I was able to help [a visitor] feel comfortable in our city...."
"Thank you for reminding me that random acts of kindness happen everyday. 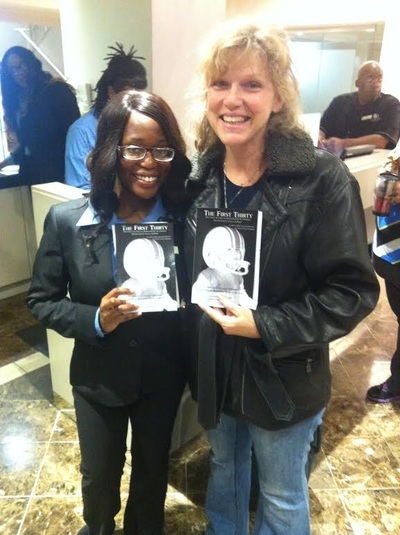 Simply saying HI or smiling at a stranger can have a huge impact on someone's day." 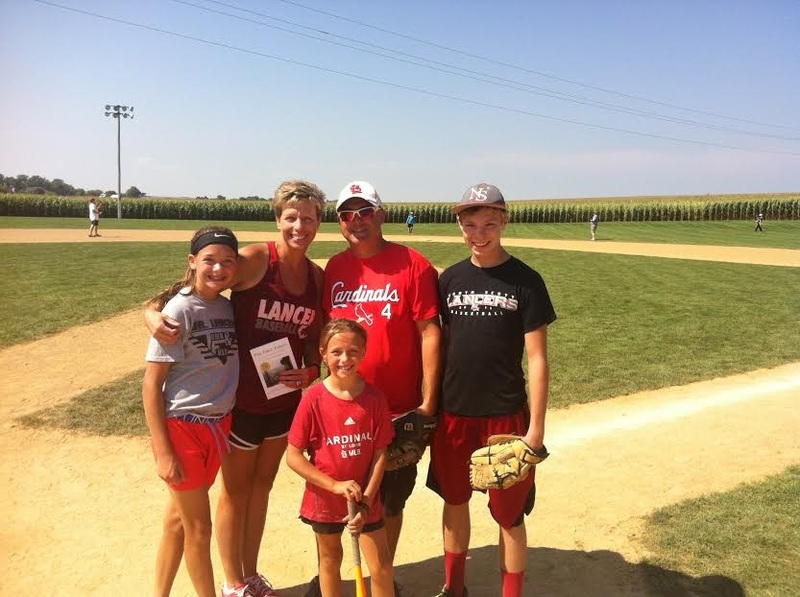 "...my Mom has been diagnosed with... 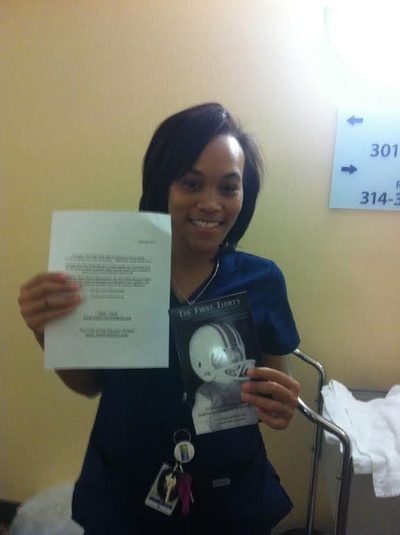 cancer....I read her [parts of the book] while sitting with her in the hospital....Through a really tough time, the book was...uplifting..."
"I [work at a store. 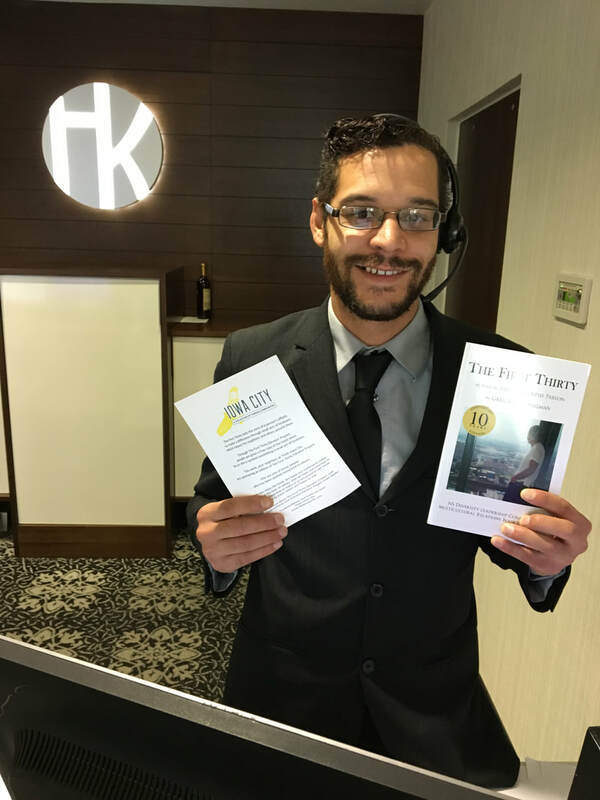 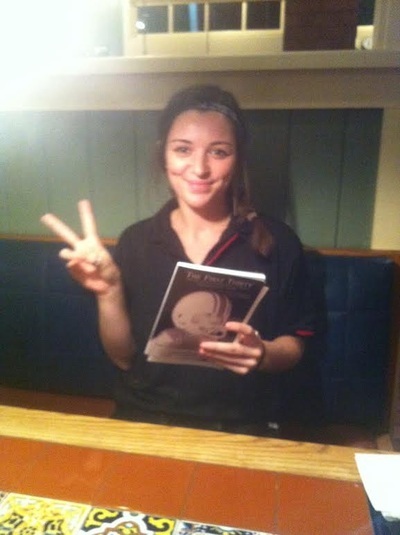 I help customers who come in the door]. 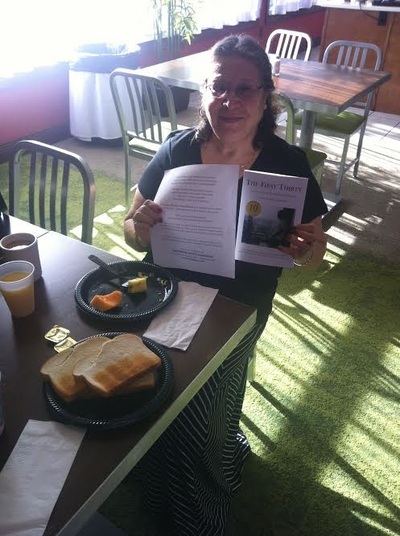 I want to believe with my daily job I am a humanitarian & a believer in rightness of people....this story was just what I needed to remind me that I can do anything...At one point [when I was reading the book], I was [eating a sandwich] and tears fell into my sandwich, before I knew I was crying...Everyone comes into your life for a reason & [this book] came into mine to show me I'm on the right track, don't stop believing in people, learn from the mistakes you make, & keep striving till what you dream or imagine is accomplished...I will cherish this book forever." 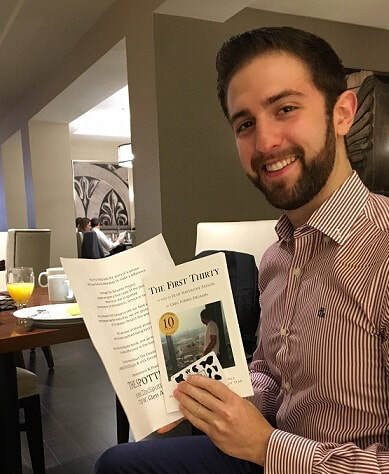 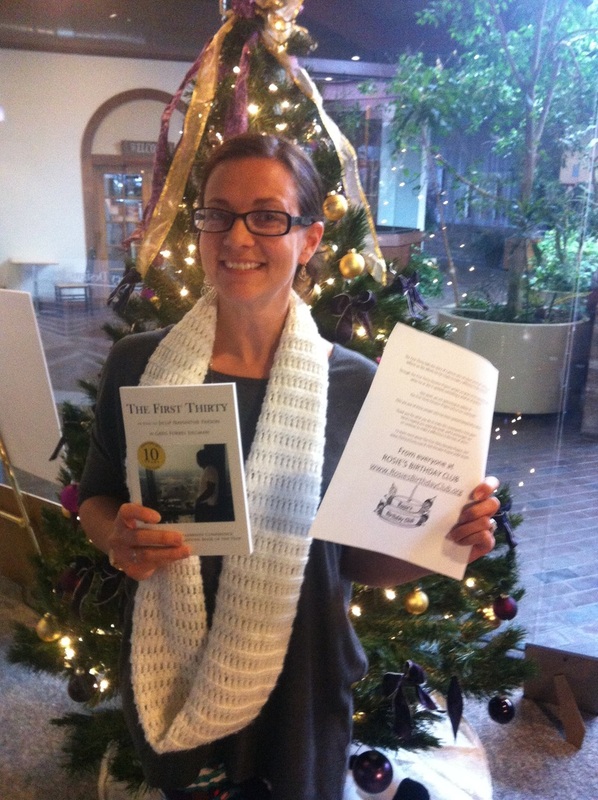 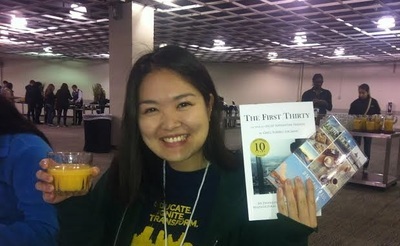 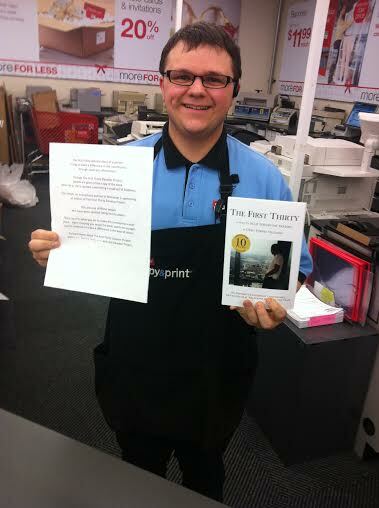 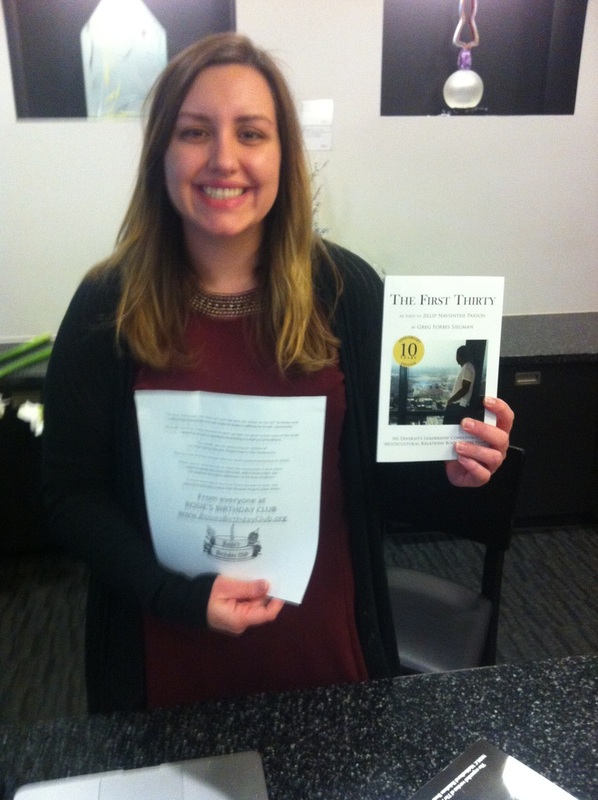 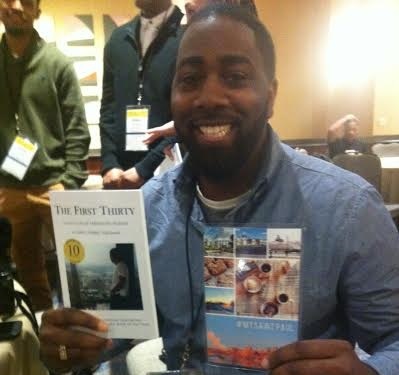 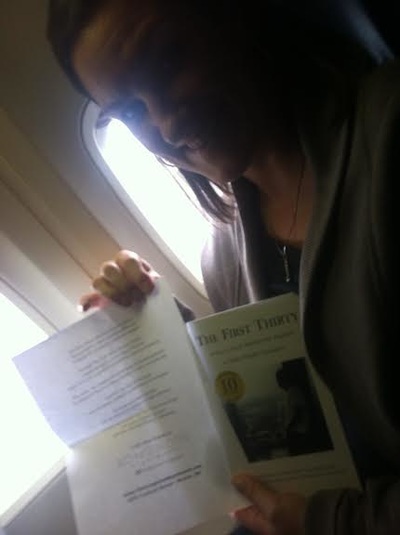 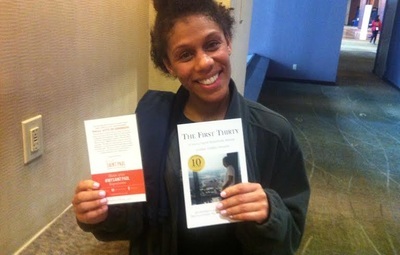 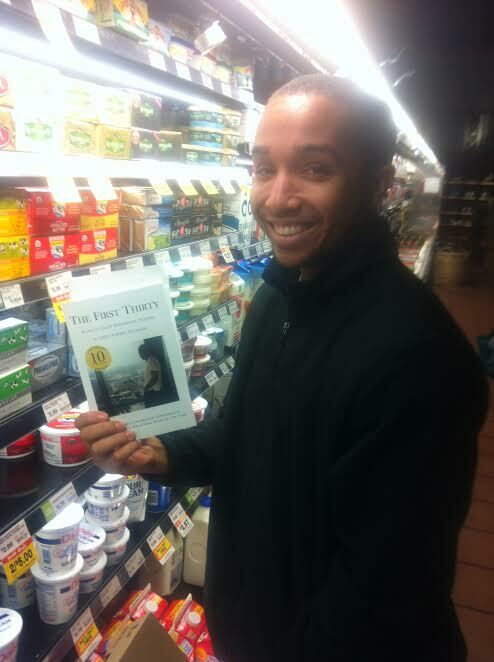 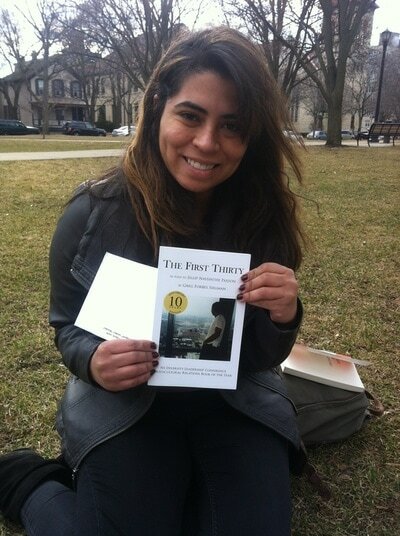 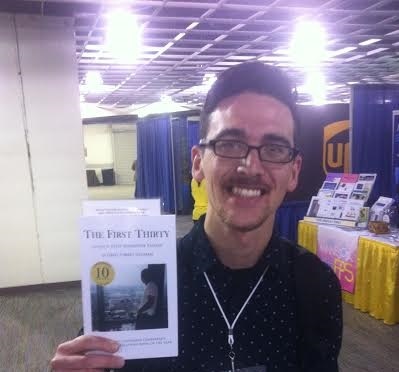 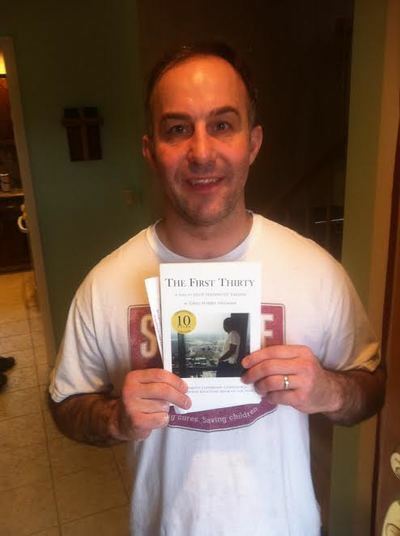 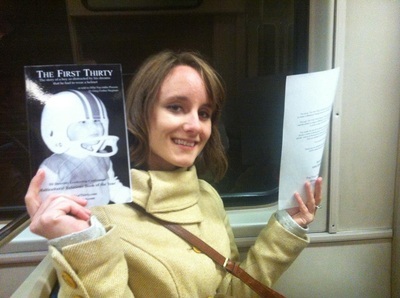 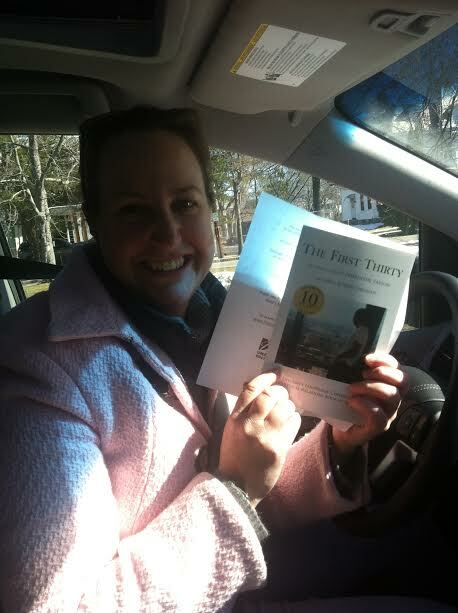 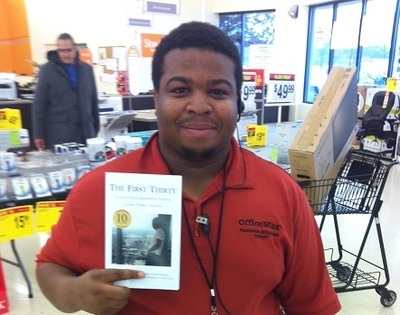 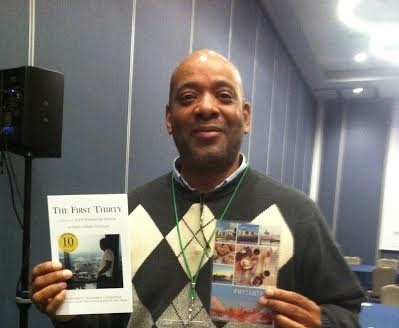 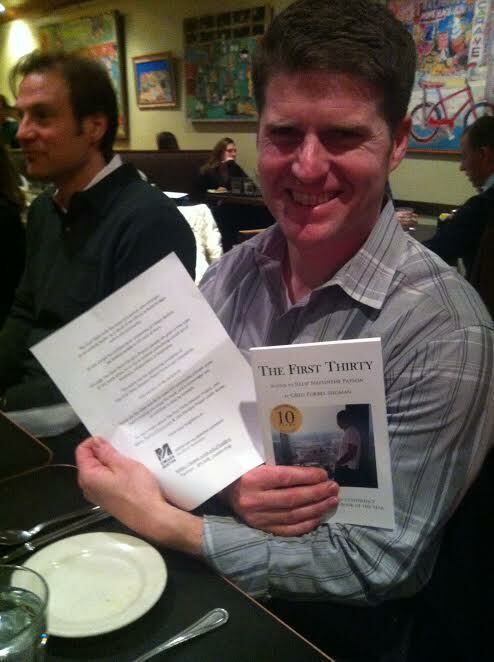 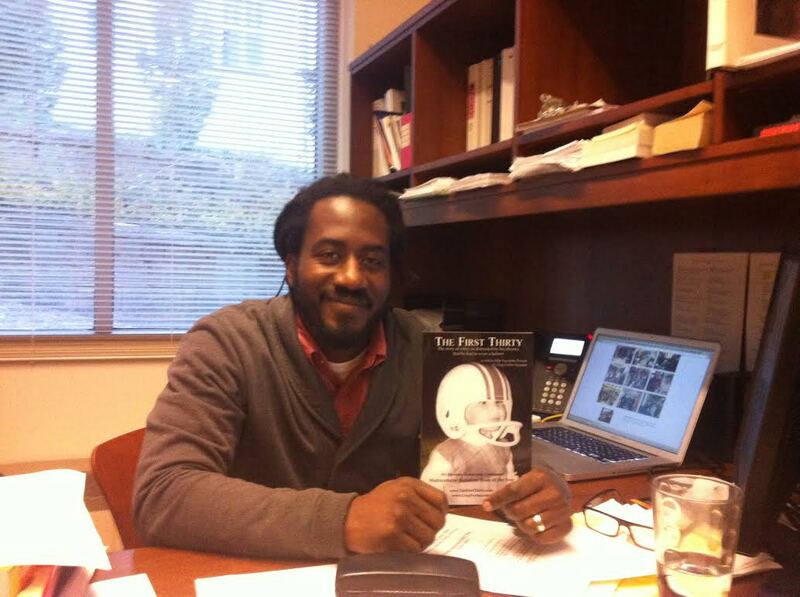 Want to get a copy of The First Thirty for yourself or as a gift for someone else? (The First Thirty is for anyone, middle-school aged through grandparents) Click here. 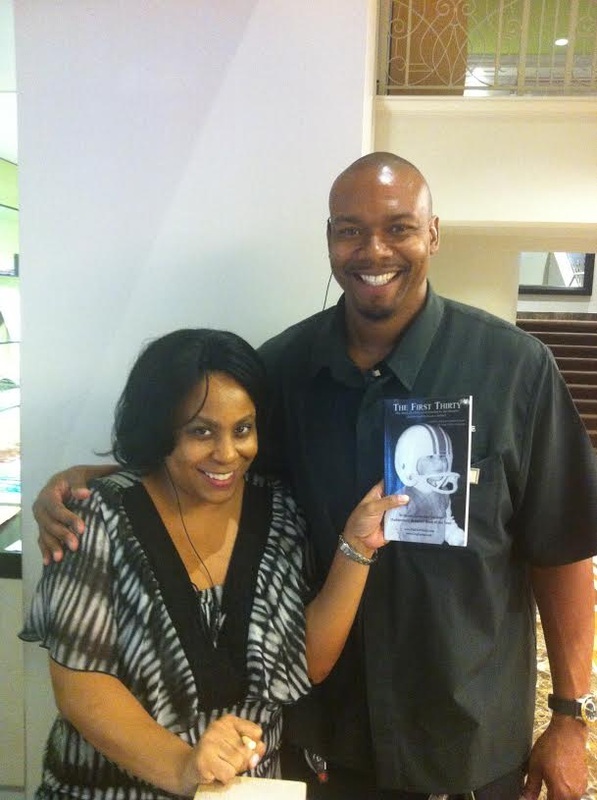 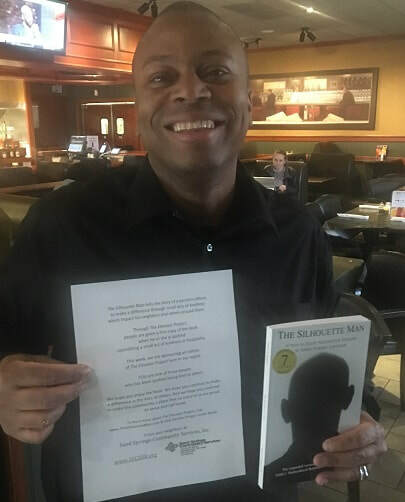 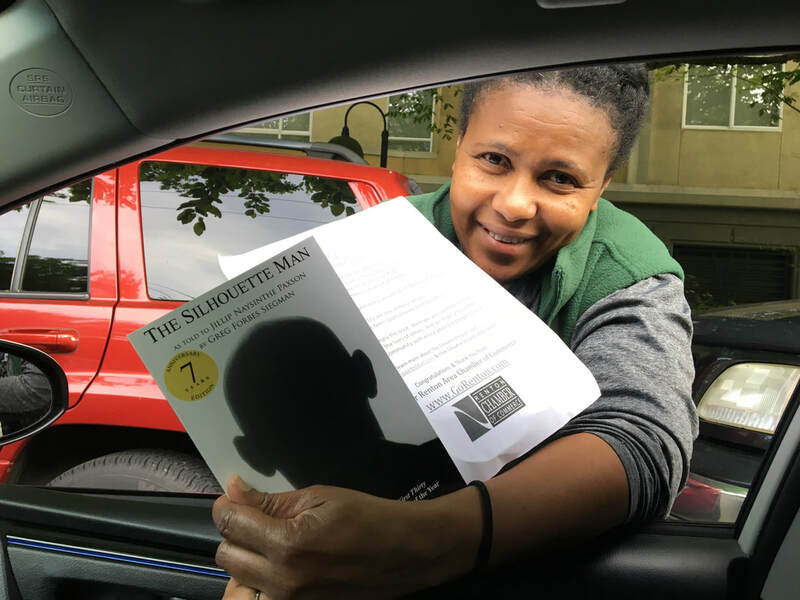 Want to get a copy of The Silhouette Man (expanded edition of The First Thirty) for yourself or as a gift for someone? 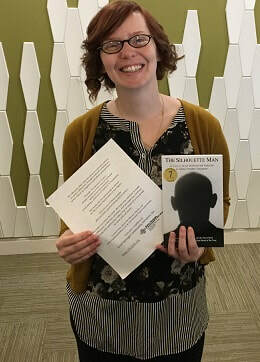 (The Silhouette Man is typically for adult-reading level). Click here. Do you (individually), or does your school / team / club / organization / company, want to sponsor another edition of The Elevator Project? 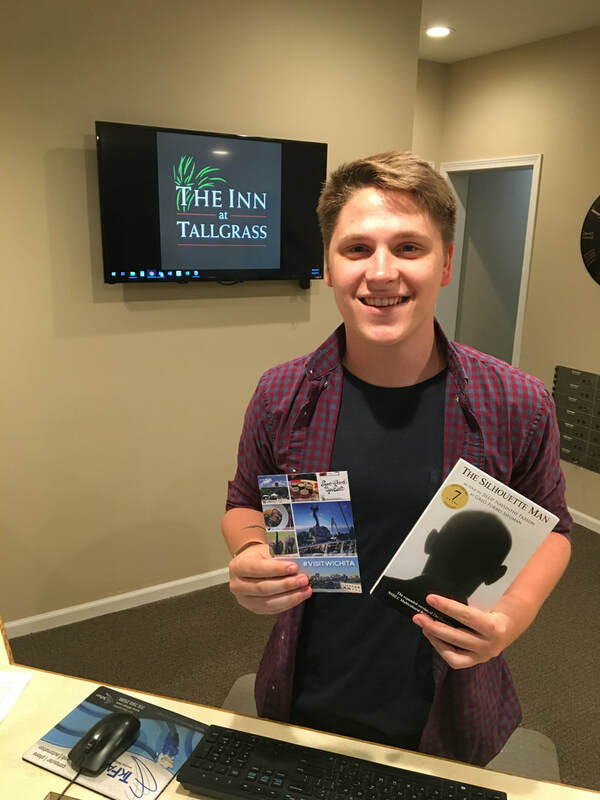 Please contact us here.